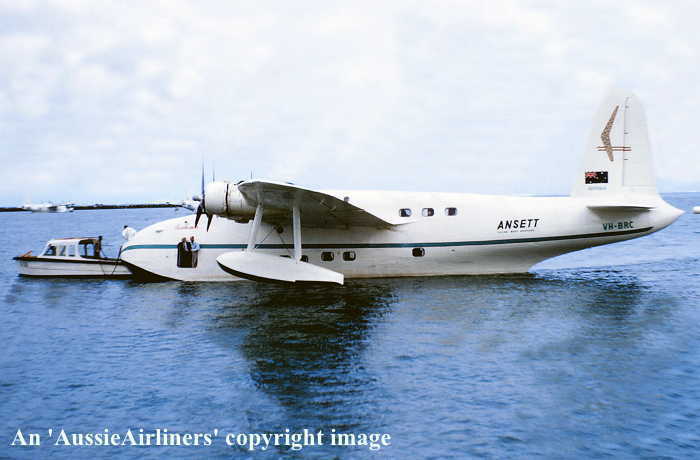 ZK-AMH. 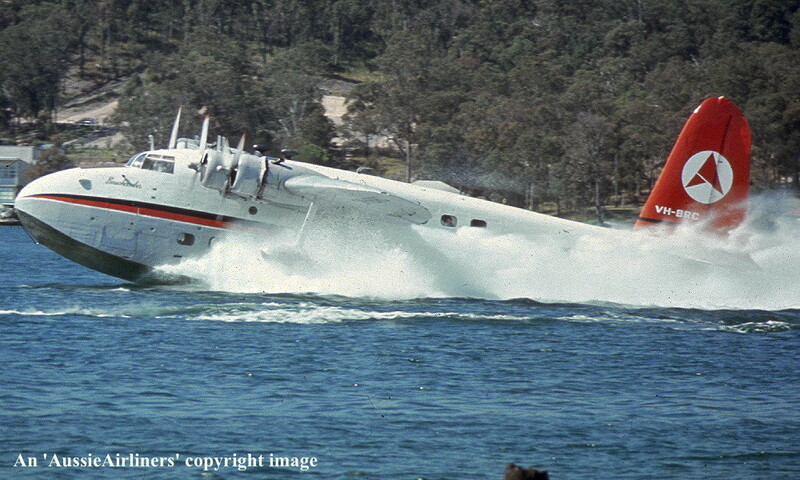 Short S-25 Sandringham Mk 4 Tasman Class. 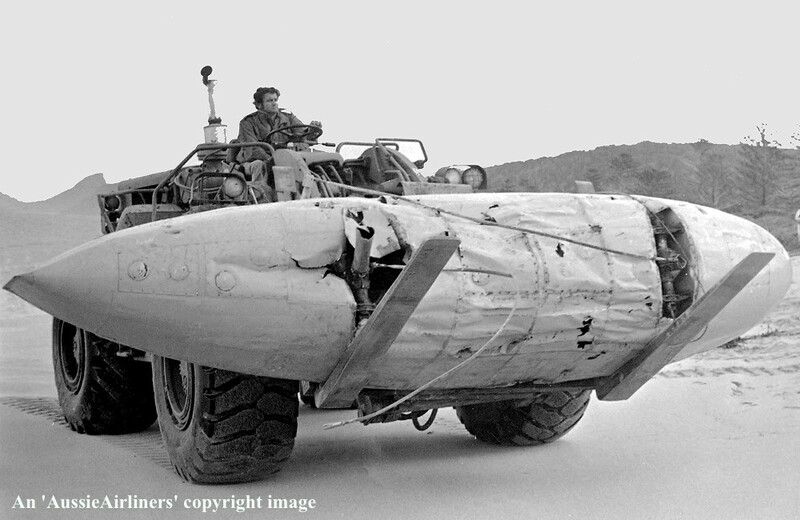 c/n 2018 - SH.55C. 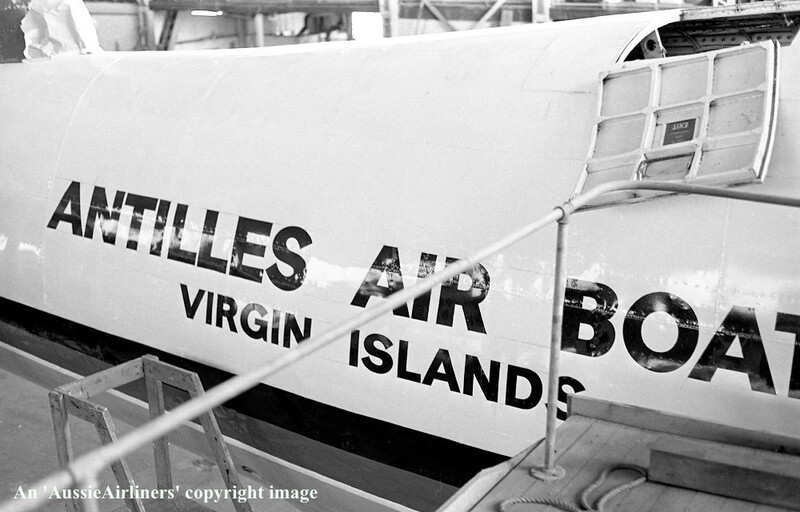 It was also registered as: VH-BRC. 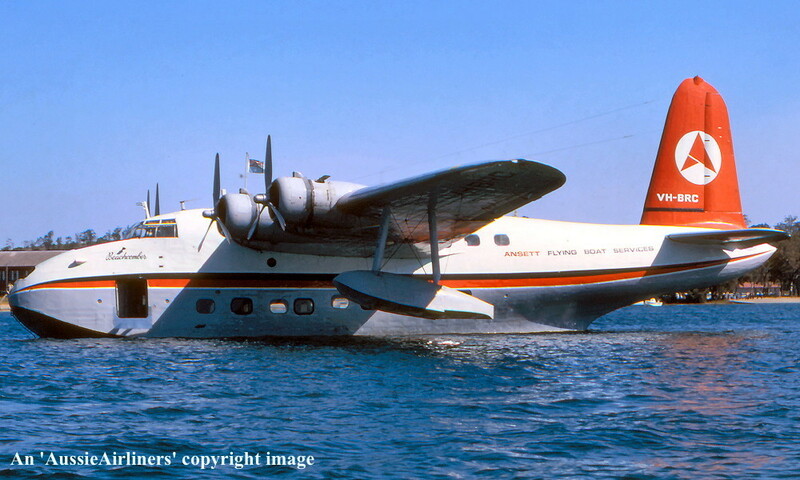 ZK-AMH. 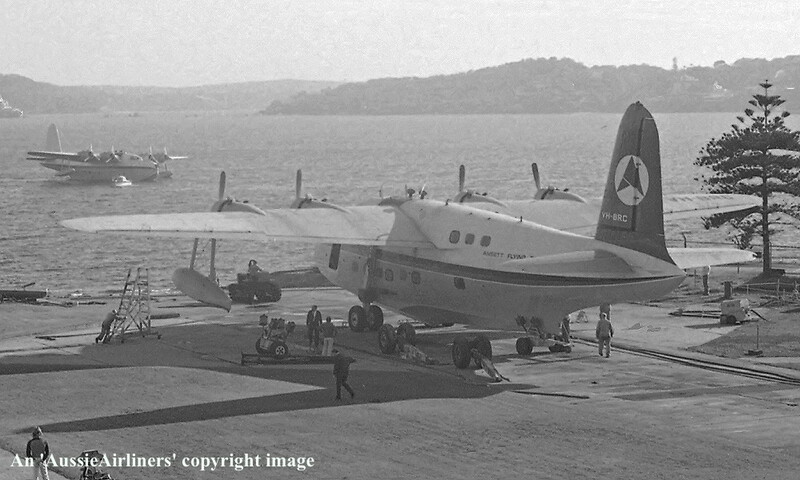 Tasman Empire Airways Ltd - 'RMA Auckland' in the original livery at Auckland Harbour, October 29, 1947. 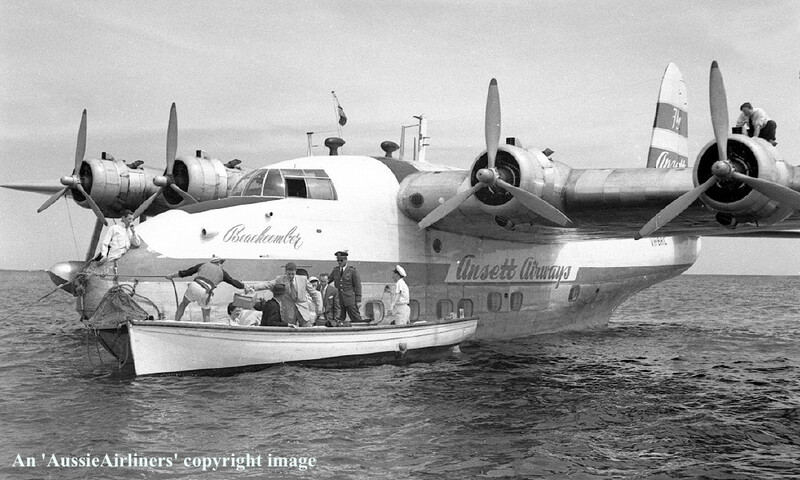 ZK-AMH. 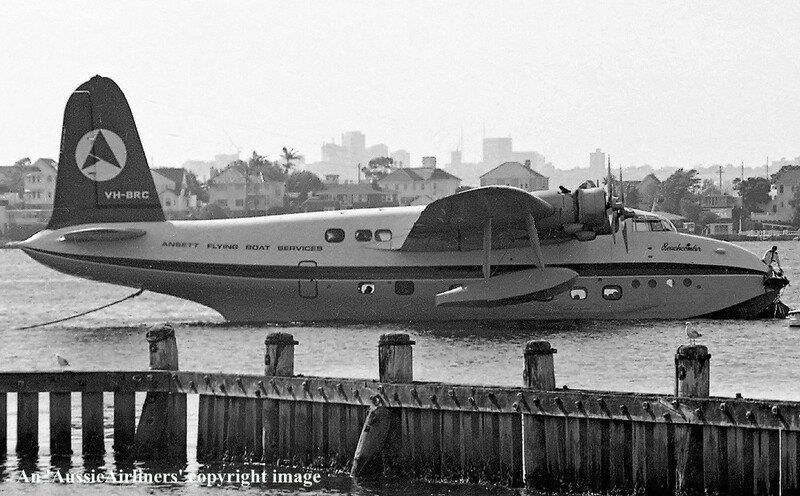 Tasman Empire Airways Ltd - 'RMA Auckland' in the original livery at Auckland Harbour, January 1948. 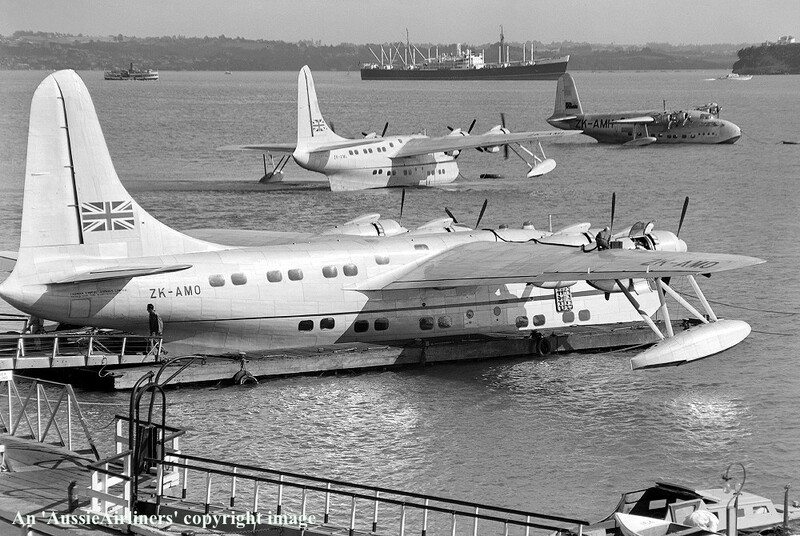 ZK-AMH. 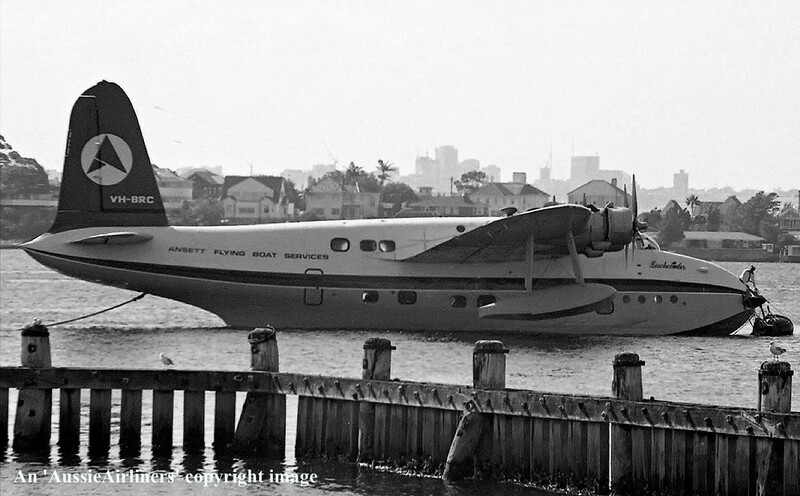 Tasman Empire Airways Ltd - 'RMA Auckland' in the original livery at Auckland Harbour, November 1948. 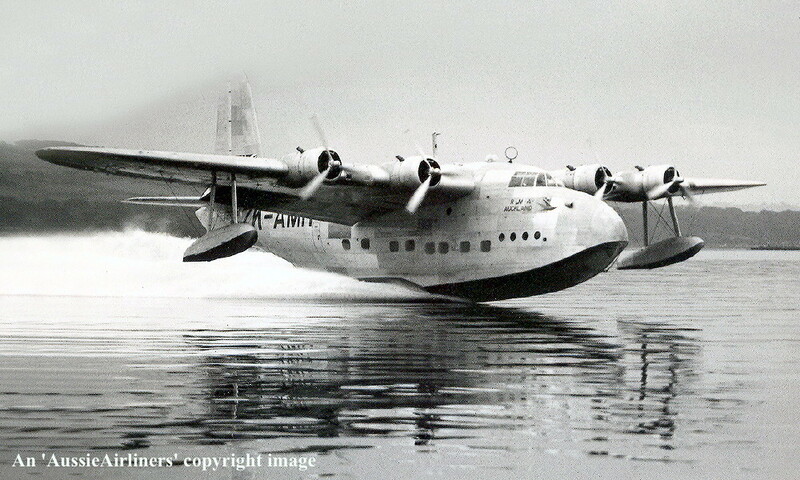 ZK-AMH. 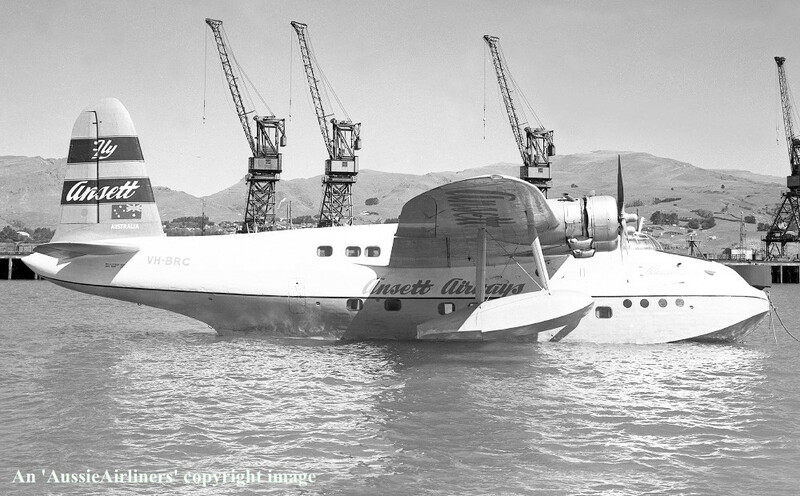 Tasman Empire Airways Ltd - 'RMA Auckland' in the original livery at Waitemata Harbour, Auckland, March 1950. 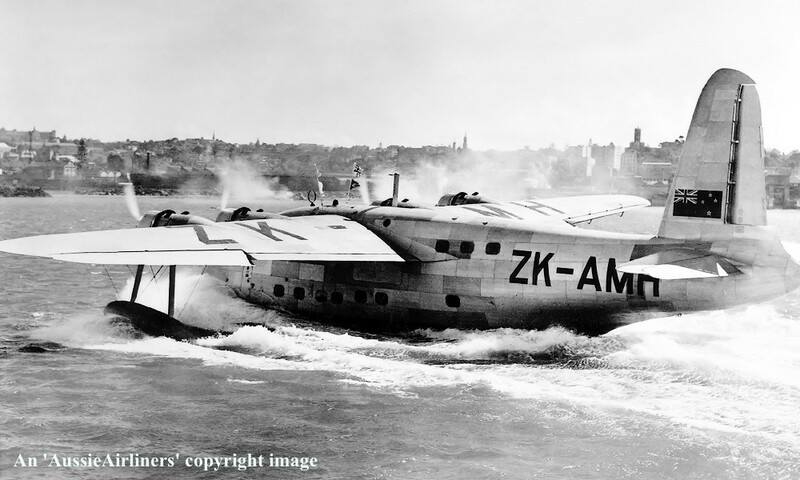 ZK-AMH. 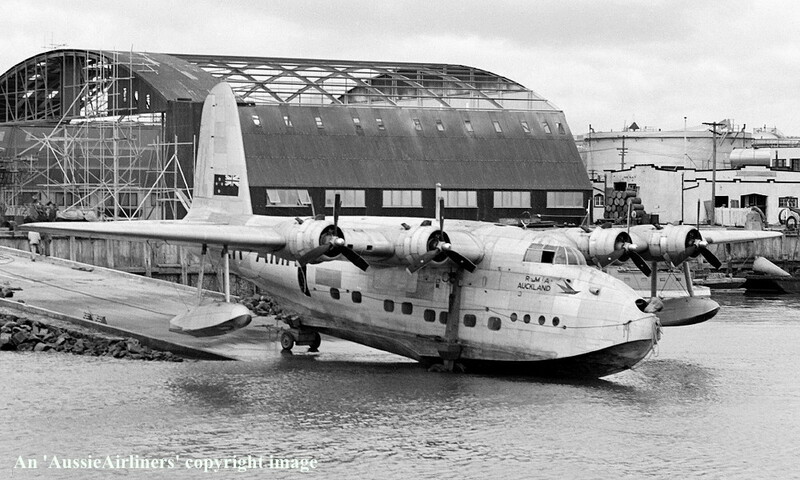 Tasman Empire Airways Ltd - 'RMA Auckland' in the original livery at Mechanics Bay, Auckland, March 1950. 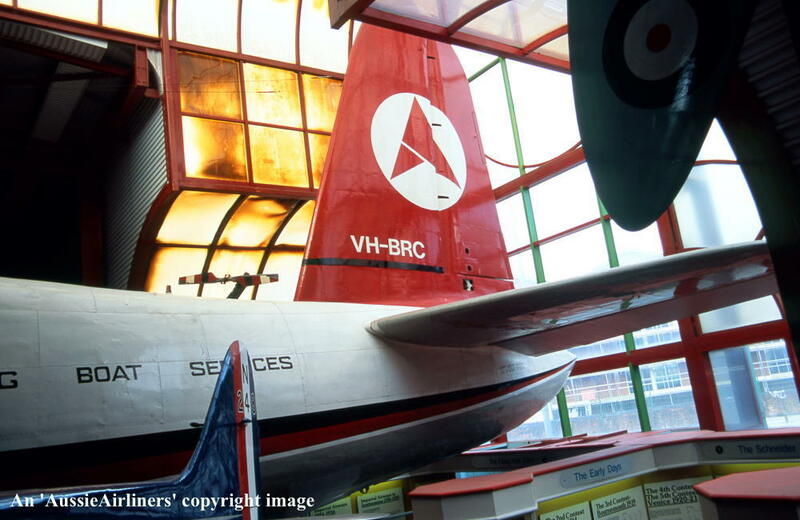 VH-BRC. 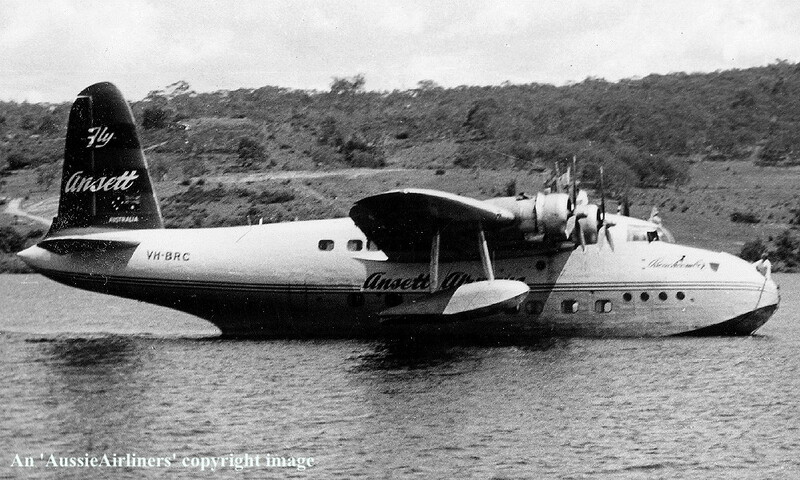 Ansett Flying Boat Services - 'Beachcomber' in the 'Barrier Reef' livery at Hayman Island, date unknown. 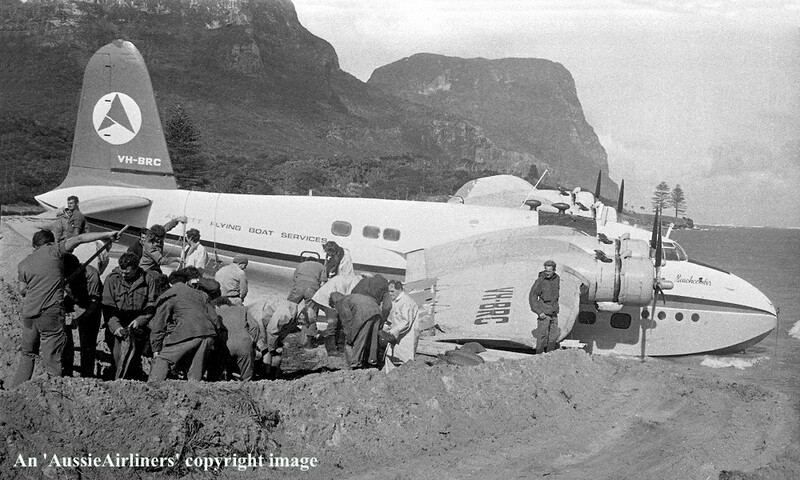 VH-BRC. 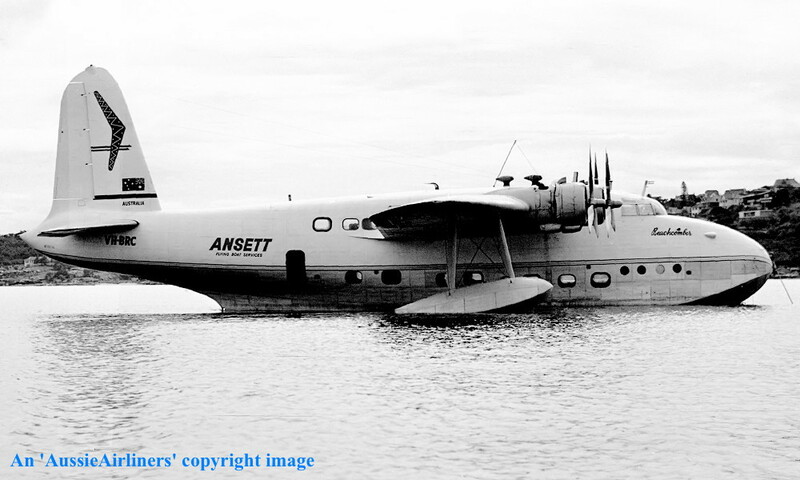 Ansett Flying Boat Services - 'Beachcomber' in the 'Barrier Reef' livery on the Brisbane River, date unknown. 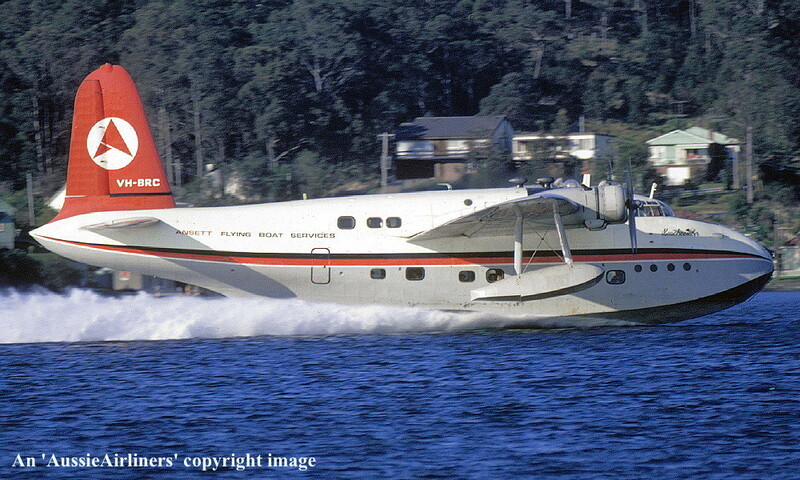 VH-BRC. 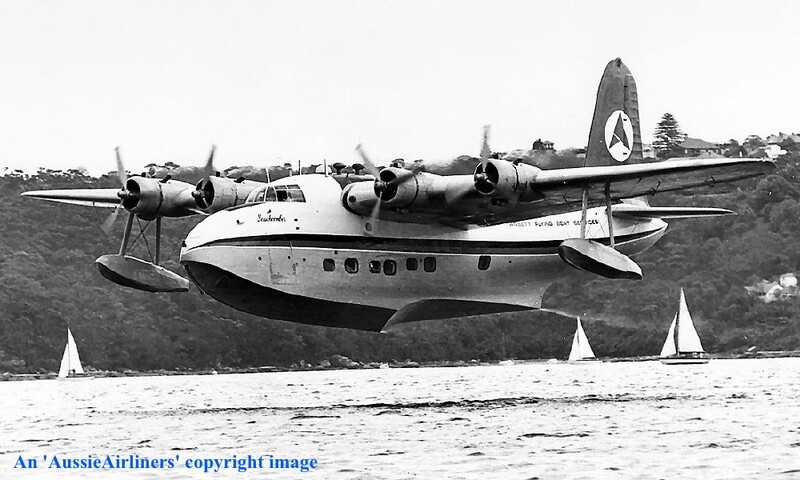 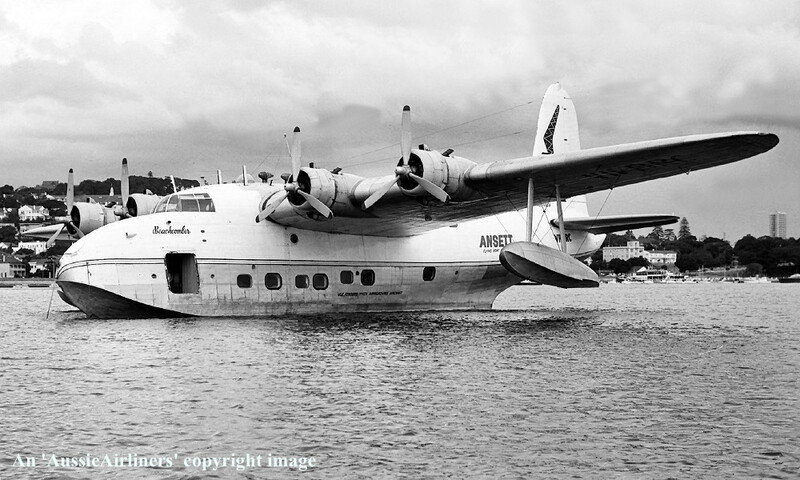 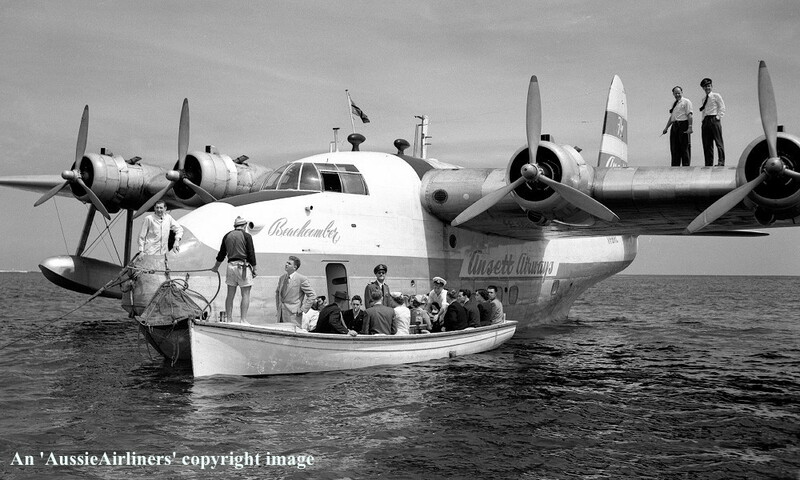 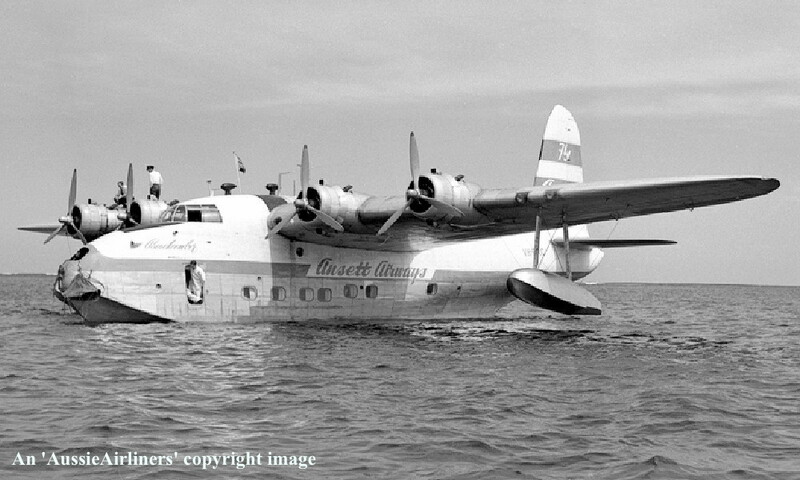 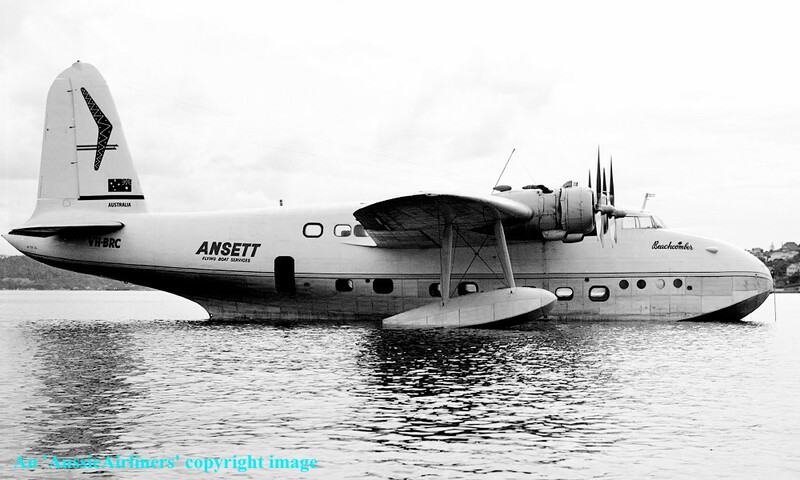 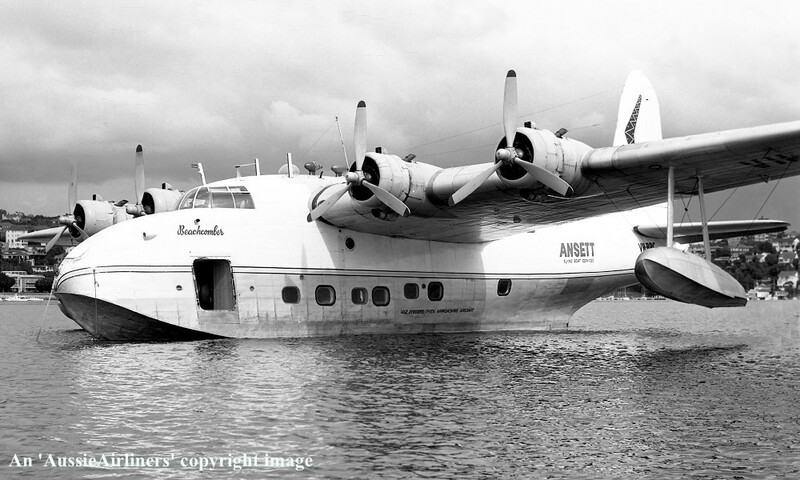 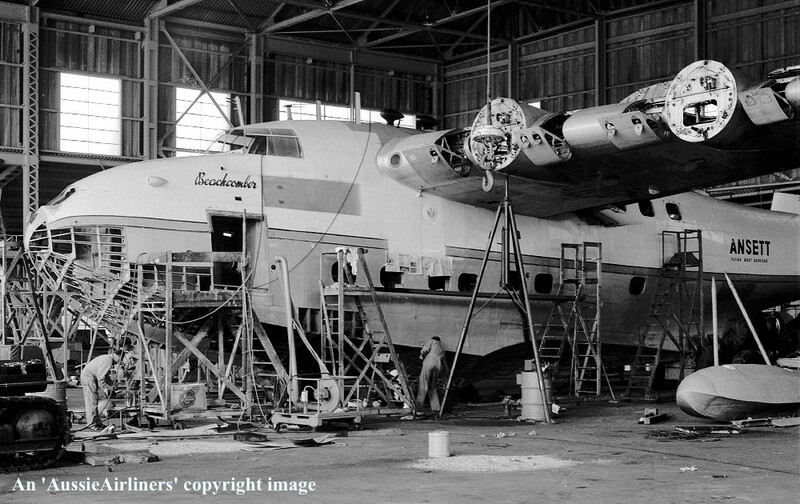 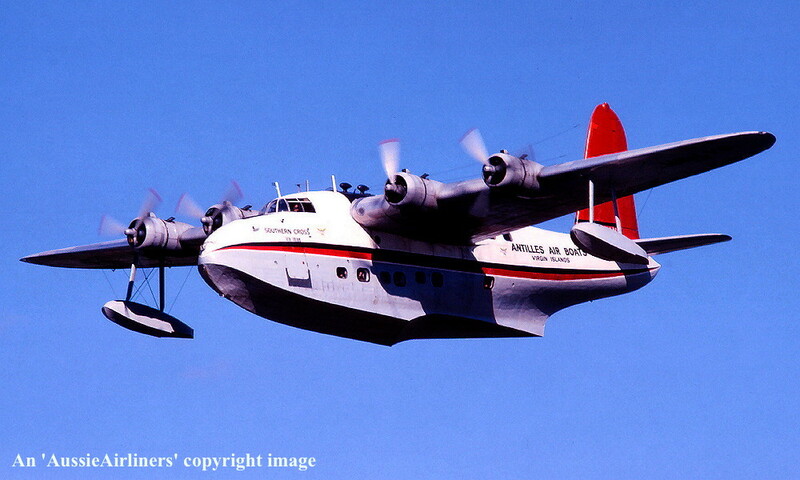 Ansett Flying Boat Services - 'Beachcomber' in the original 'white' livery at Rose Bay, Sydney, date unknown. 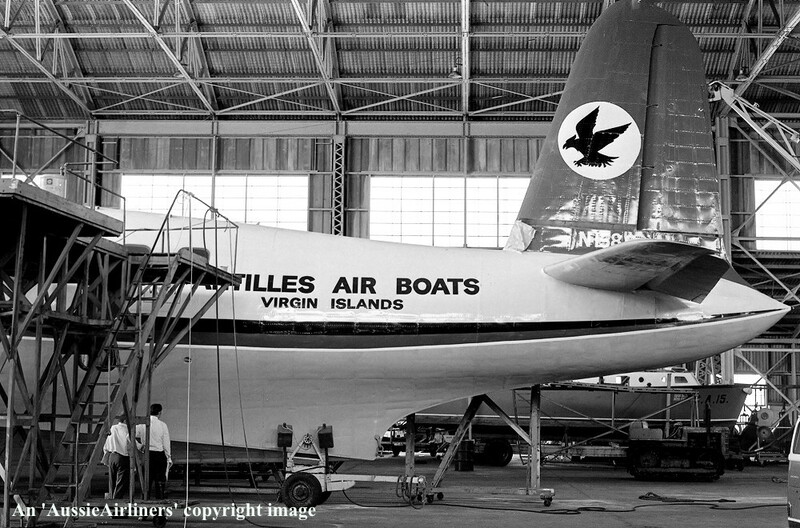 VH-BRC. 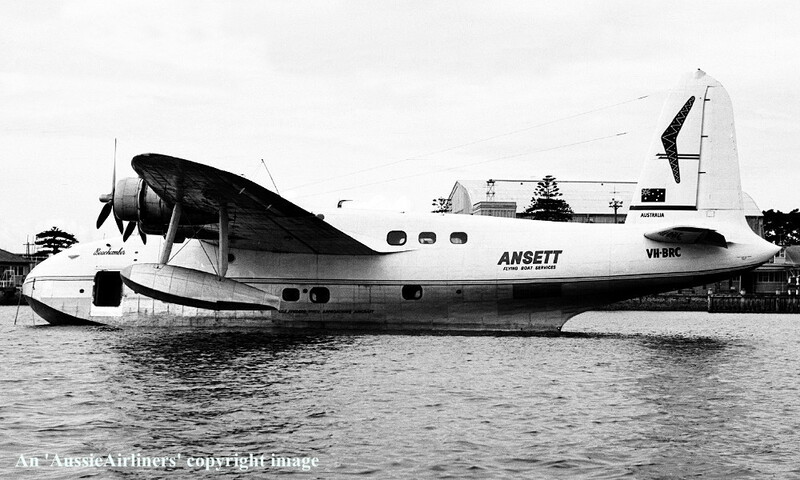 Ansett Airways - 'Beachcomber' in the original livery at Rose Bay, Sydney, date unknown. 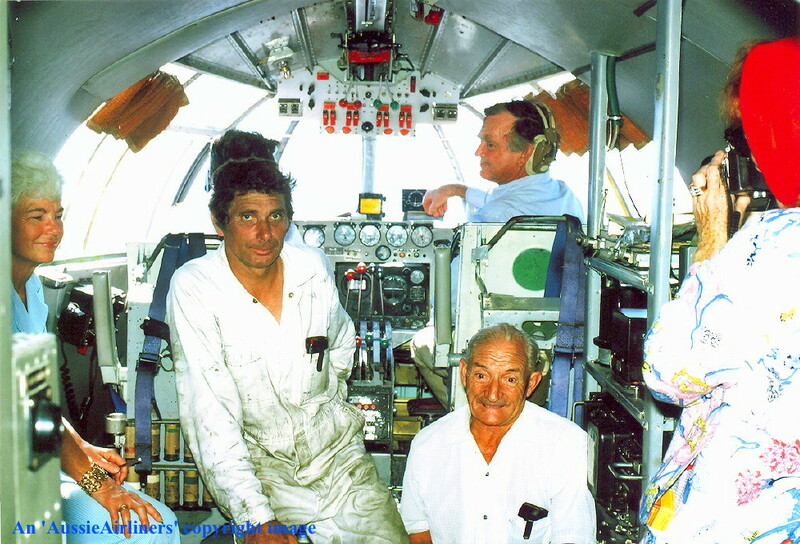 VH-BRC. 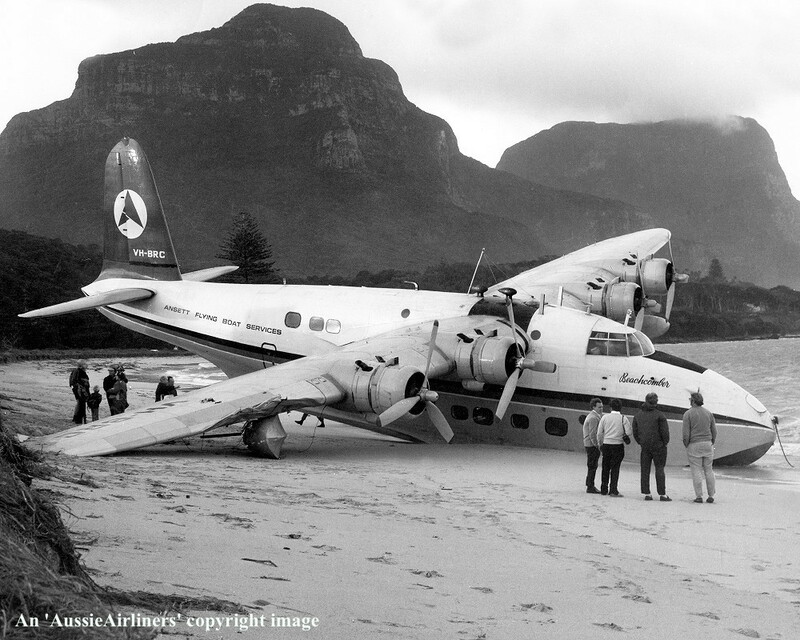 Ansett Airways - 'Beachcomber' in the original livery at Lord Howe Island, date unknown. 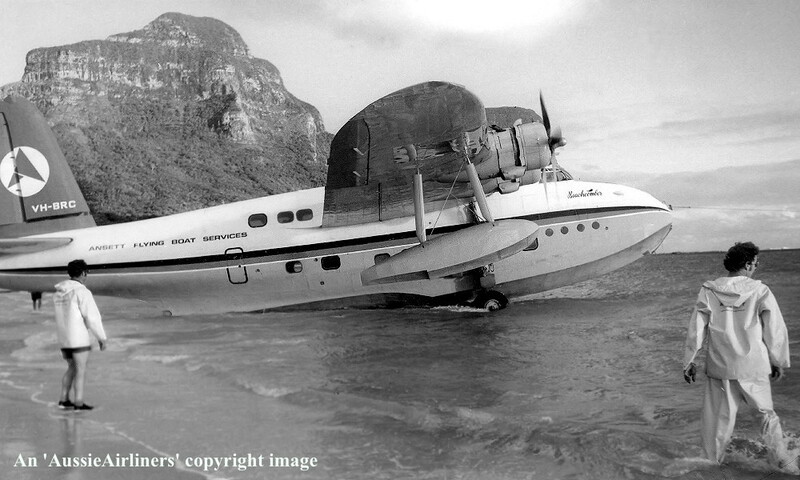 VH-BRC. 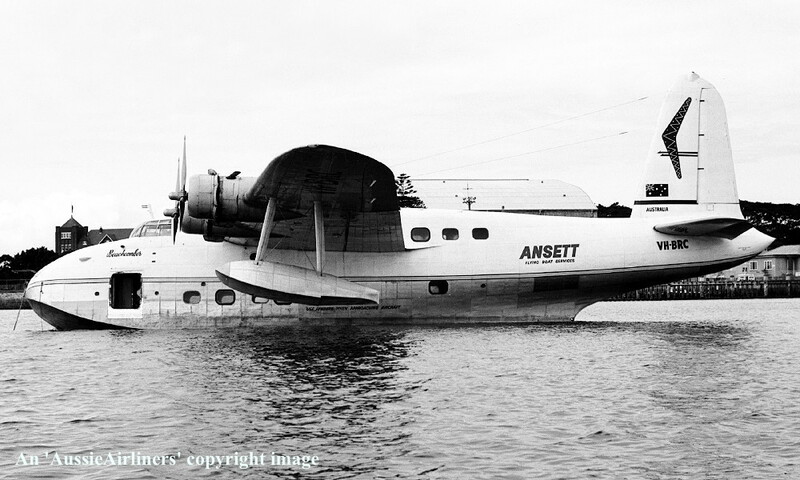 Ansett Airways - 'Beachcomber' in the original livery at Rose Bay, Sydney, March 07, 1954. 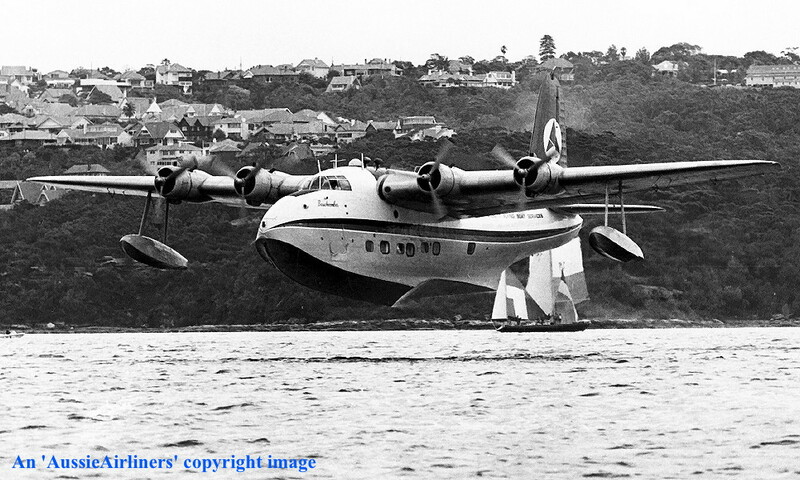 VH-BRC. 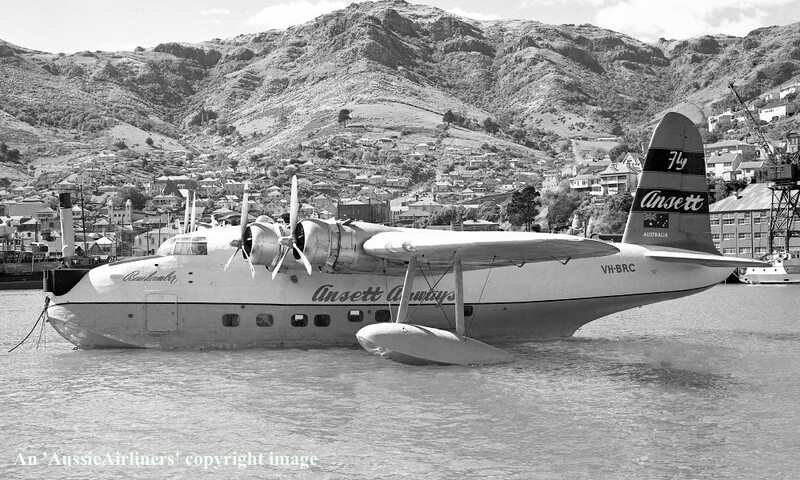 Ansett Airways - 'Beachcomber' in the revised livery at Port Lyttelton, Christchurch, November 1957. 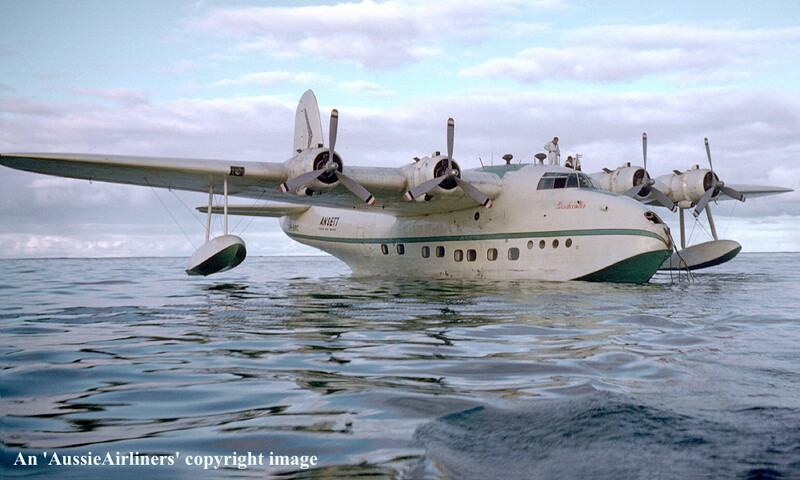 The aircraft has a large camera turret installed in the bow hatch for the filming of the 'Cinerama' movie. 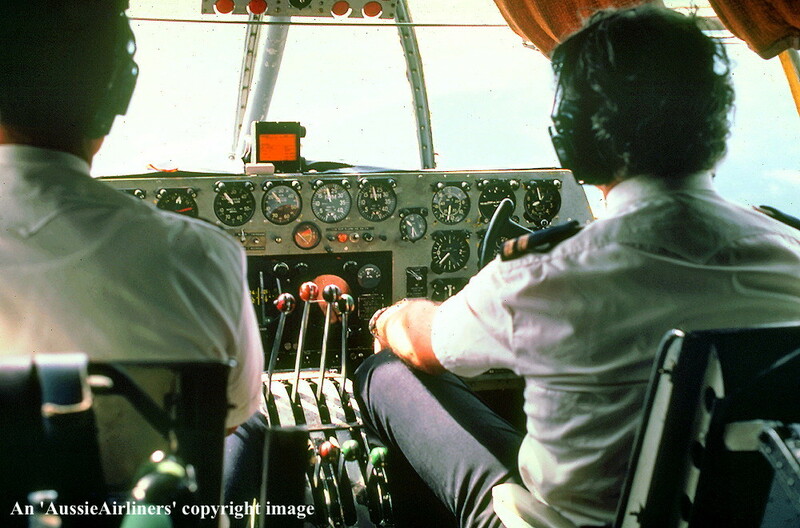 VH-BRC. 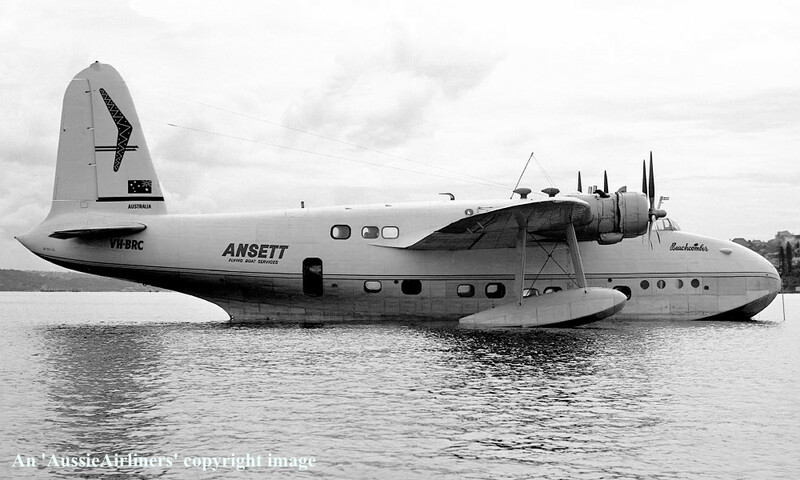 Ansett Airways - 'Beachcomber' in the revised livery on the Clarence River, New South Wales, date unknown. 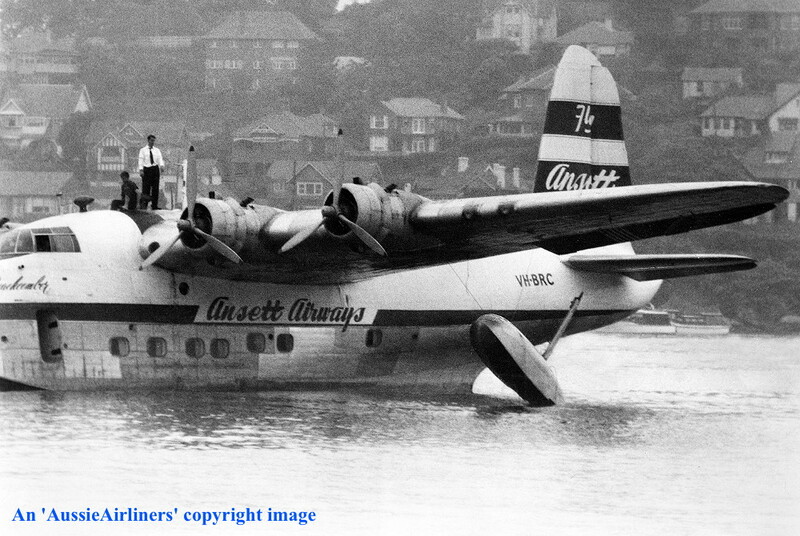 VH-BRC. 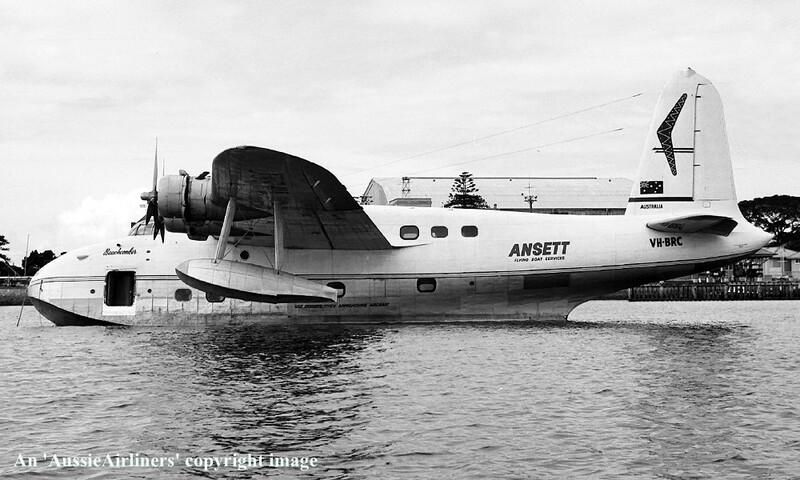 Ansett Airways - 'Beachcomber' in the revised livery at Rose Bay, Sydney, date unknown. 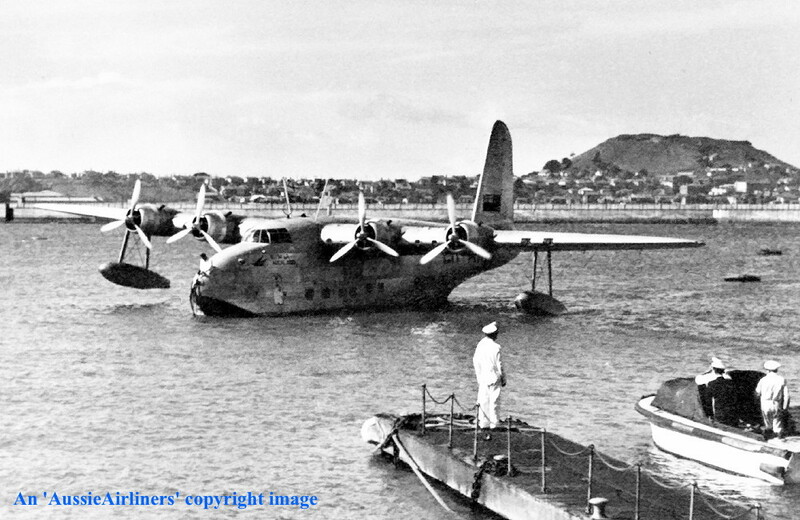 VH-BRC. 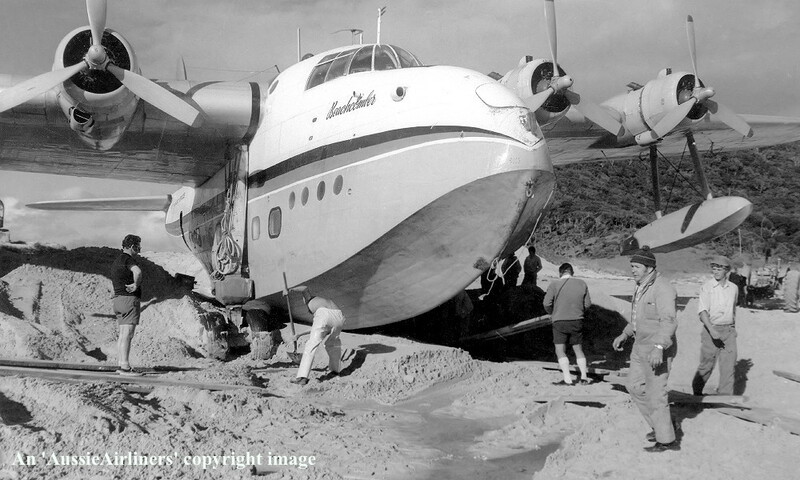 Ansett Flying Boat Services - 'Beachcomber' in the original livery at Lauthala Bay, Fiji, June 1960. 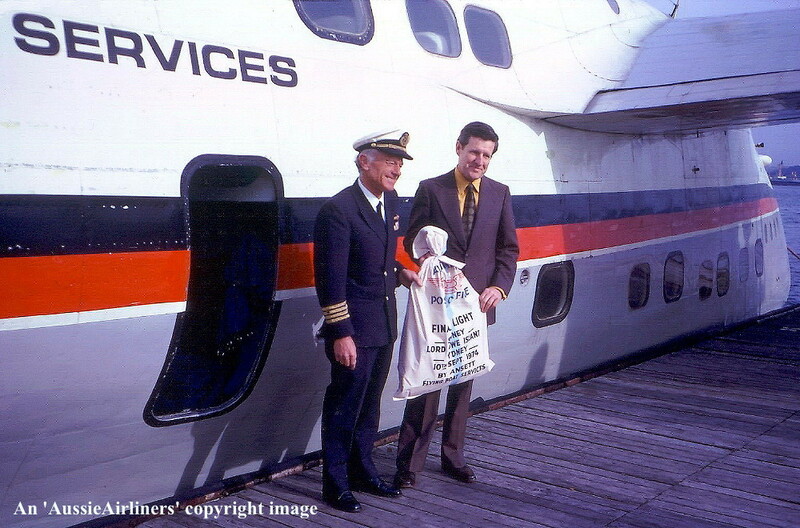 VH-BRC. 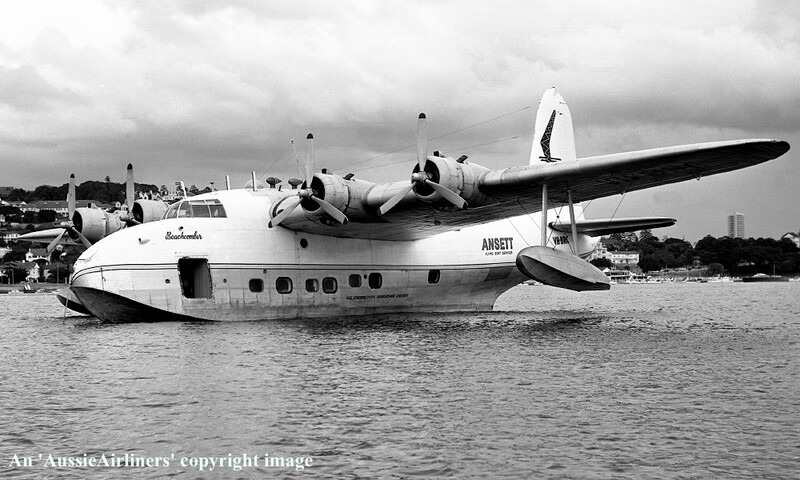 Ansett Flying Boat Services - 'Beachcomber' in the original livery at Rose Bay, Sydney, circa 1962. 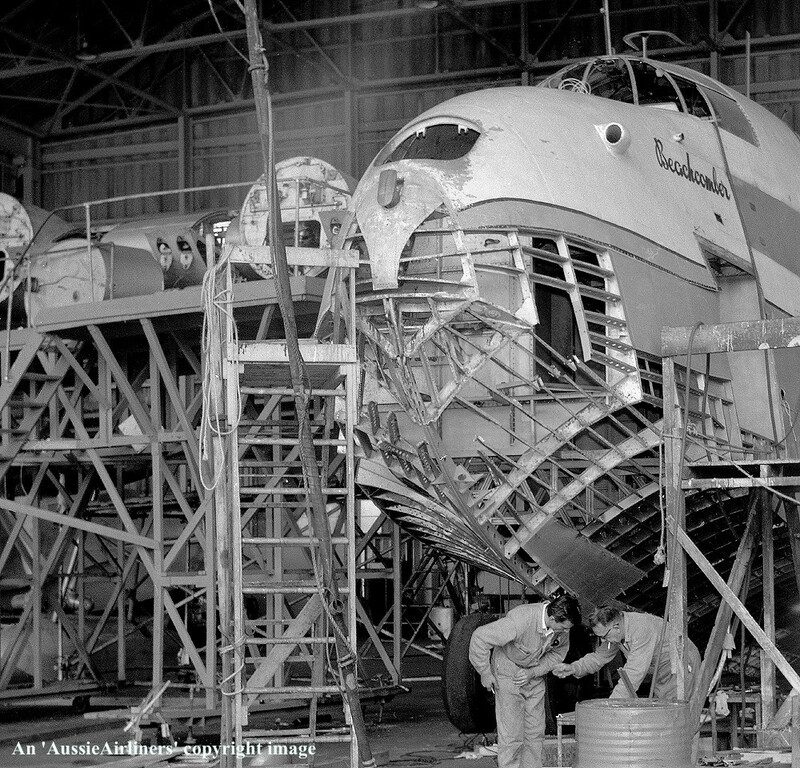 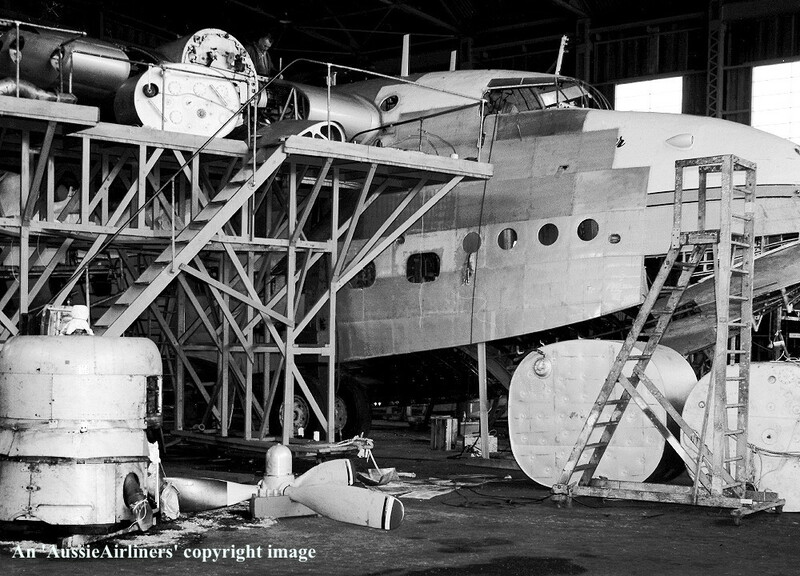 The following series of images captures the aircraft undergoing a major overhaul. 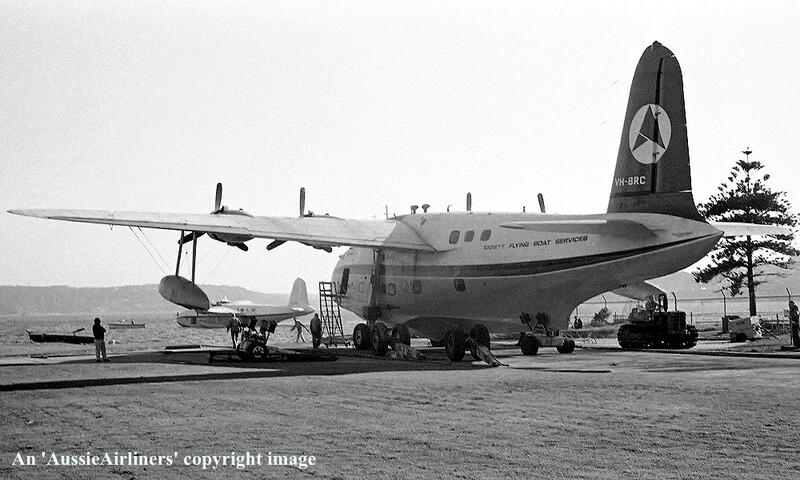 VH-BRC. 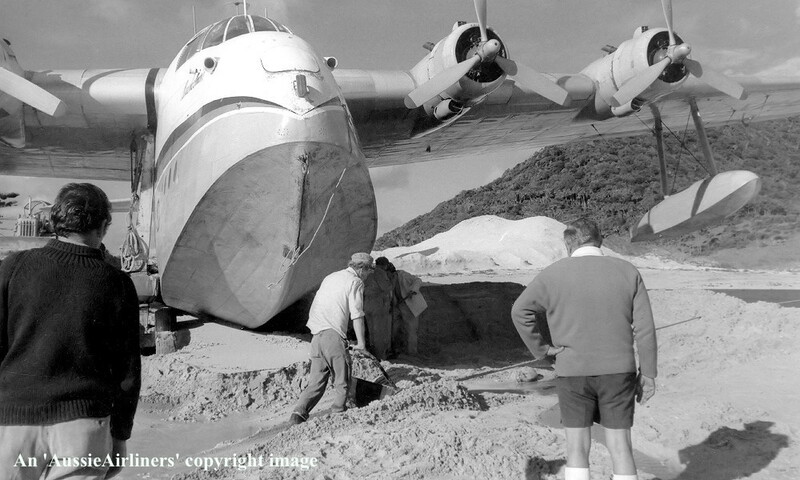 Ansett Flying Boat Services - 'Beachcomber' in the original livery at Lord Howe Island, March 1963. 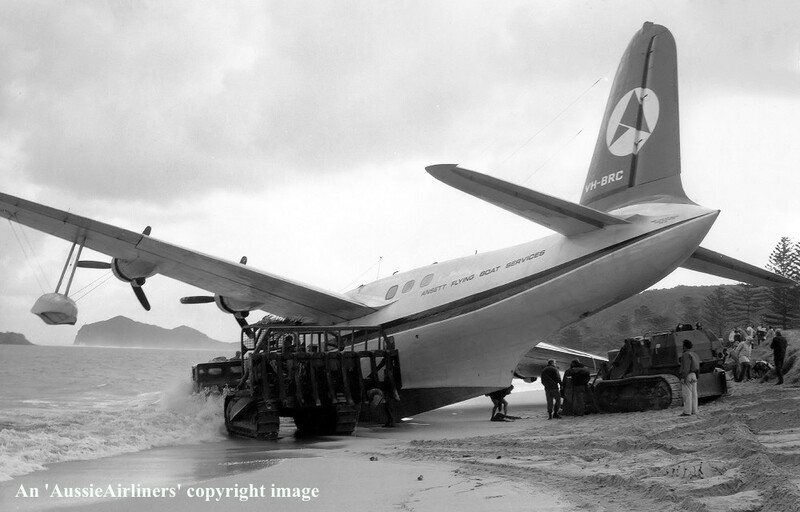 VH-BRC. 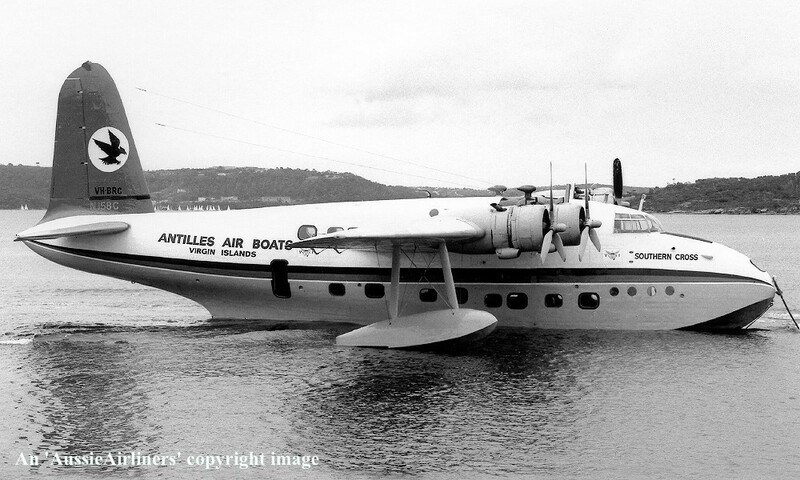 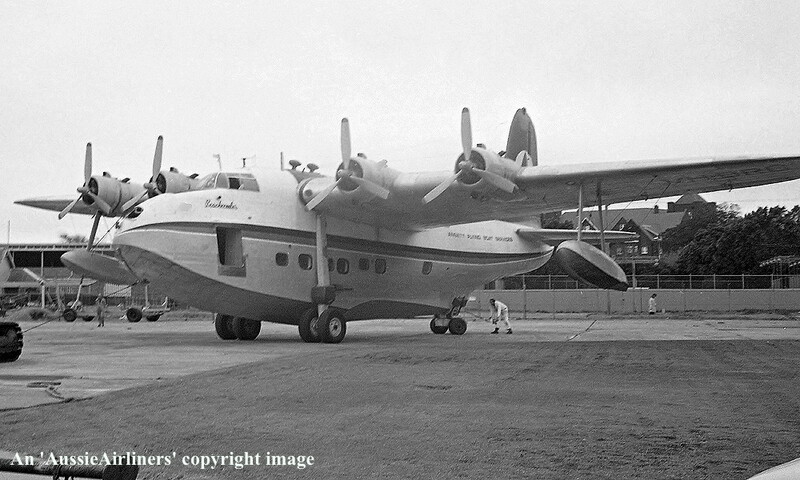 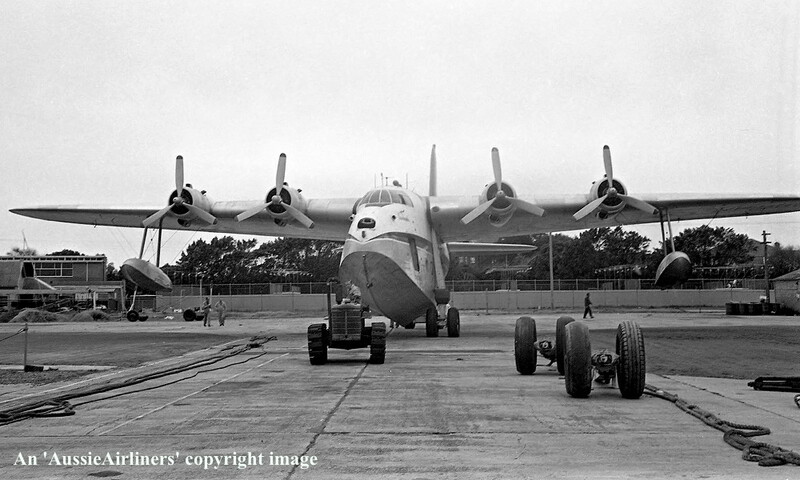 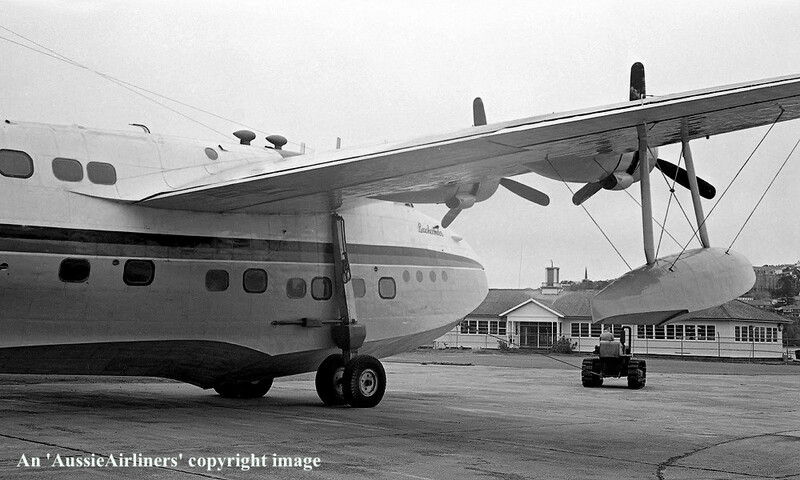 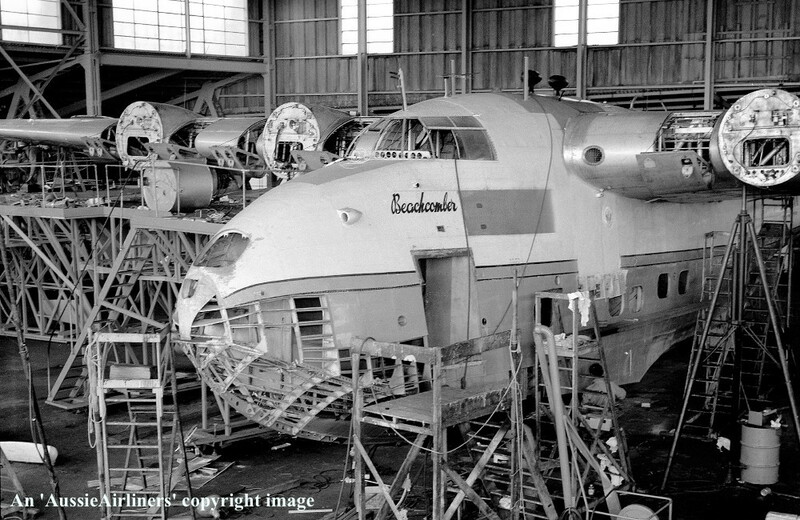 Ansett Flying Boat Services - 'Beachcomber' in the original livery at Rose Bay, Sydney, February 1965. 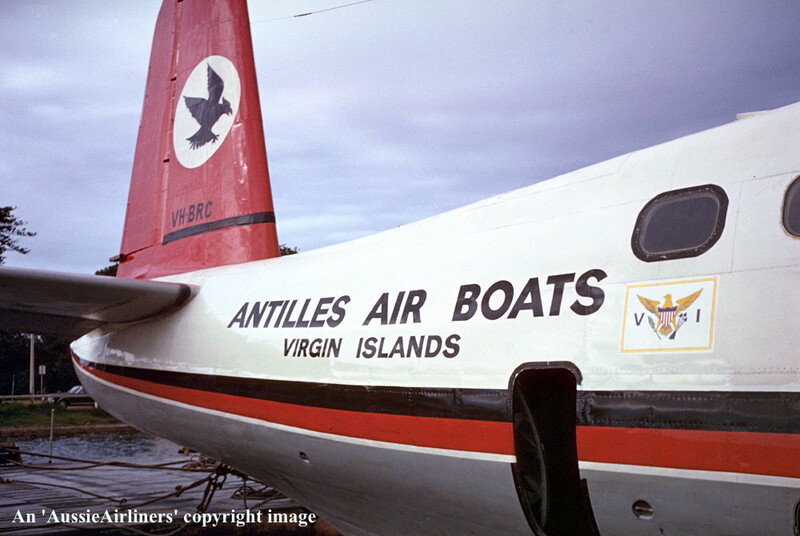 VH-BRC. 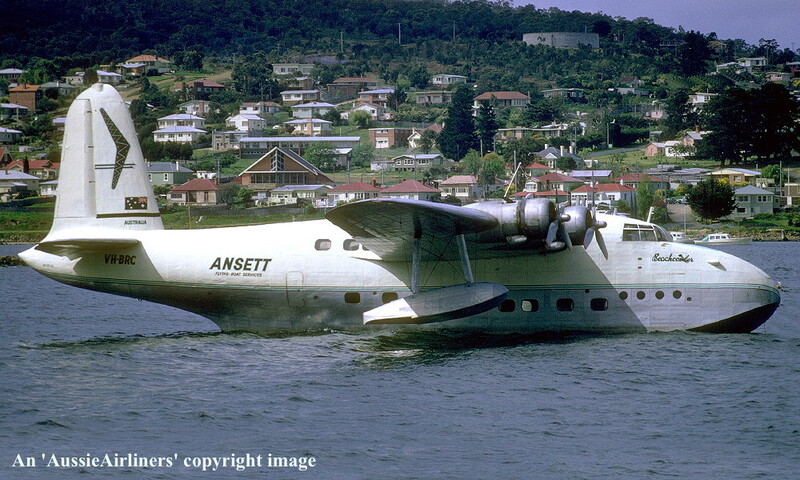 Ansett Flying Boat Services - 'Beachcomber' in the revised livery on the Derwent River, Hobart, date unknown. 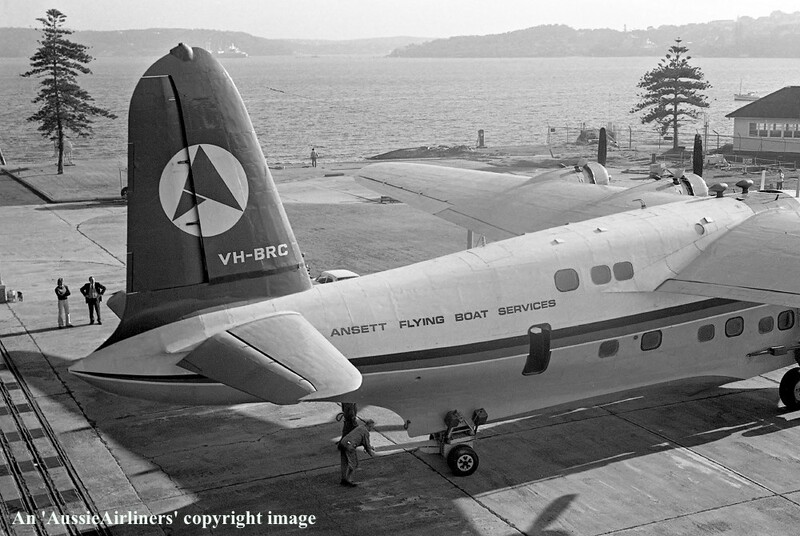 VH-BRC. 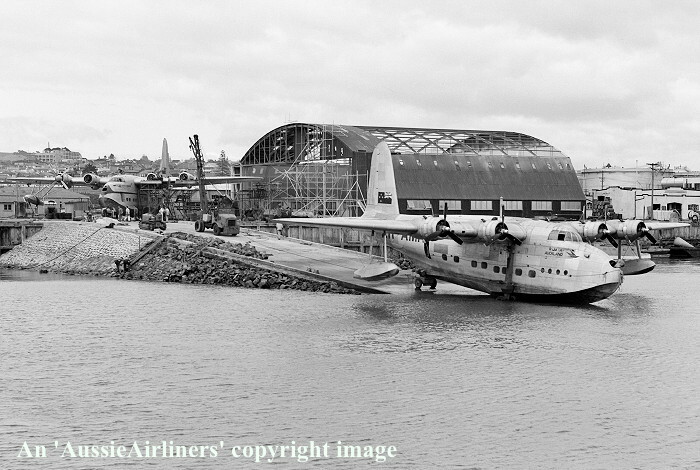 Ansett Flying Boat Services - 'Beachcomber' in the revised livery at Rose Bay, Sydney, April 1967. 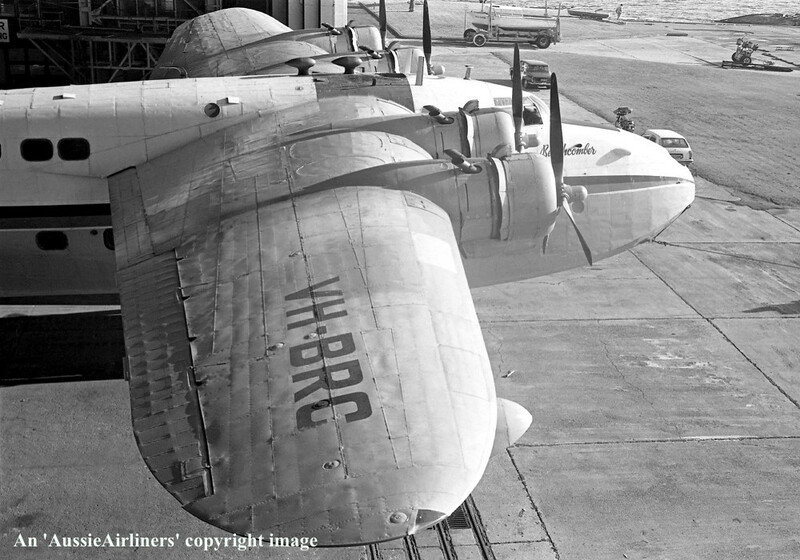 VH-BRC. 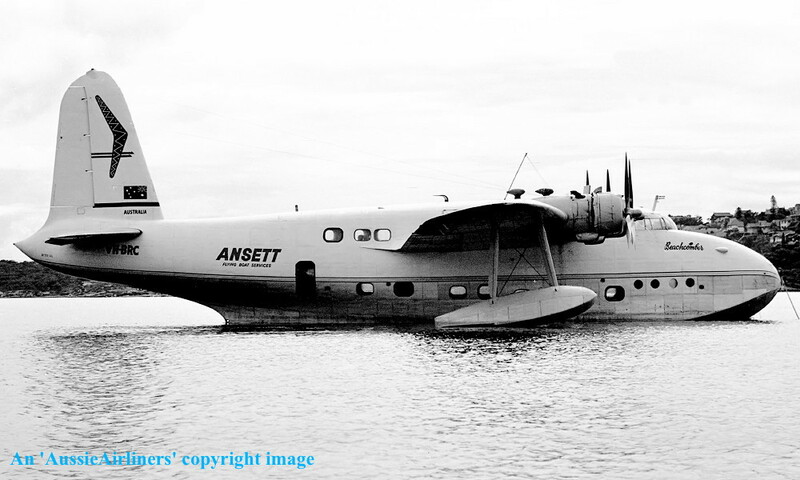 Ansett Flying Boat Services - 'Beachcomber' in the revised livery at Rose Bay, Sydney, October 02, 1967. 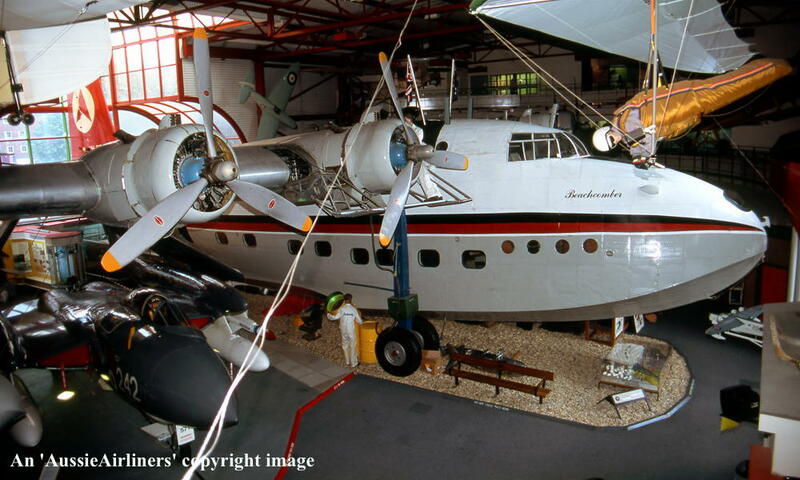 VH-BRC. 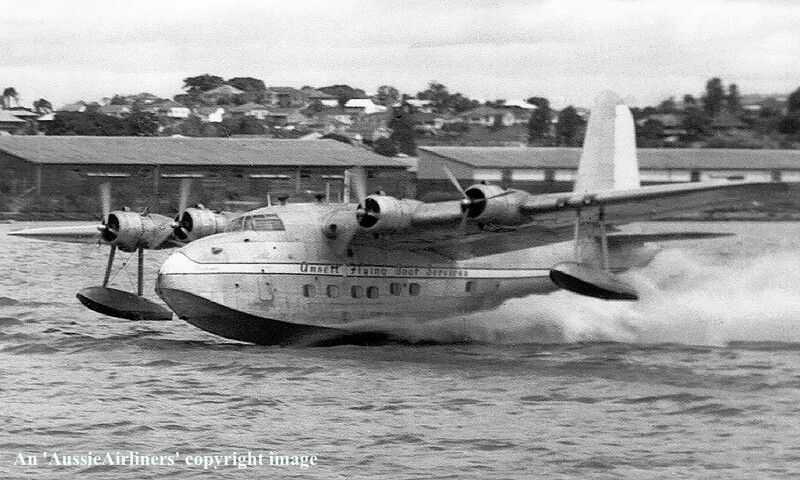 Ansett Flying Boat Services - 'Beachcomber' in the revised livery at Rose Bay, Sydney, March 1968. 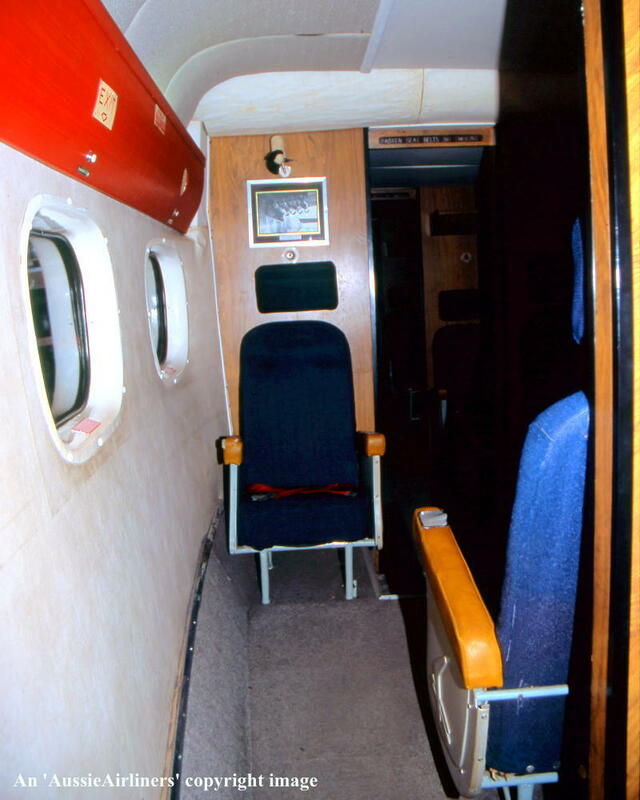 VH-BRC. 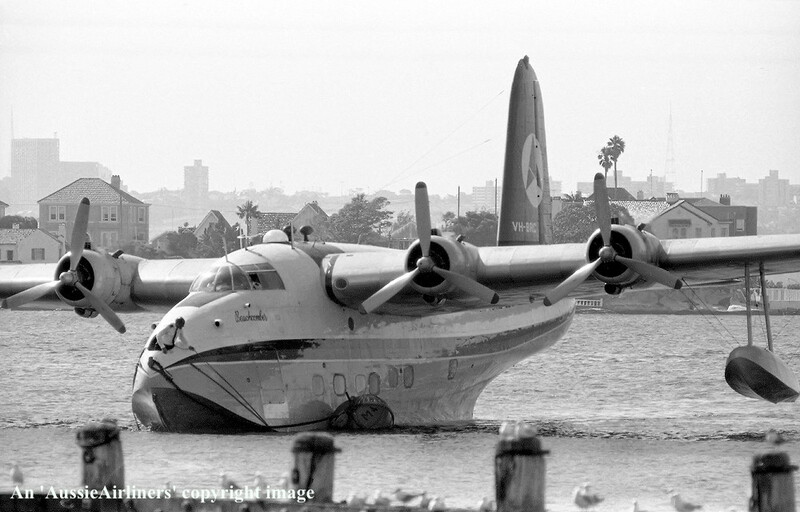 Ansett Flying Boat Services - 'Beachcomber' in the revised livery at Rose Bay, Sydney, October 1968. 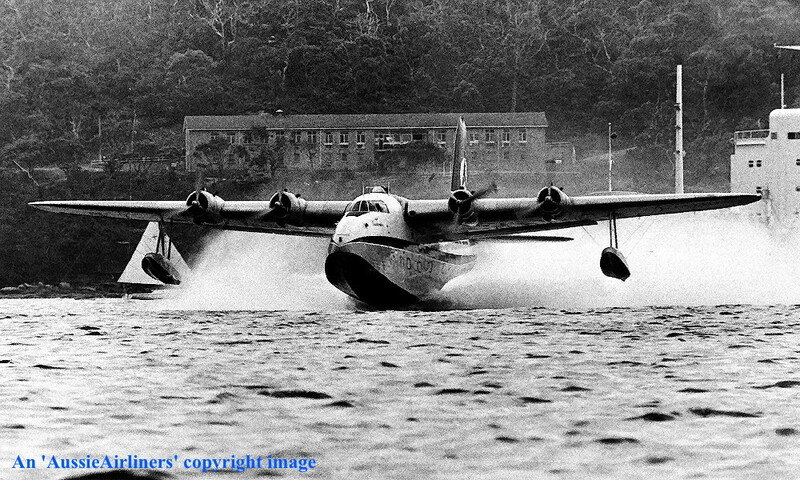 VH-BRC. 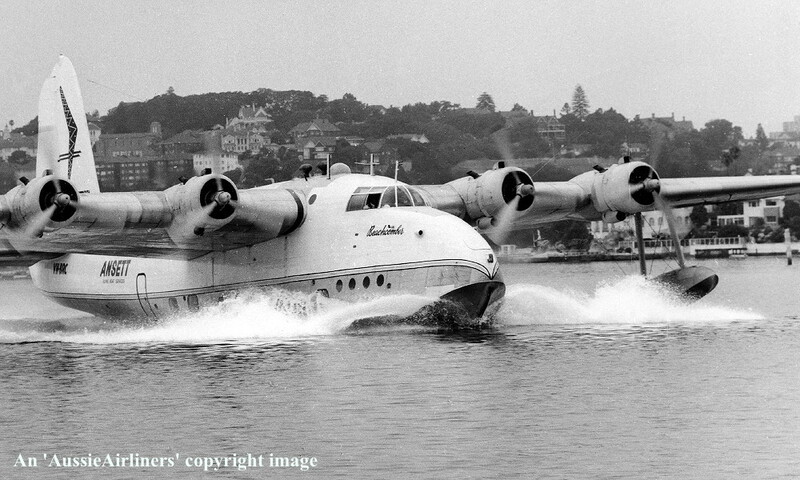 Ansett Flying Boat Services - 'Beachcomber' in the 'delta' livery at Rose Bay, Sydney, November 1970. 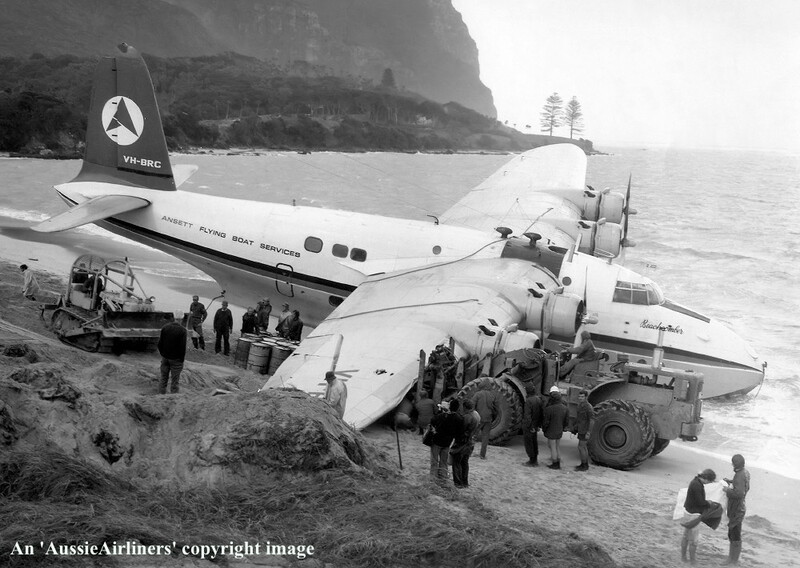 VH-BRC. 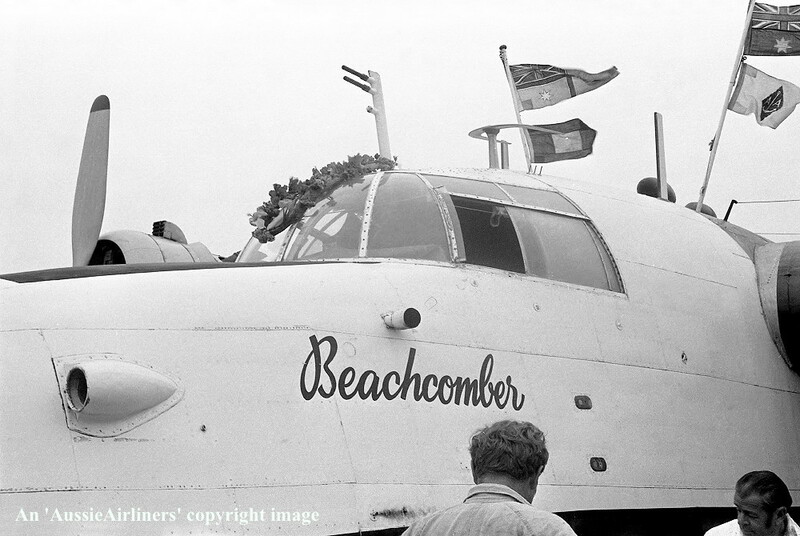 Ansett Flying Boat Services - 'Beachcomber' in the 'delta' livery at Rathmines, Newcastle, September 1972. 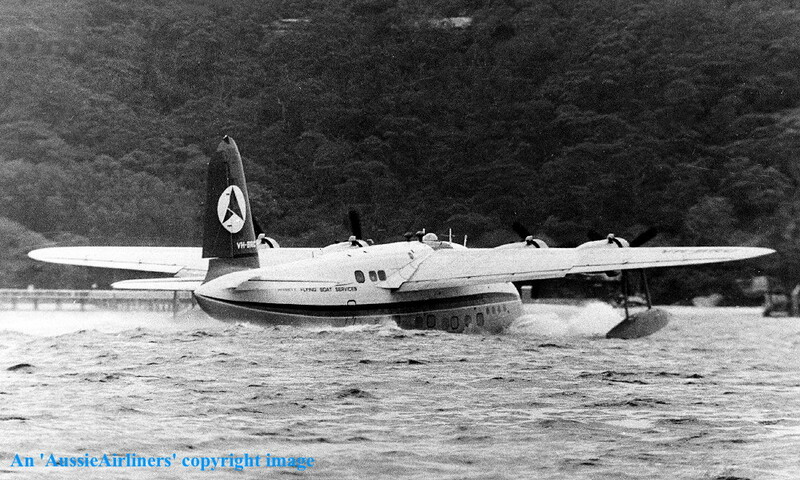 VH-BRC. 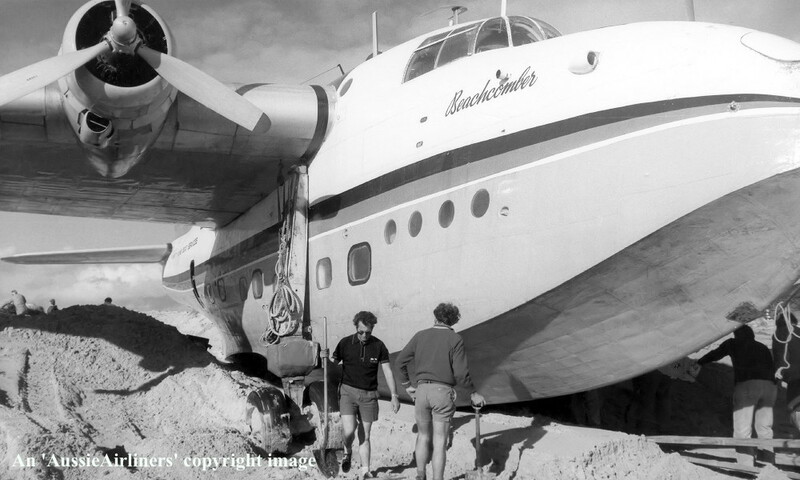 Ansett Flying Boat Services - 'Beachcomber' in the 'delta' livery at Lord Howe Island, August 1973. 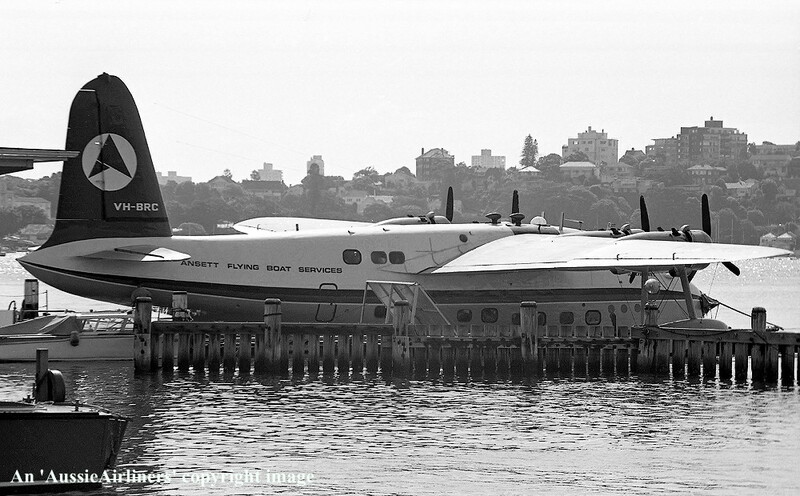 VH-BRC. 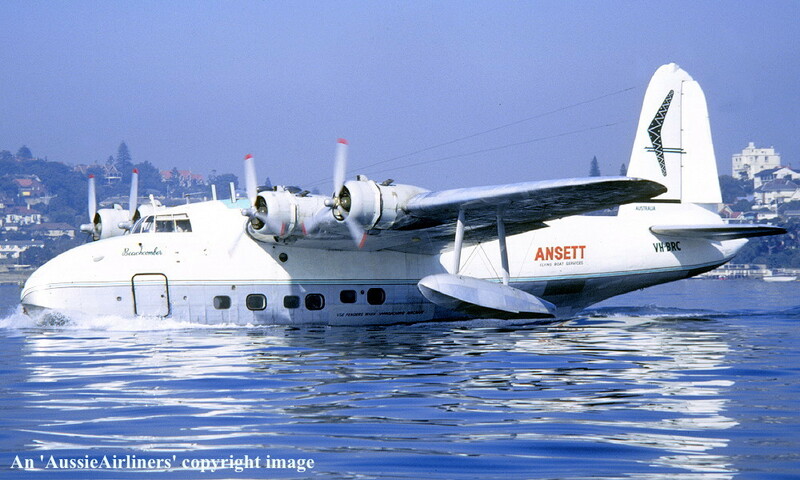 Ansett Flying Boat Services - 'Beachcomber' at Rose Bay, Sydney, November 1973. 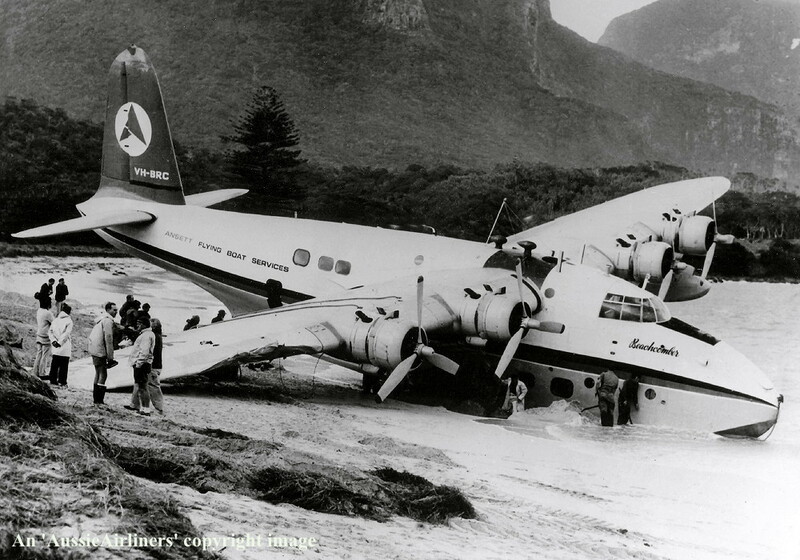 VH-BRC. 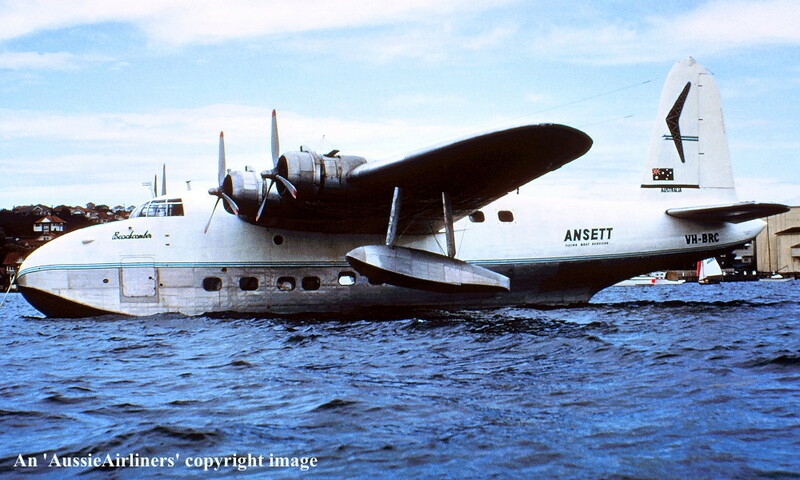 Ansett Flying Boat Services - 'Beachcomber' somewhere over southern New South Wales, November 1973. 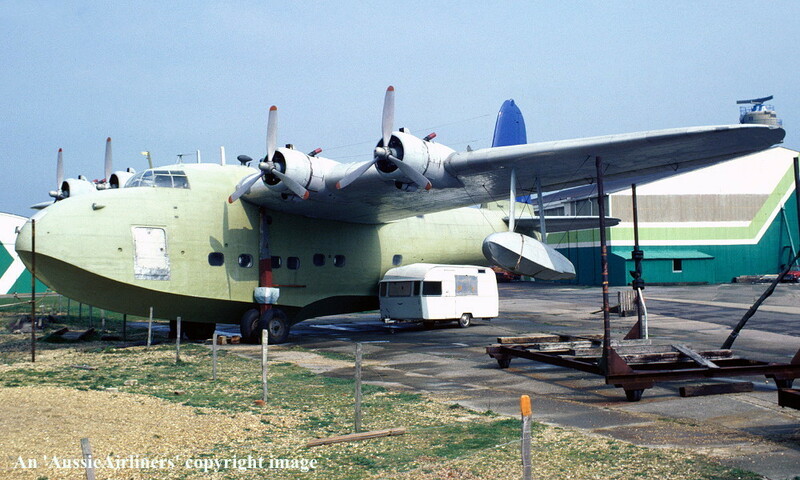 VH-BRC. 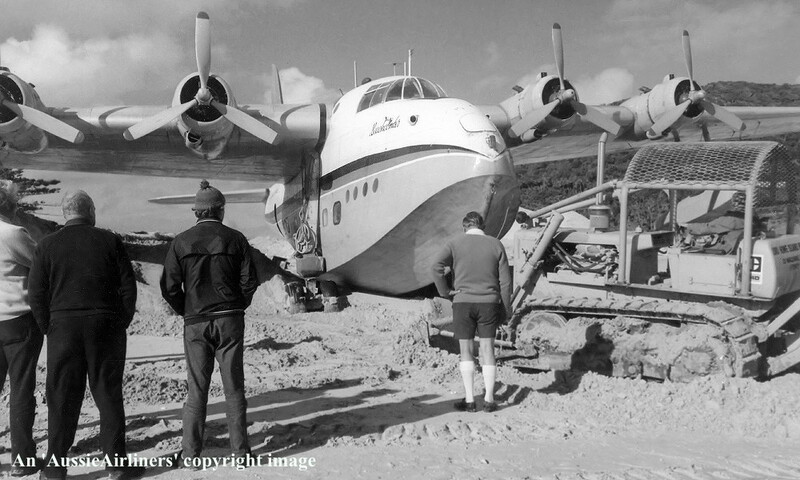 Ansett Flying Boat Services - 'Beachcomber' in the 'delta' livery at Lake Eucumbene, New South Wales, November 17, 1973. 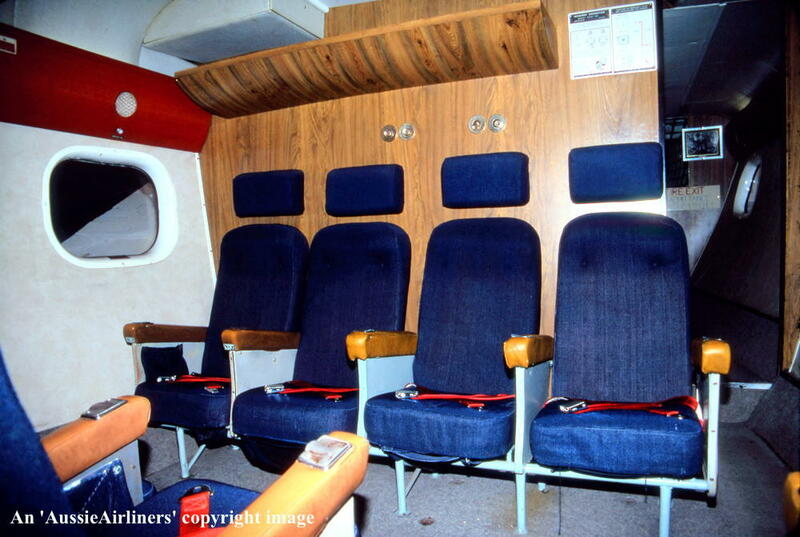 VH-BRC. 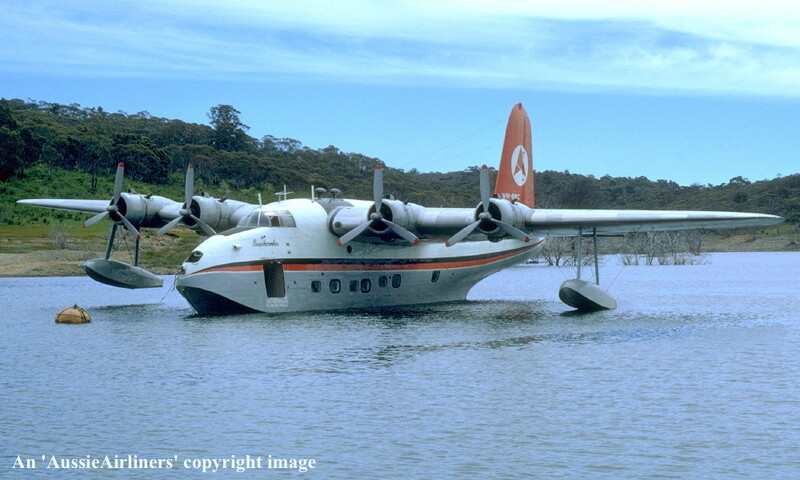 Ansett Flying Boat Services - 'Beachcomber' in the 'delta' livery at Lake Eucumbene, New South Wales, November 18, 1973. 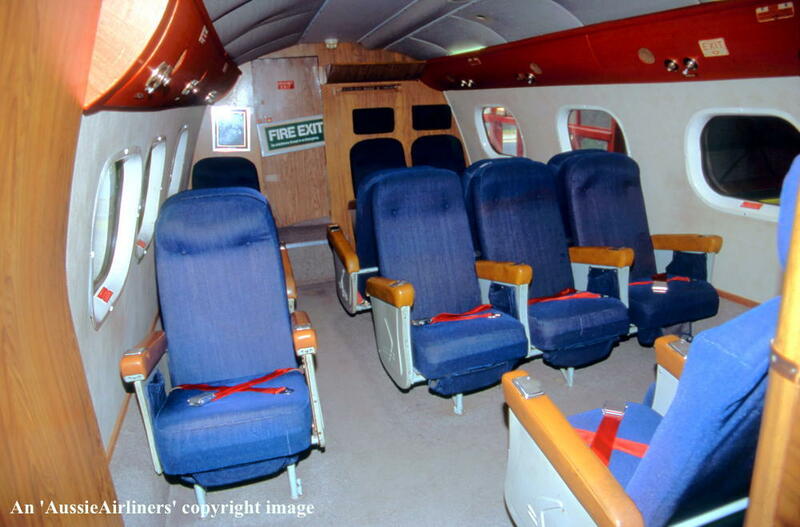 VH-BRC. 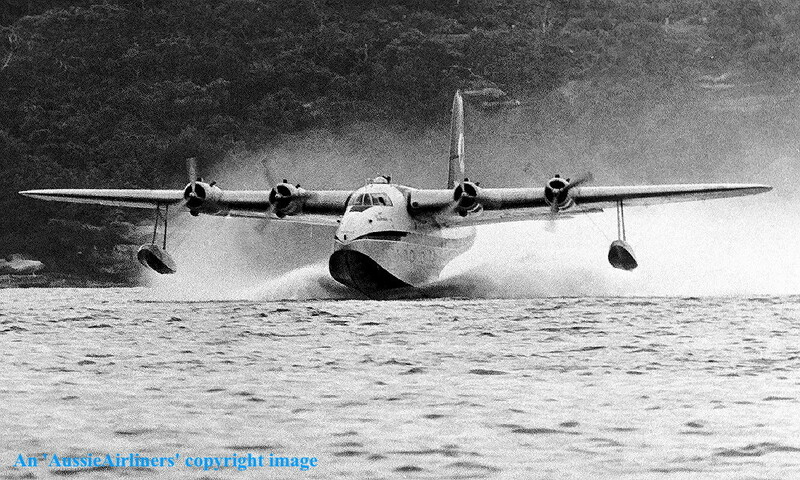 Ansett Flying Boat Services - 'Beachcomber' somewhere over southern New South Wales, November 18, 1973. 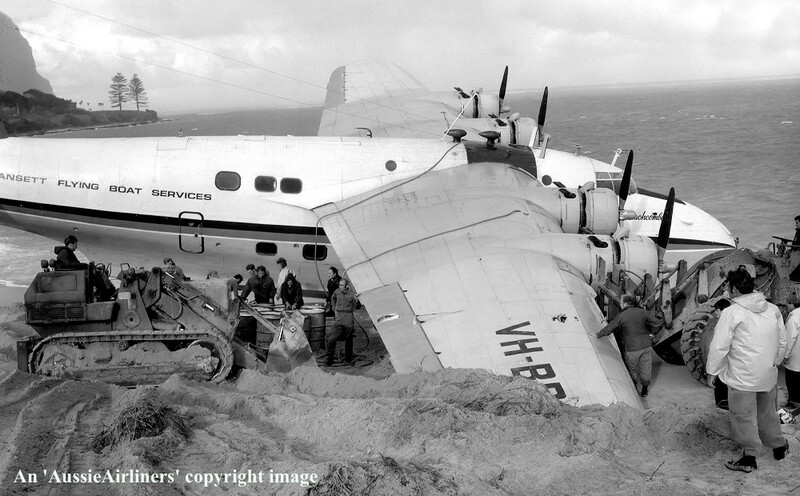 VH-BRC. 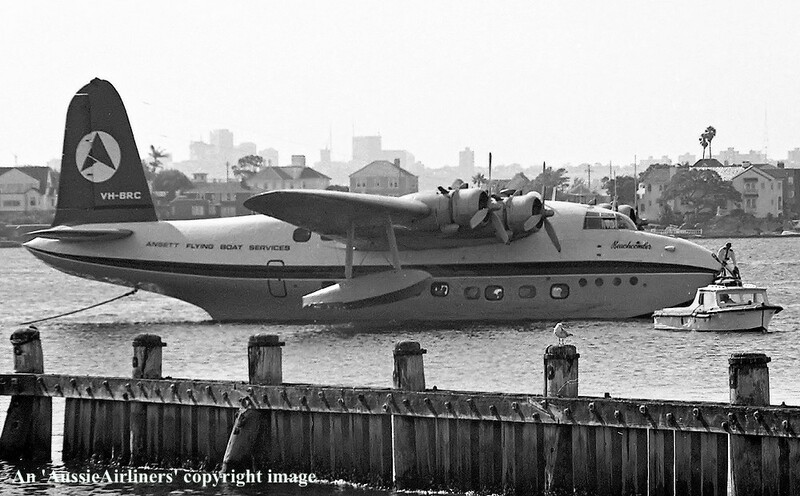 Ansett Flying Boat Services - 'Beachcomber' in the 'delta' livery at Rose Bay, Sydney, December 20, 1973. 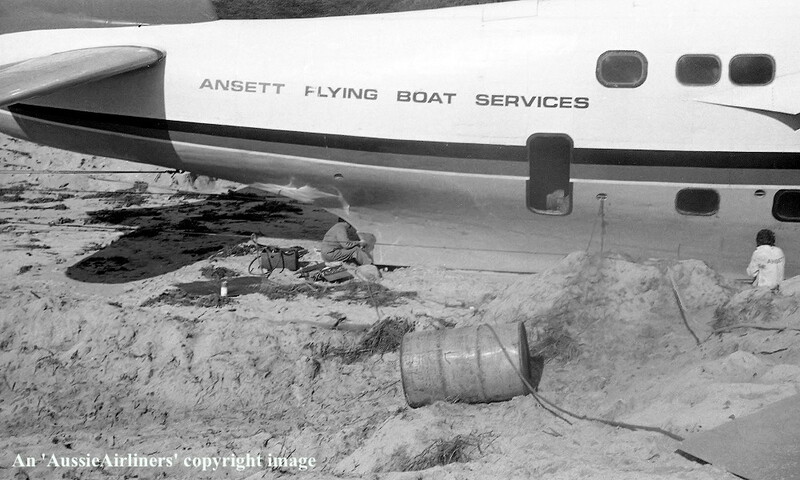 The Flight Engineer or Steward was responsible for securing the aircraft to the mooring buoy. 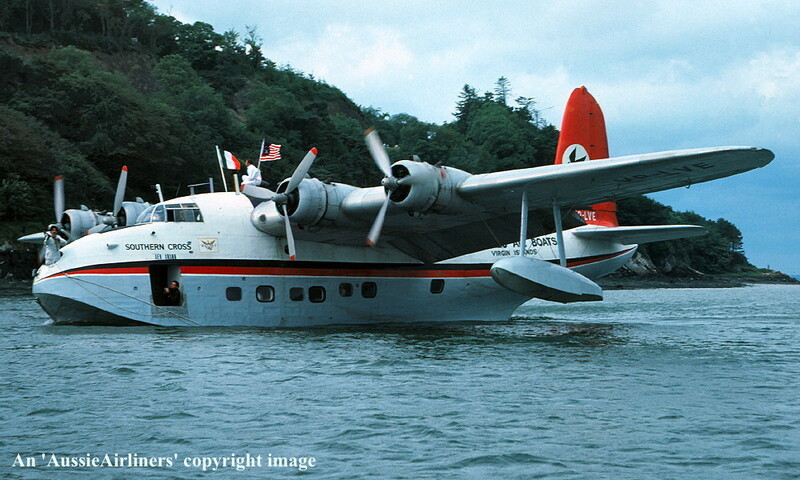 VH-BRC. 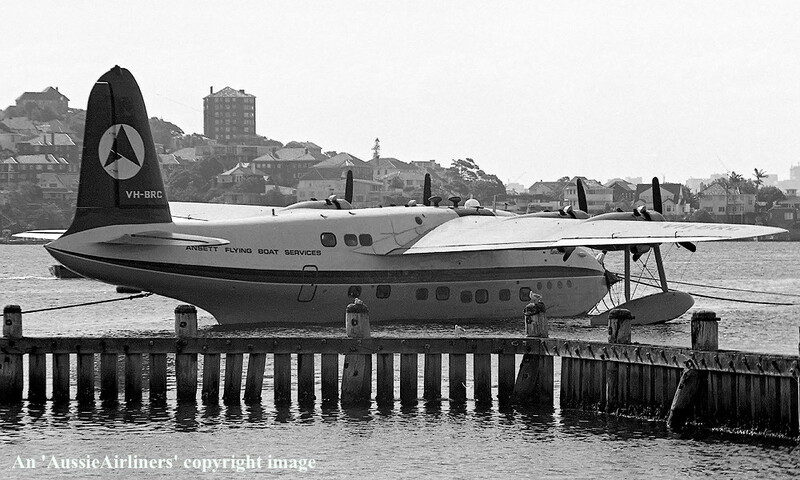 Ansett Flying Boat Services - 'Beachcomber' at Rose Bay, Sydney, December 20, 1973. 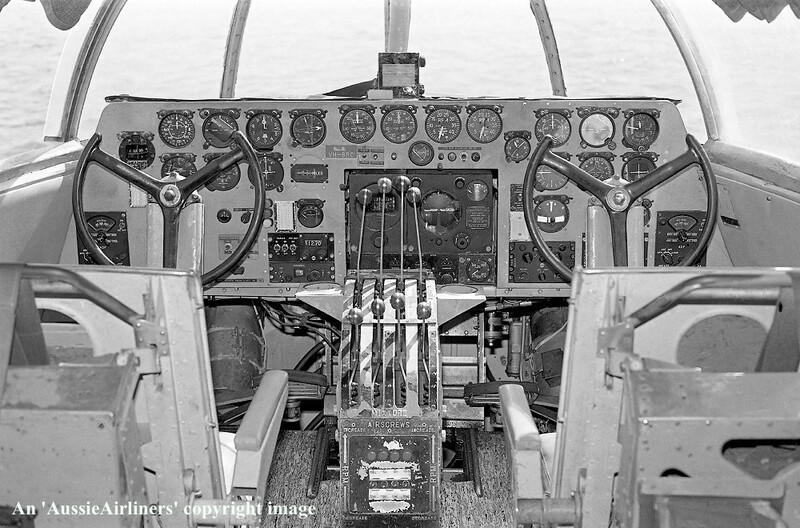 An overall view of the flight deck. 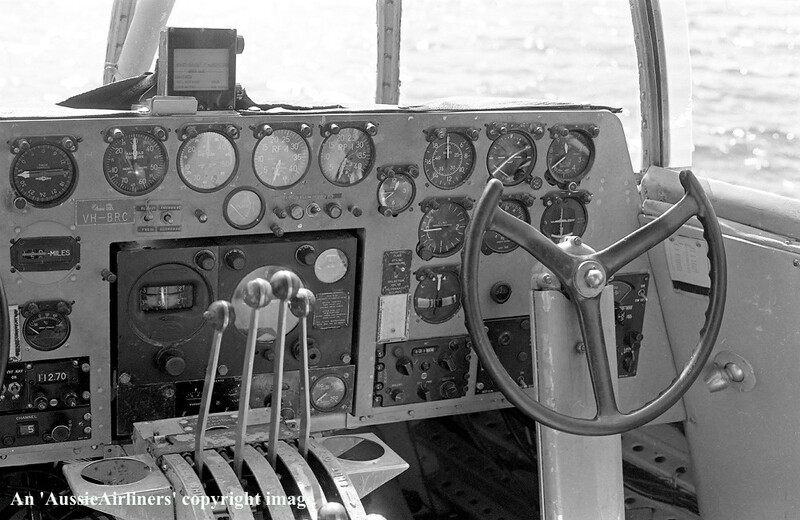 The Captain's side of the flight deck. 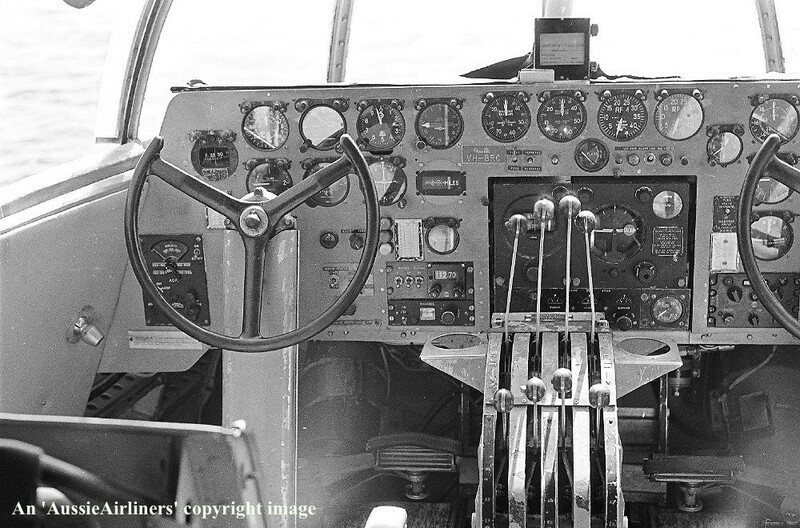 The co-pilots side of the flight deck. 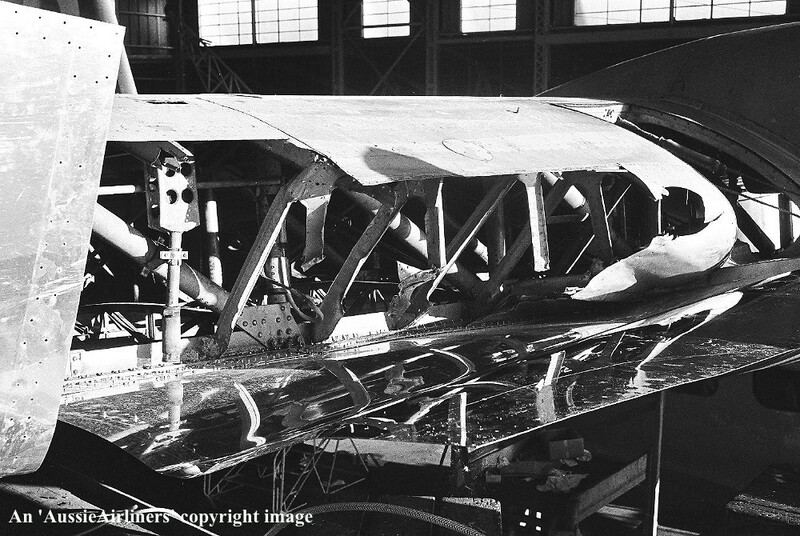 The flight engineer's station was situated behind the wing carry-through beams. 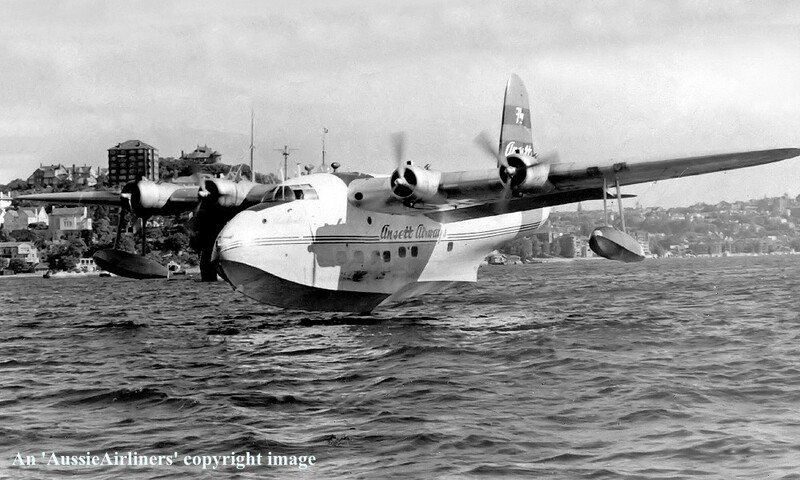 VH-BRC. 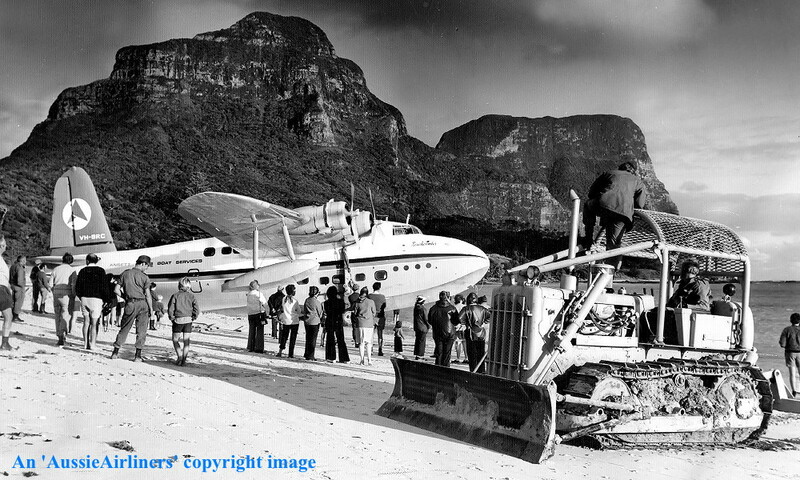 Ansett Flying Boat Services - 'Beachcomber' in the 'delta' livery at Lord Howe Island, June 09, 1974. 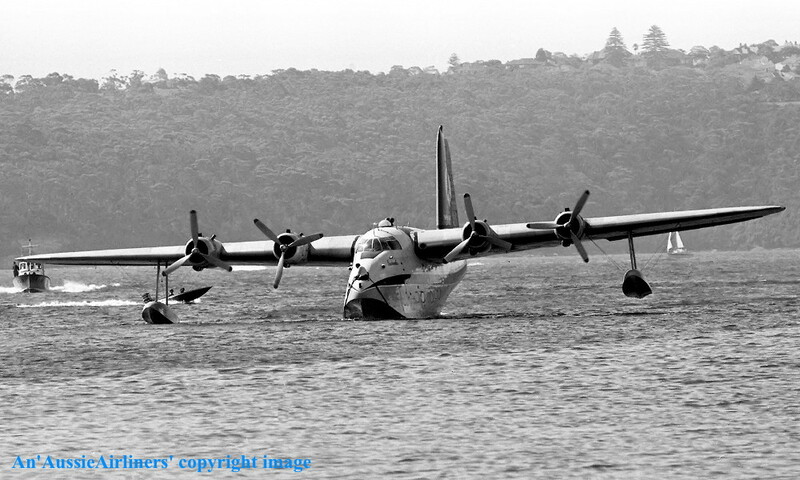 VH-BRC. 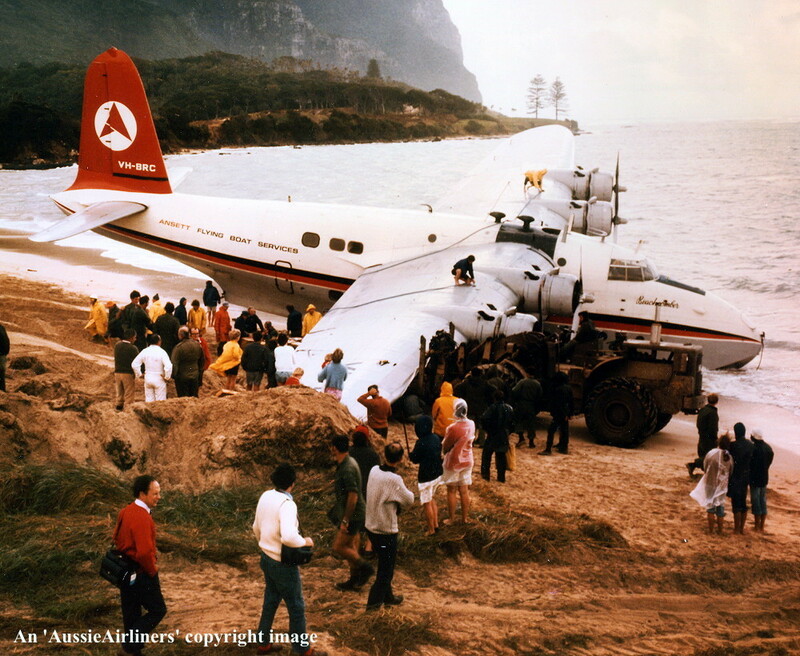 Ansett Flying Boat Services - 'Beachcomber' at Lord Howe Island, June 09, 1974. 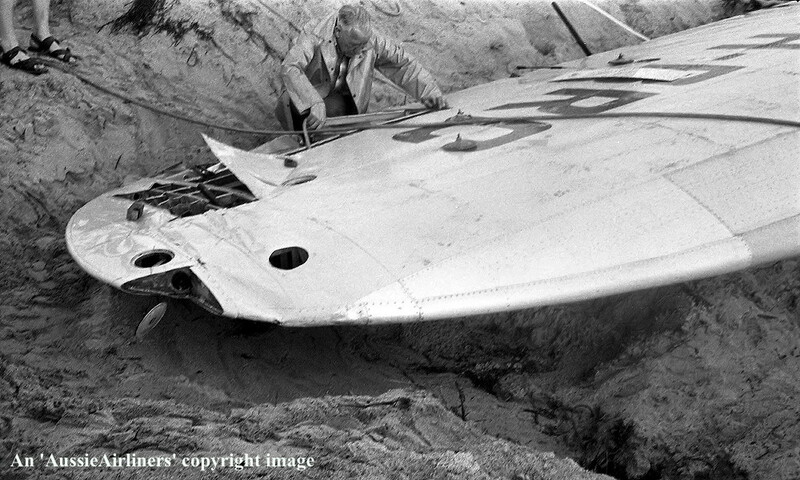 An Australian Army Engineer retrieves the smashed starboard wingtip float. 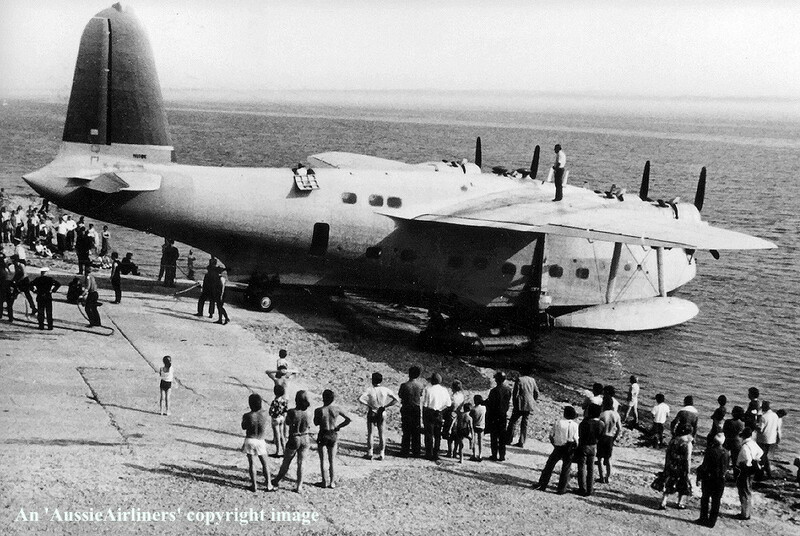 VH-BRC. 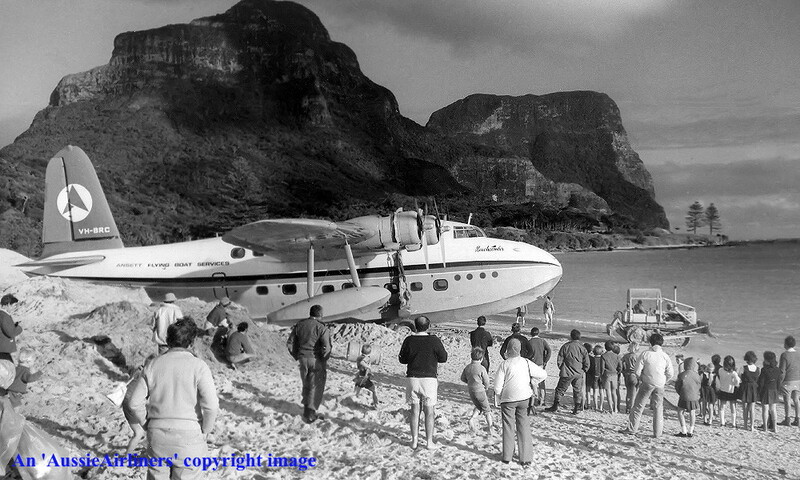 Ansett Flying Boat Services - 'Beachcomber' at Lord Howe Island, June 1974. 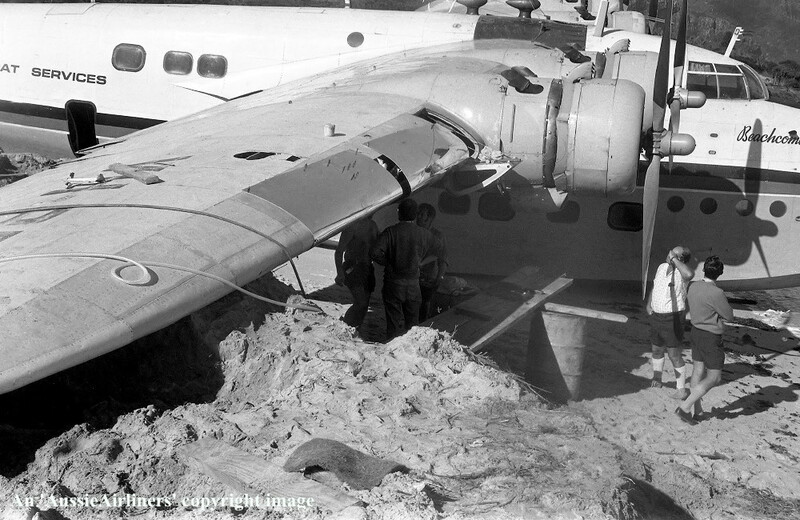 The starboard wingtip buried in the sand. 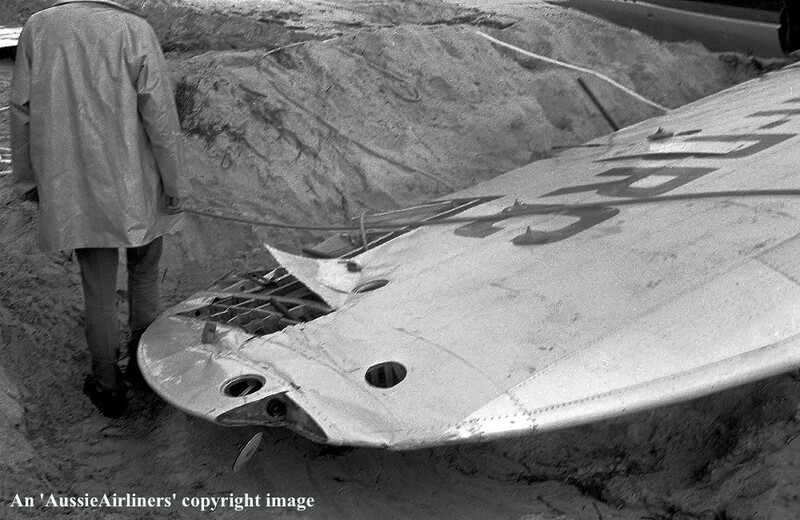 The badly crushed leading edge of the starboard wing. 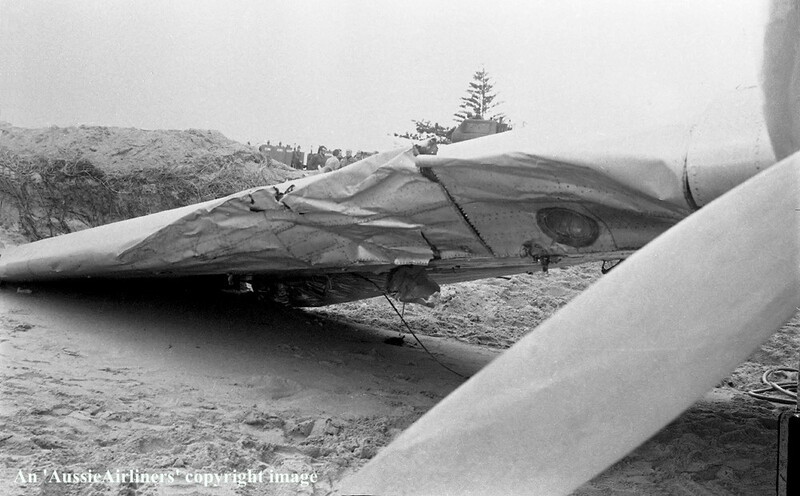 The badly crushed starboard wing leading edge and the float attachment points. 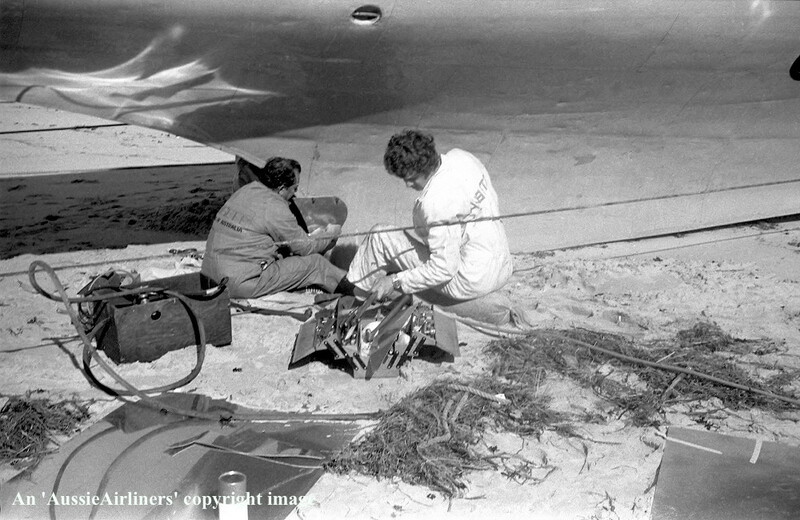 Repairs commence on the starboard wing in very primitive conditions. 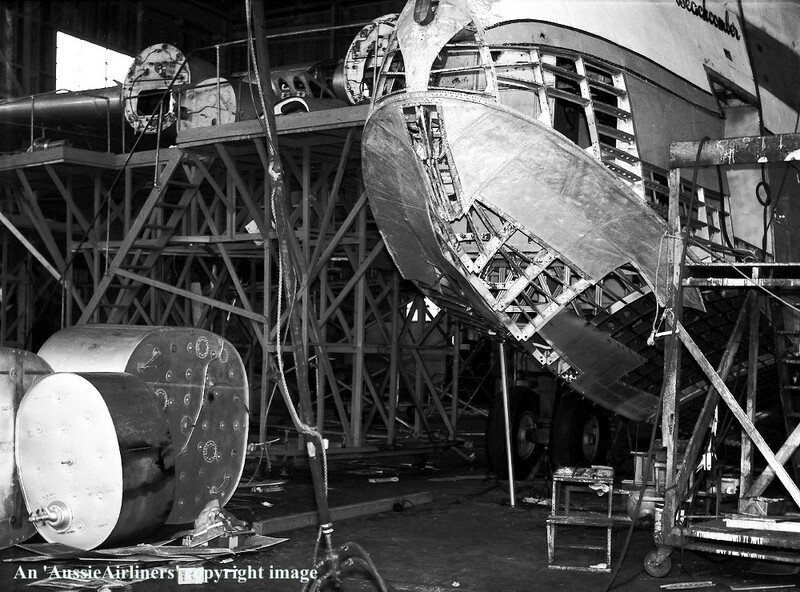 Repairs are made to the damaged hull. 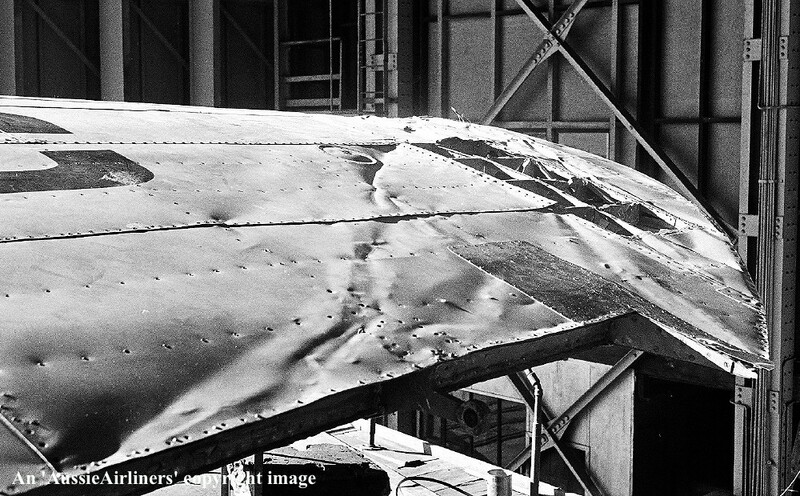 A large sheet-metal patch was afixed over the damaged section of the starboard wing. 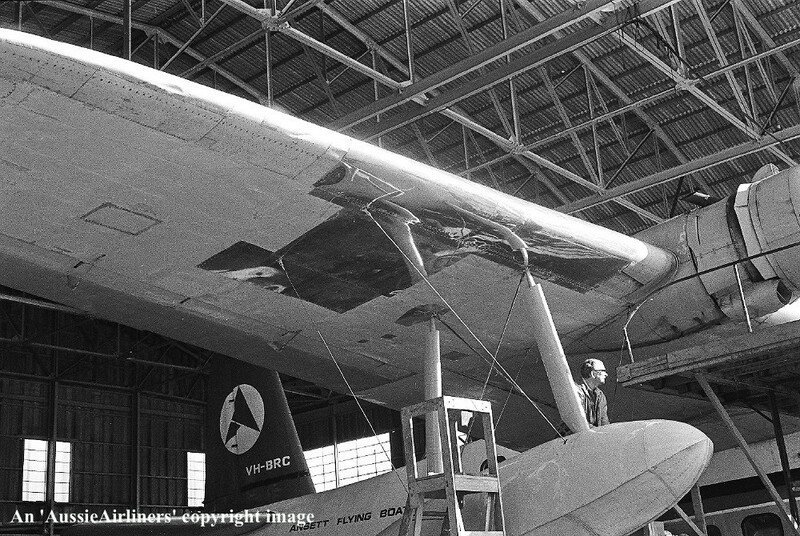 VH-BRC. 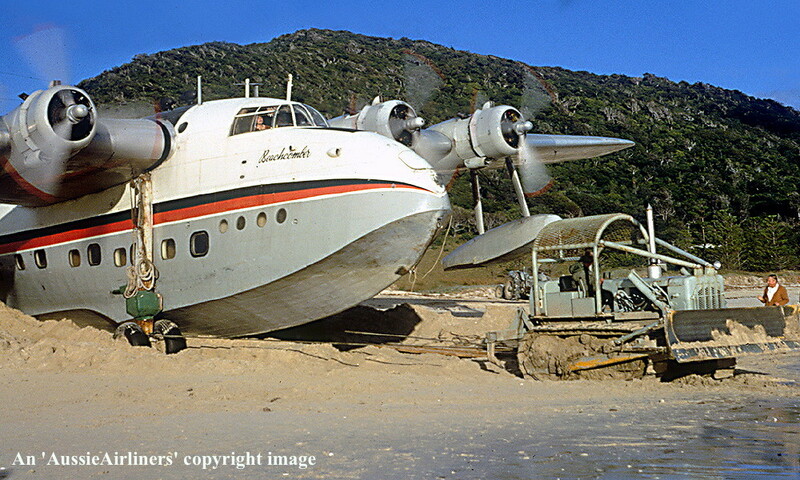 Ansett Flying Boat Services - 'Beachcomber' at Lord Howe Island, July 1974. 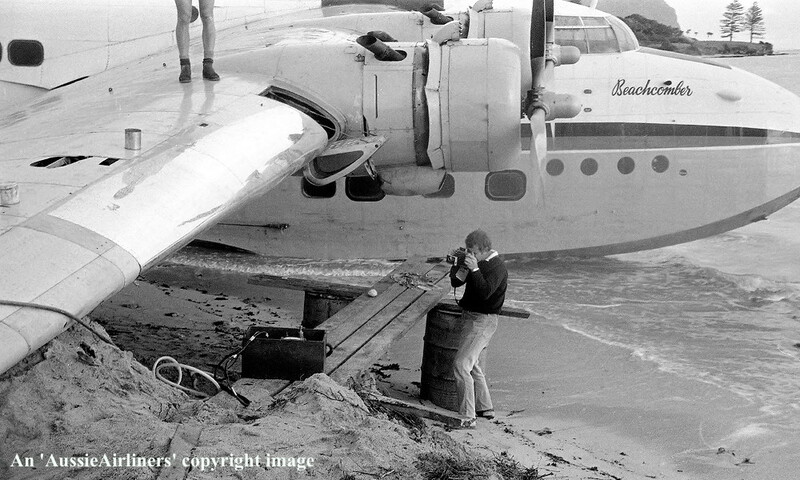 With temporary repairs complete it was now time to return the aircraft to the water. 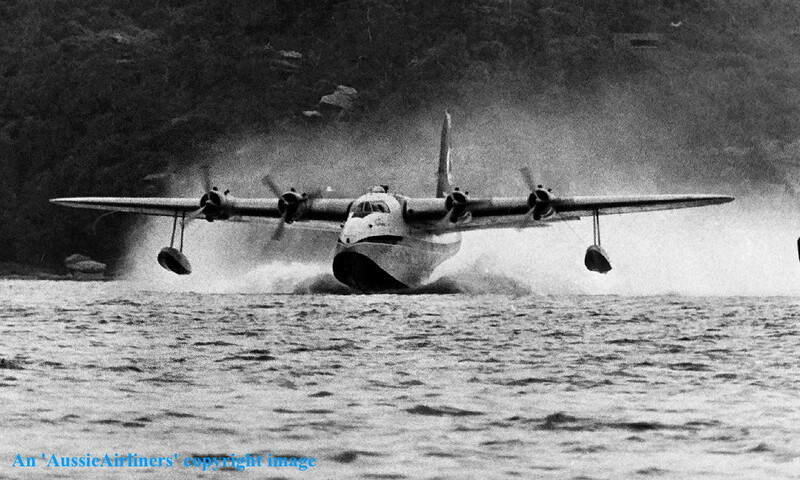 VH-BRC. 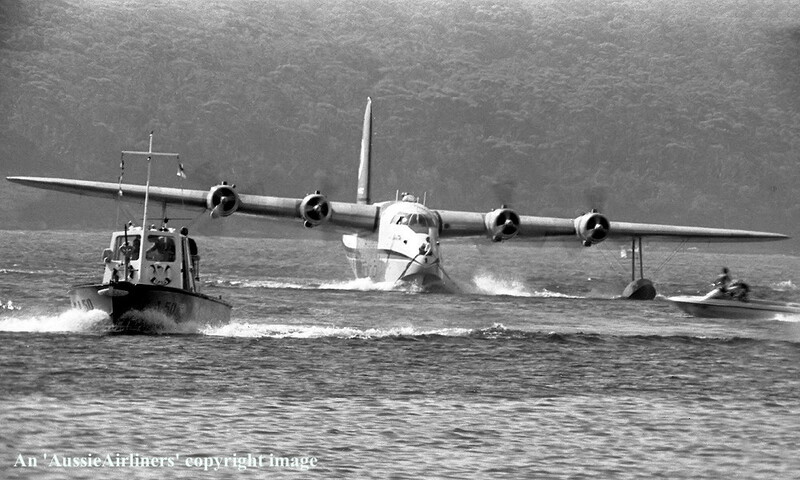 Ansett Flying Boat Services - 'Beachcomber' at Rose Bay, Sydney, July 1974. 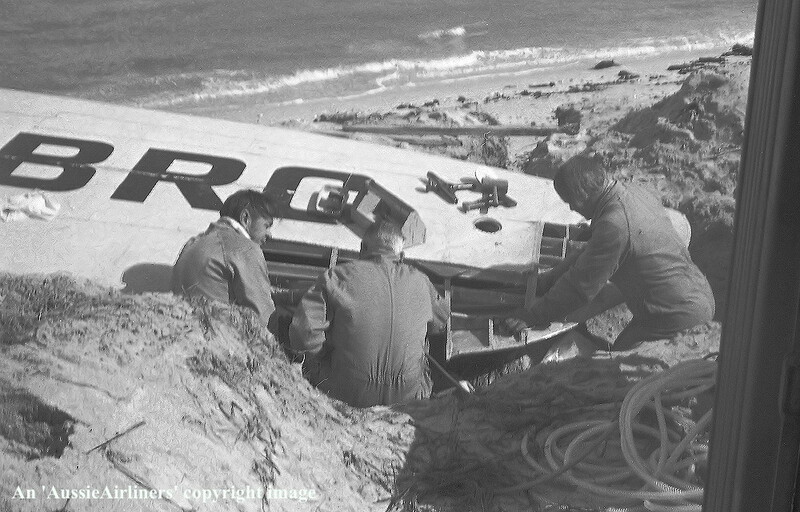 With the aircraft now safely back at Rose Bay permanent repairs can be undertaken. 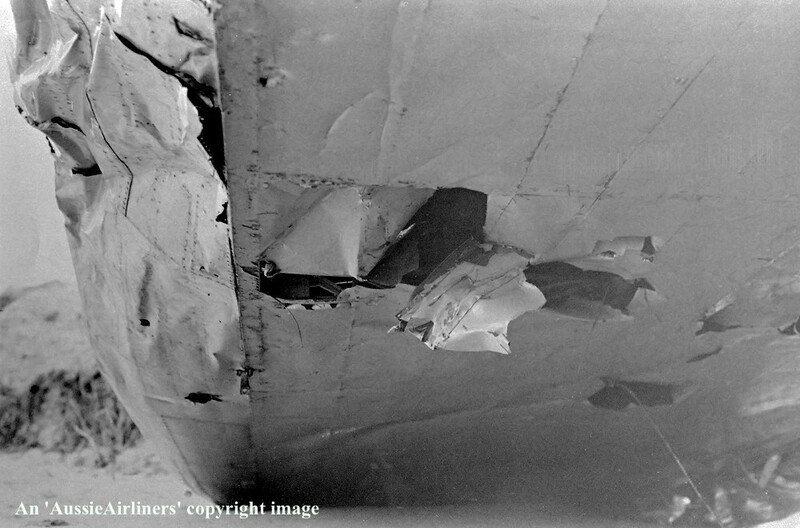 Close-up view of the temporary patch on the starboard wing leading edge. 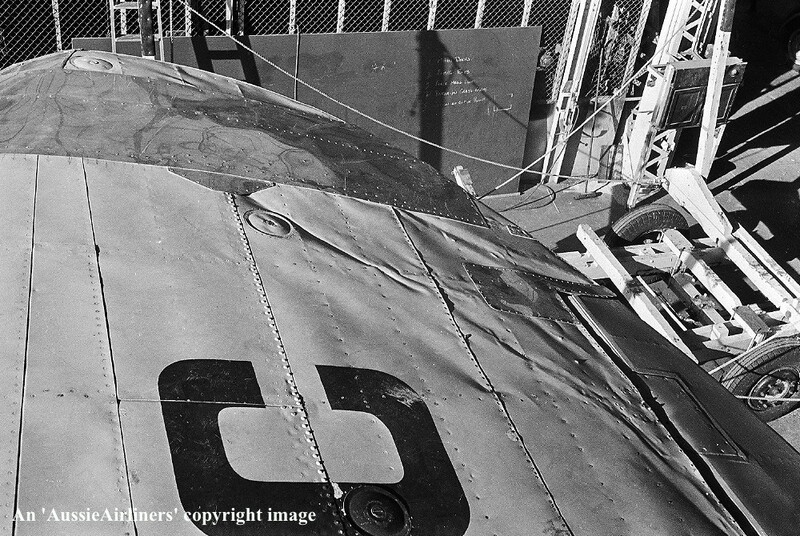 A close-up view of the temporary patch on the starboard wing tip along with the wrinkled surface. 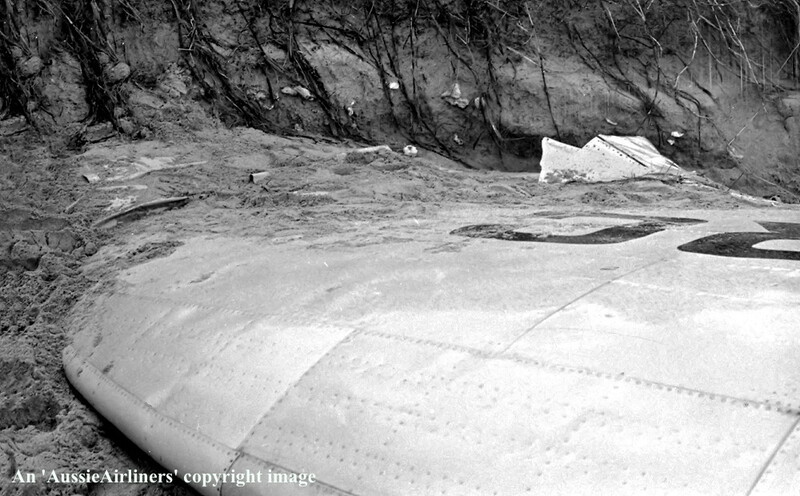 A close-up view of the damaged starboard wing tip along with the wrinkled surface. 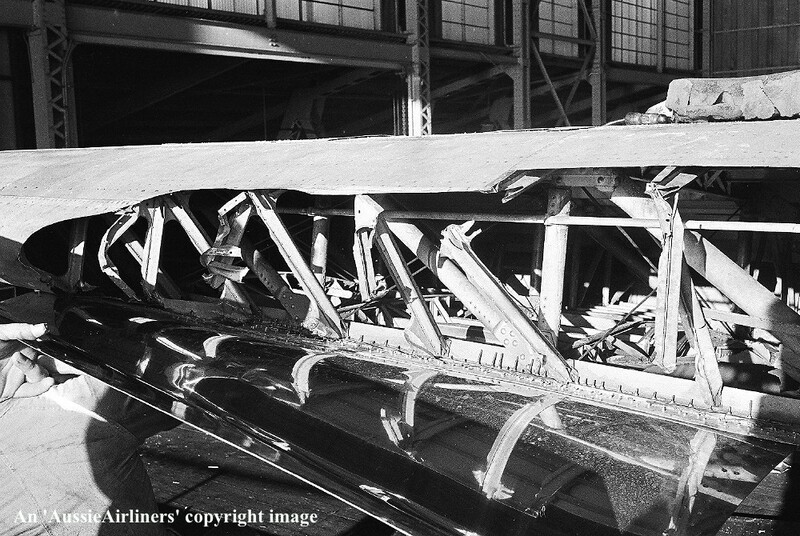 A close-up view of the damaged internal starboard wing leading edge structure. 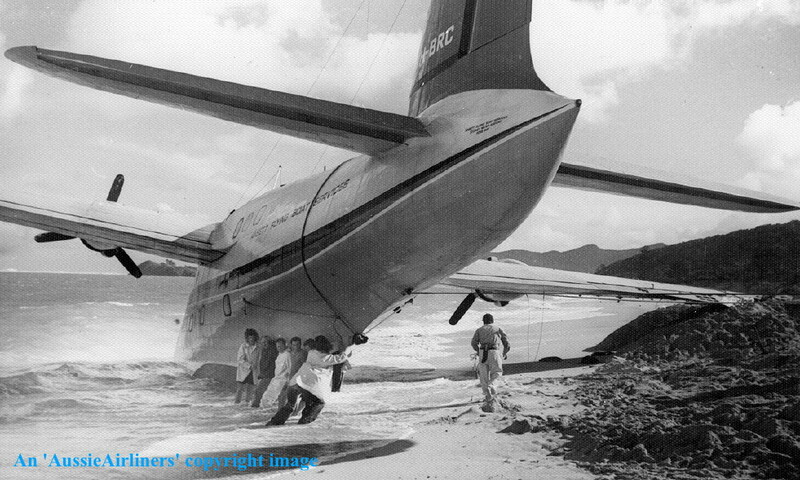 VH-BRC. 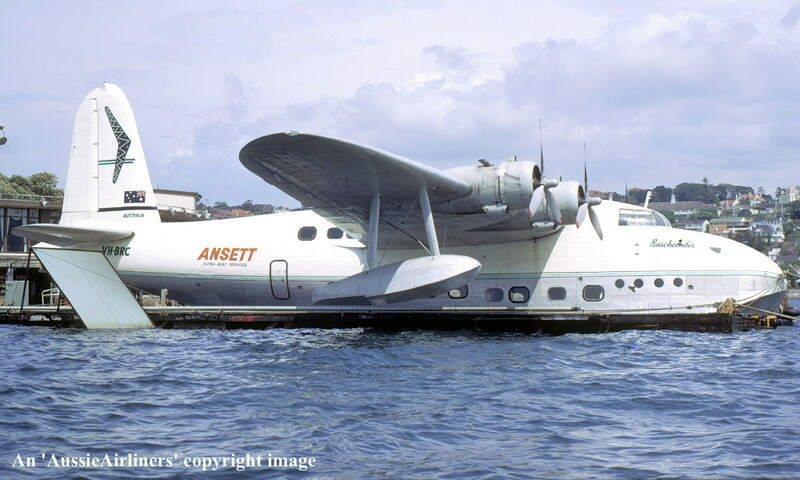 Ansett Flying Boat Services - 'Beachcomber' at Rose Bay, Sydney, August 1974. 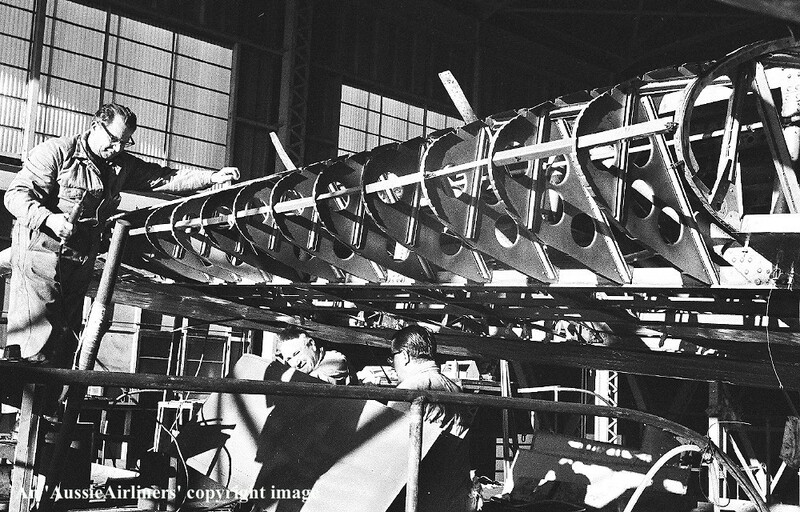 A new starboard wing leading edge structure had to be built. 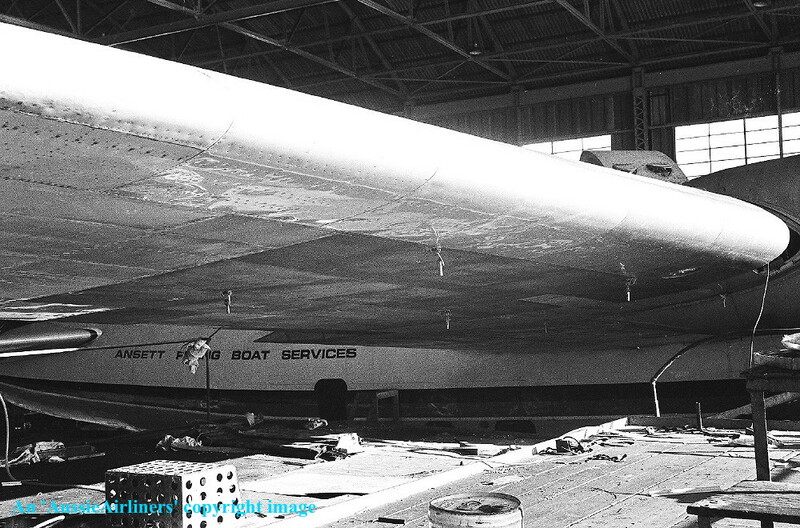 The repaired and reskinned starboard wing leading edge. 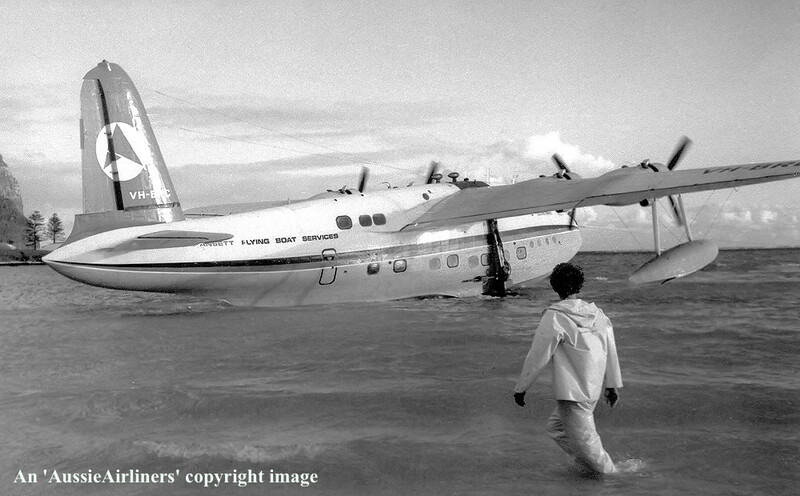 VH-BRC. 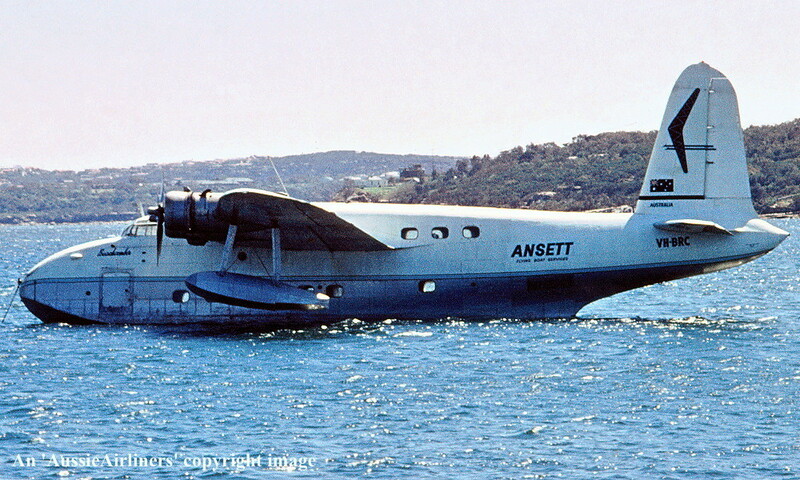 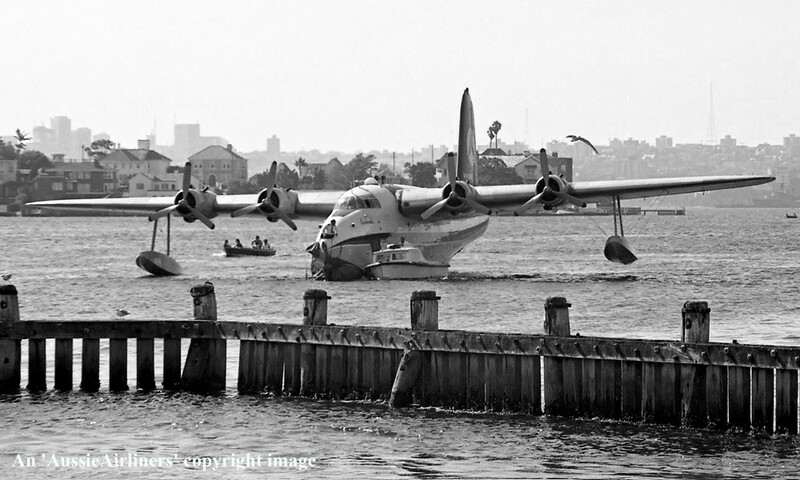 Ansett Flying Boat Services - 'Beachcomber' at Rose Bay, Sydney, August 29, 1974. 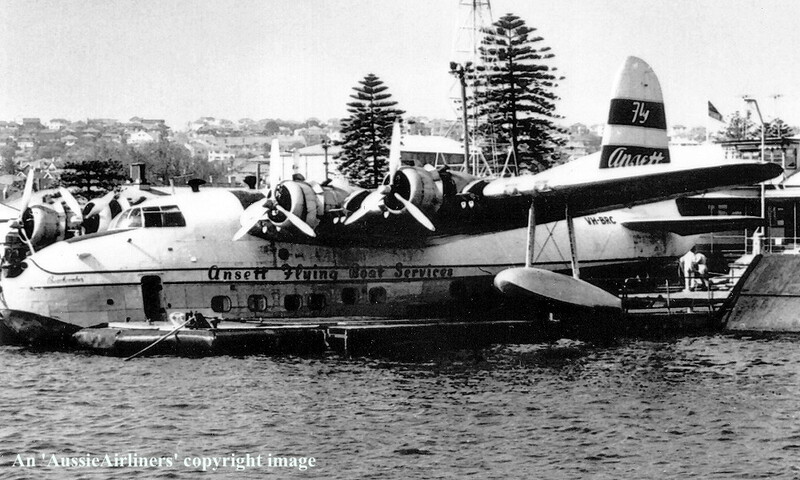 With repairs complete it was now time to return the aircraft to the waters of Sydney Harbour. 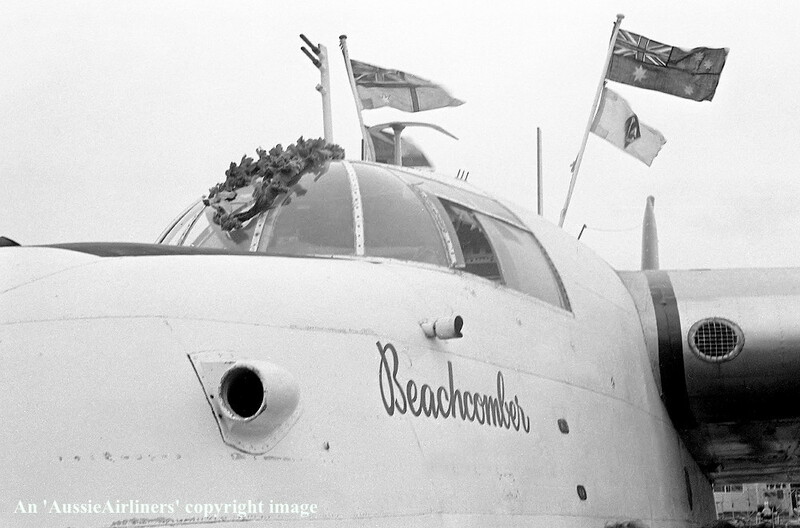 Mr Ron Bush, Manager of the Flying Boat Base supervises the relaunch of 'Beachcomnber'. 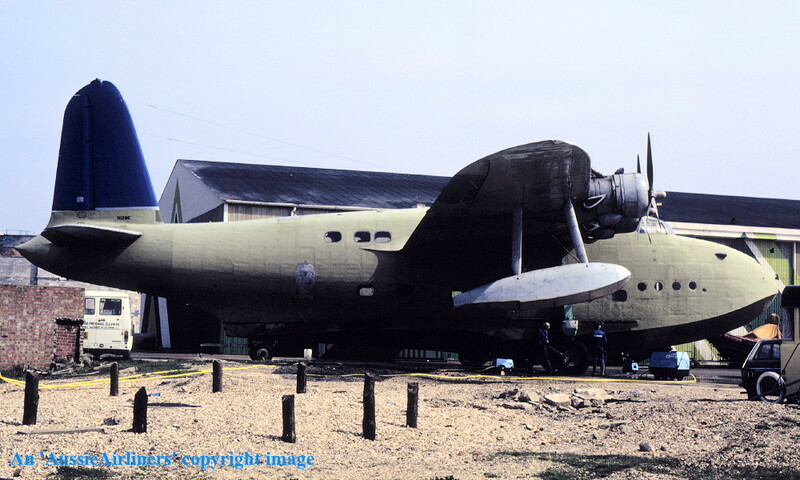 VH-BRC. 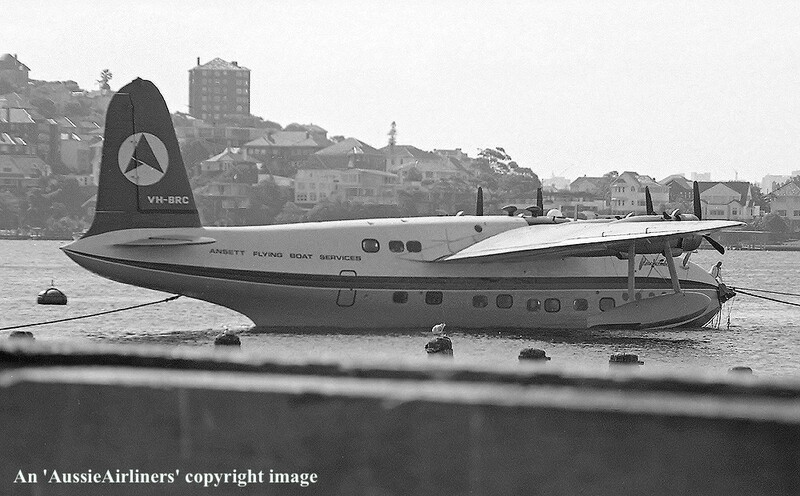 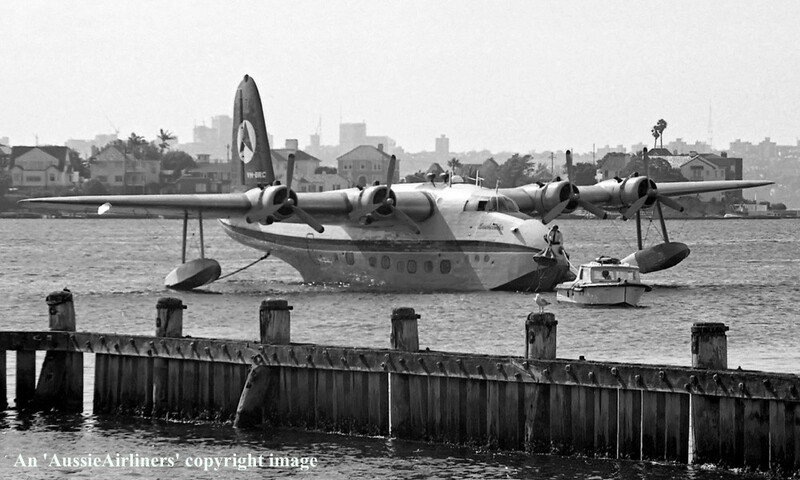 Ansett Flying Boat Services - 'Beachcomber' at Rose Bay, Sydney, September 10, 1974. 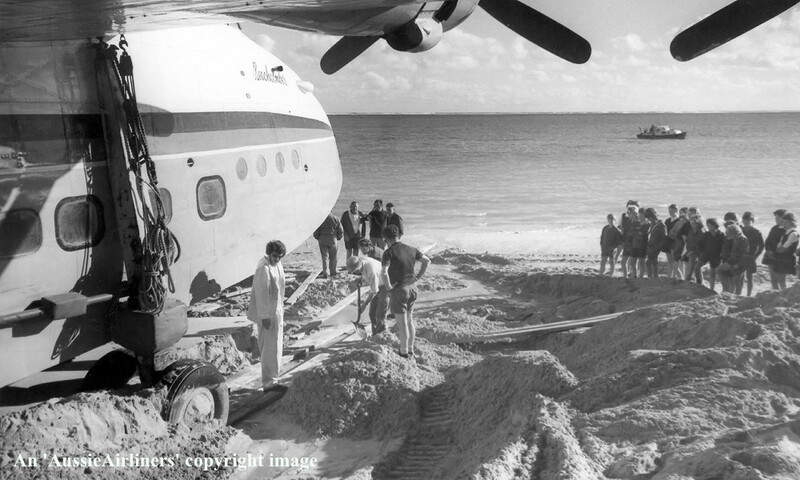 The end of a golden era - the last commercial flight to Lord Howe Island. 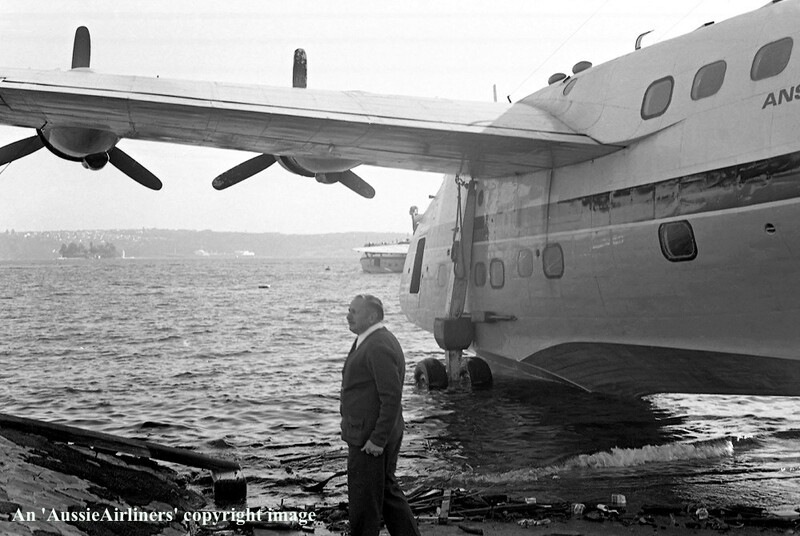 Captain Lloyd Maundrel accepts the last consignment of Royal Mail to be carried on a Short Flying Boat anywhere in the world. 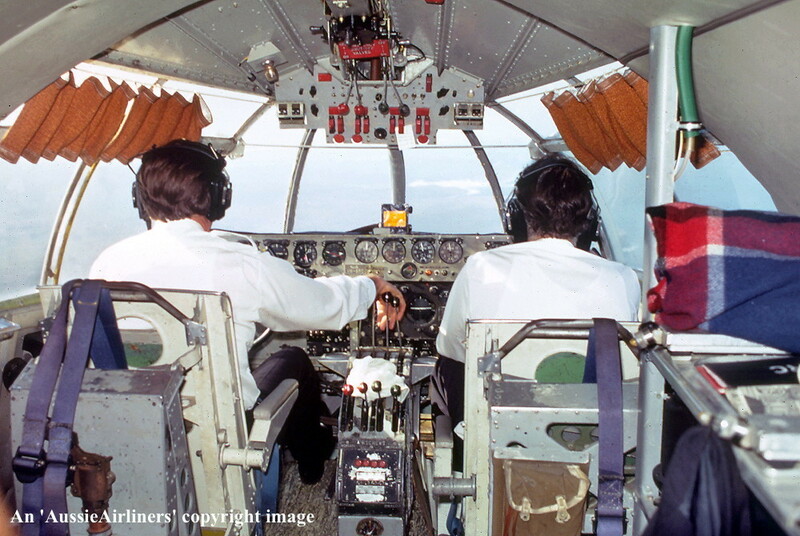 L to R: Lindy McKew (flight attendant); Captain Lloyd Maundrel (PIC); Lester Lewis (steward); Captain Bill Wilcher (co-pilot); Jim Davidson (Flight Engineer). 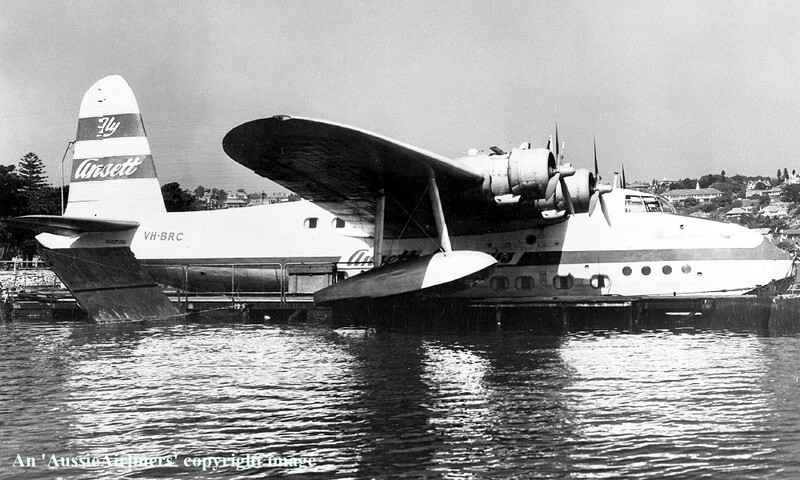 N158C. 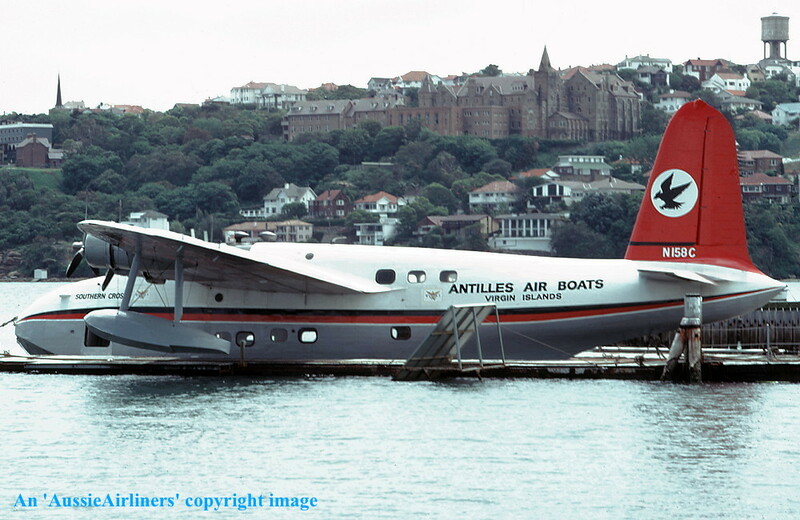 Antilles Air Boats - in the basic Ansett 'delta' livery at Rose Bay, Sydney, October 1974. 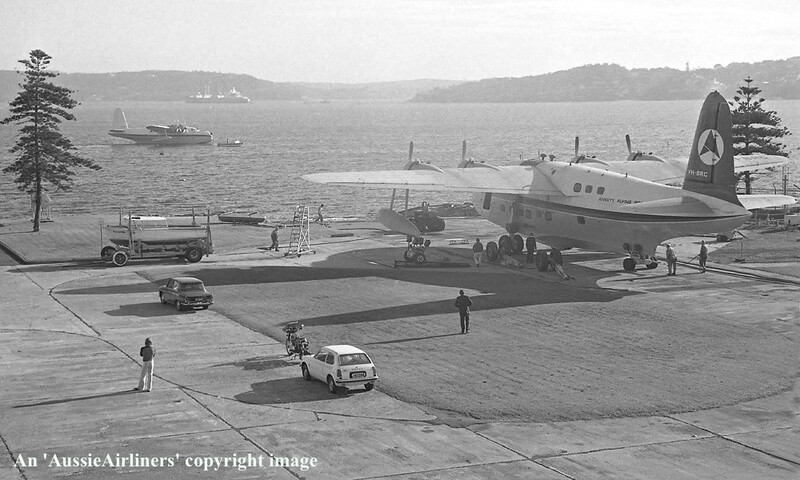 The aircraft is prepared for its ferry flight to the Virgin Islands. 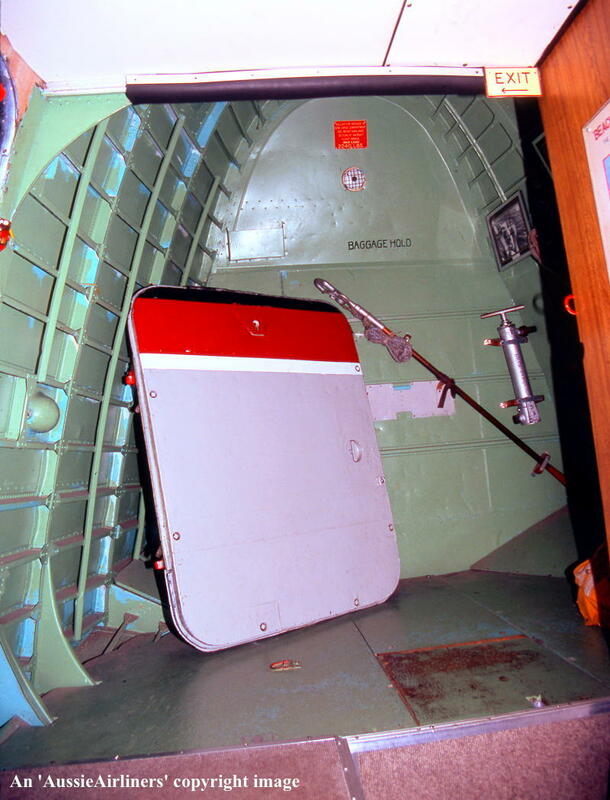 N158C. 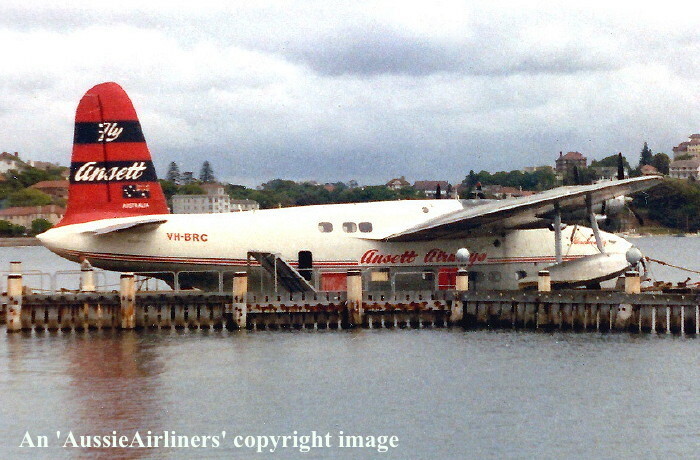 Antilles Air Boats - 'Southern Star' in the basic Ansett 'delta' livery at Rose Bay, Sydney, November 1974. 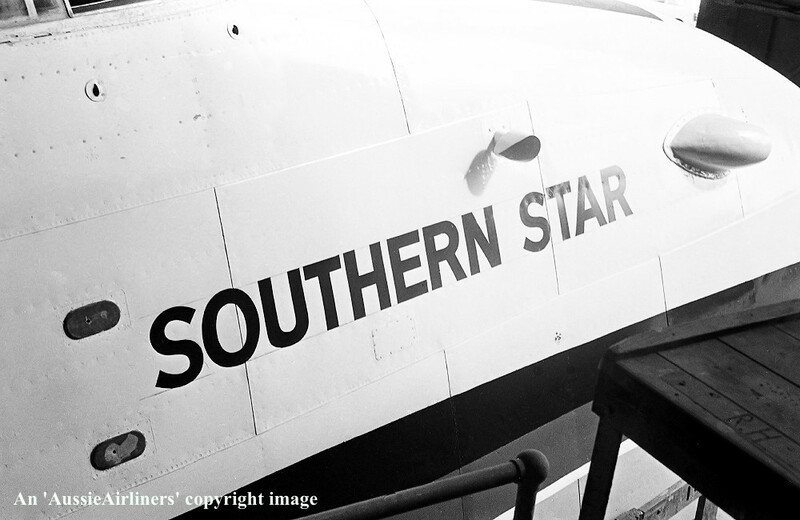 The name that never was. 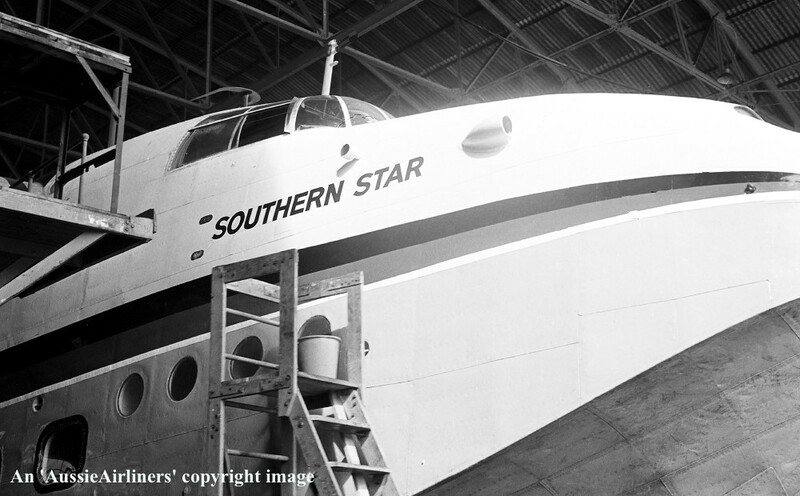 The aircraft was originally named 'Southern Star' but it was subsequently changed at the suggestion of Maureen O'Hara. 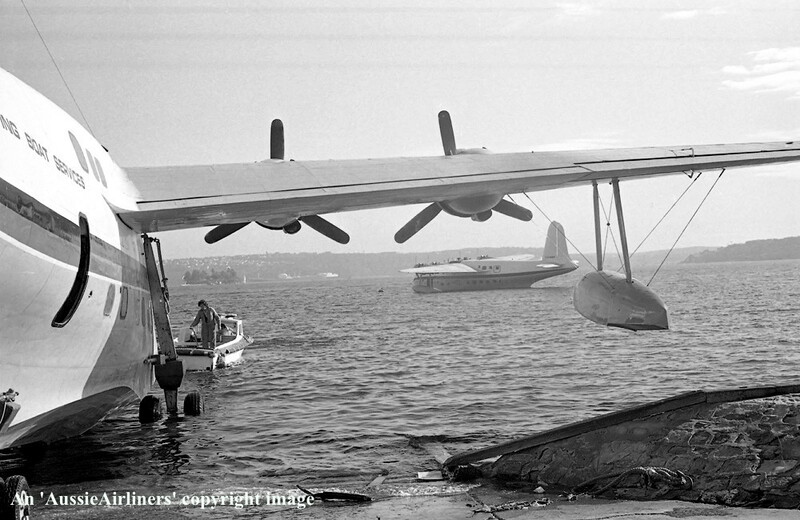 N158C. 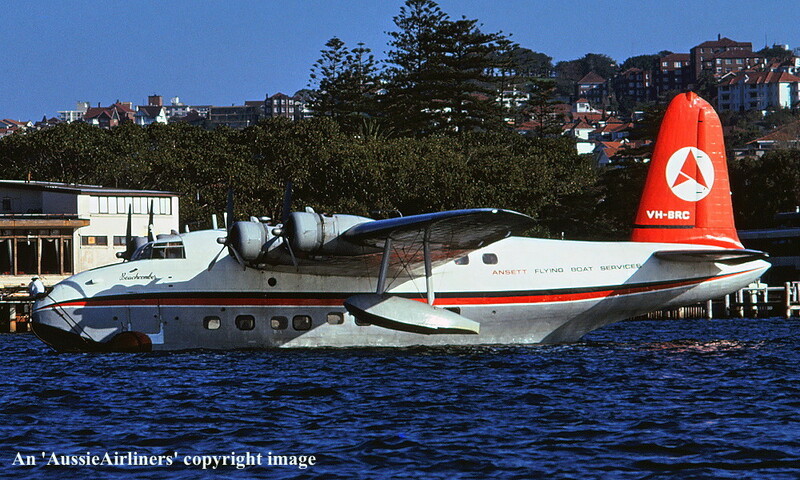 Antilles Air Boats - 'Southern Cross' in the basic Ansett 'delta' livery at Rose Bay, Sydney, November 1974. 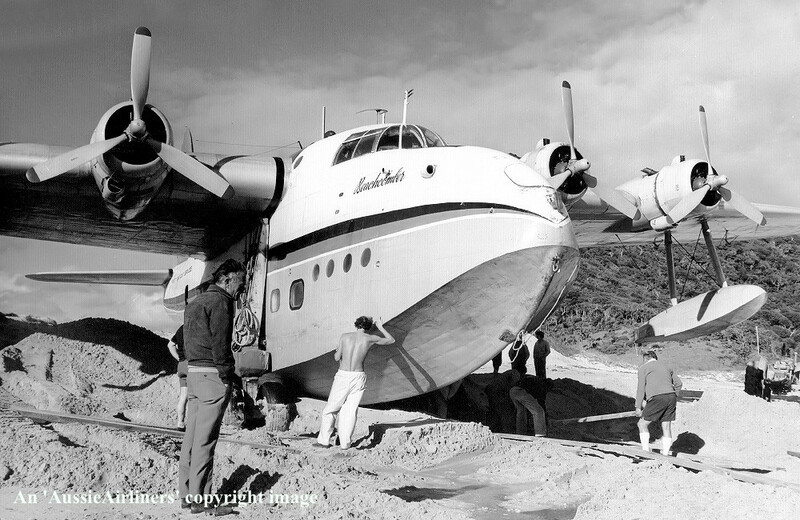 VH-BRC. 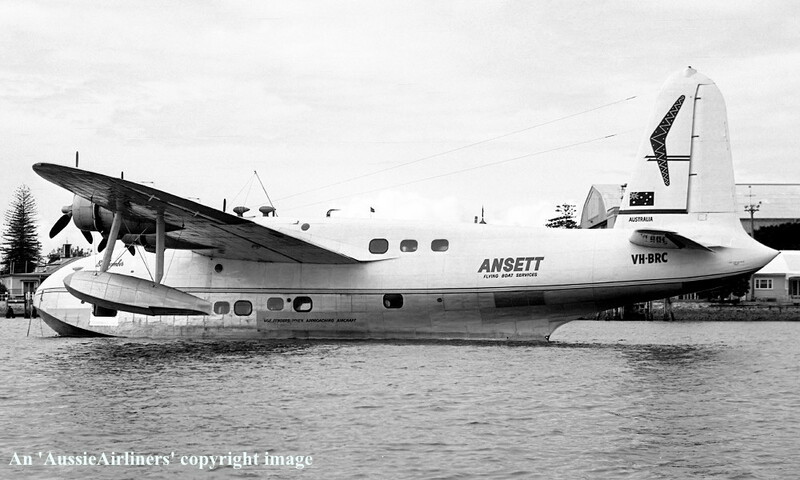 Antilles Air Boats - 'Southern Cross' in the basic Ansett 'delta' livery at Rose Bay, Sydney, November 1974. 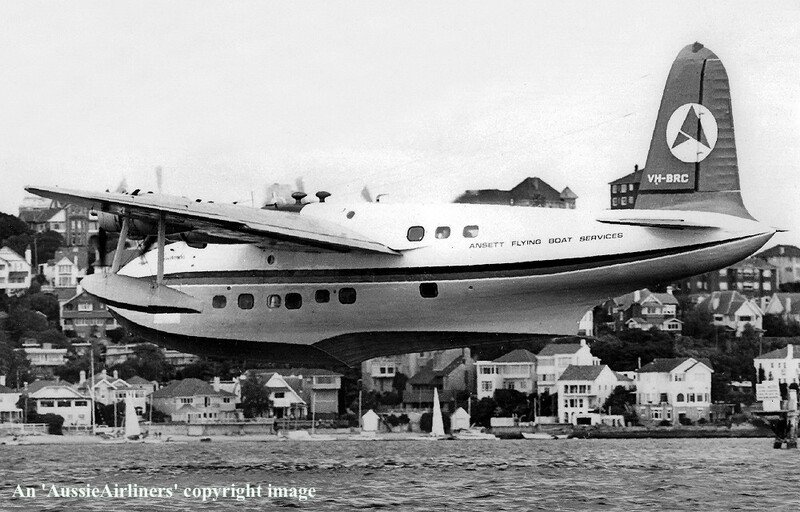 N158C. 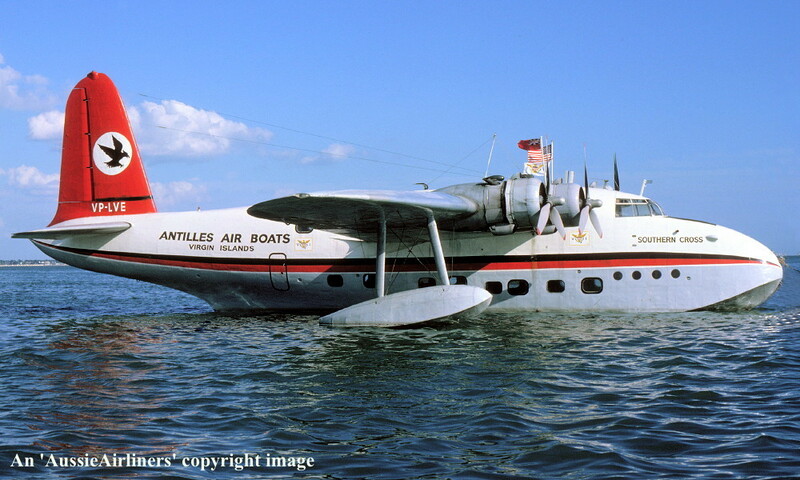 Antilles Air Boats - 'Southern Cross' somewhere over the Pacific Ocean during the ferry flight, November 1974. 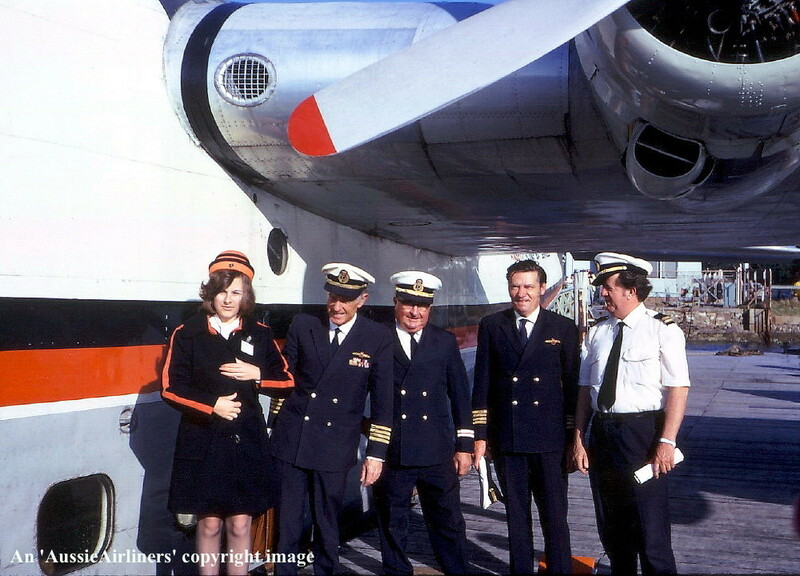 L to R: Margaret Holle; Noel Holle; Unknown; Captain Brian Monkton; Maureen O'Hara. 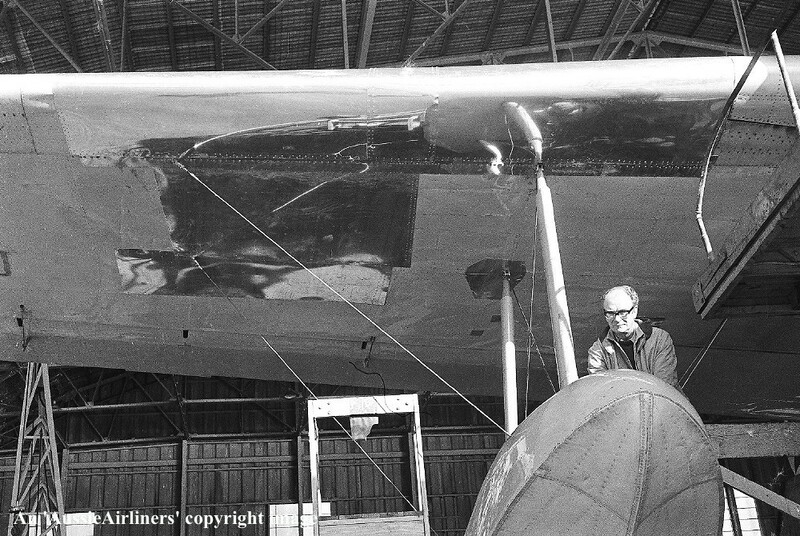 N158C. 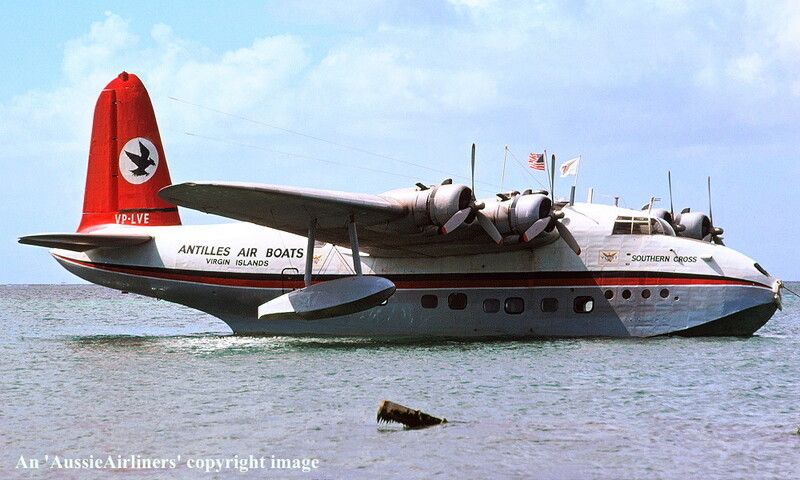 Antilles Air Boats - 'Southern Cross' in the basic Ansett 'delta' livery at Honolulu, November 1974. 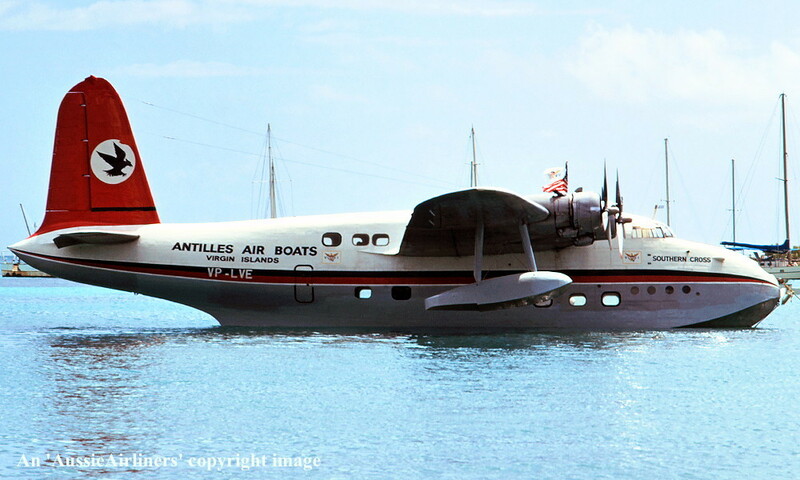 VP-LVE. 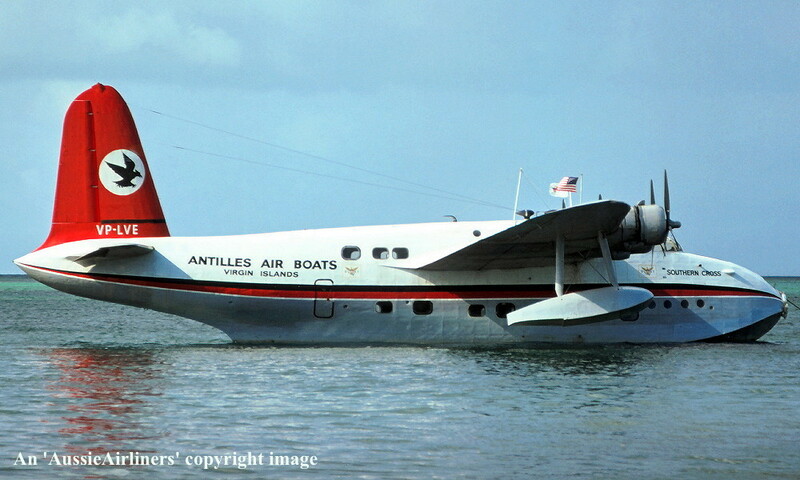 Antilles Air Boats - 'Southern Cross' in the standard livery at St Croix, Virgin Islands, May 06, 1975. 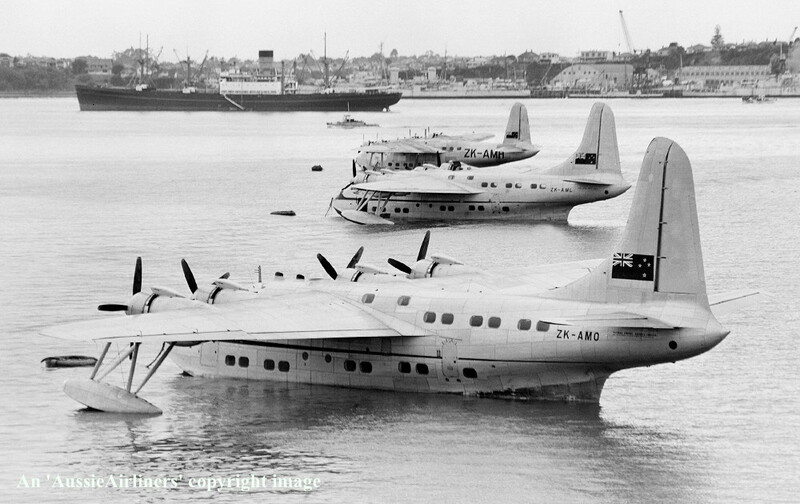 VP-LVE. 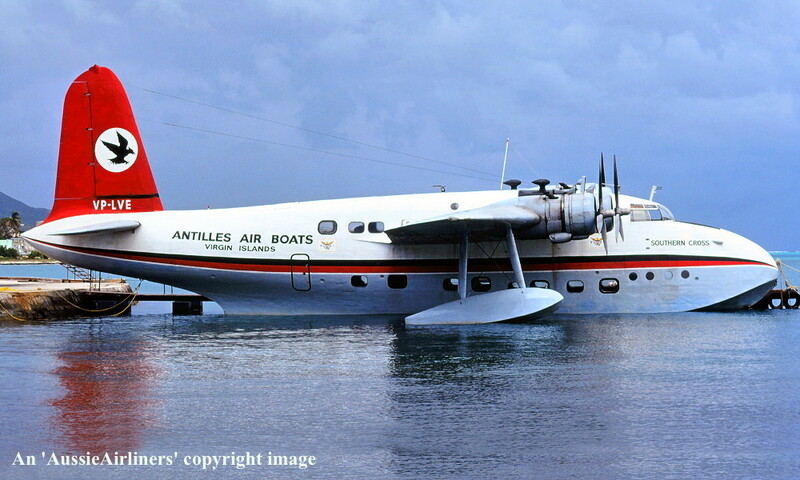 Antilles Air Boats - 'Southern Cross' in the standard livery at St Croix, Virgin Islands, May 1975. 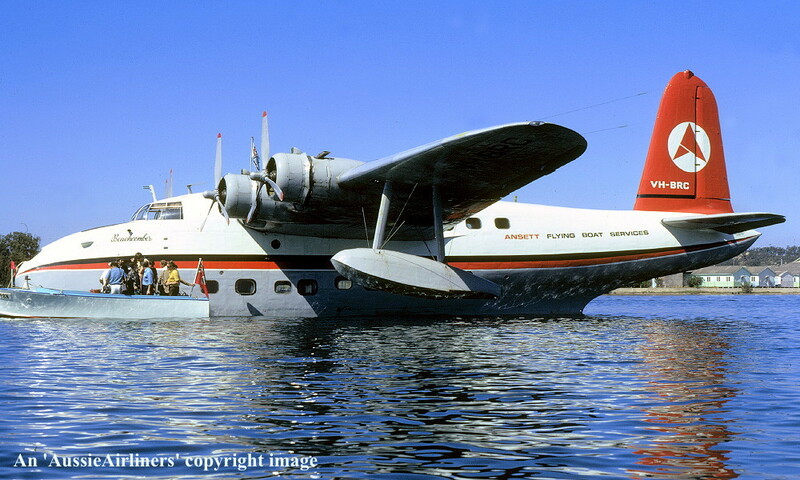 VP-LVE. 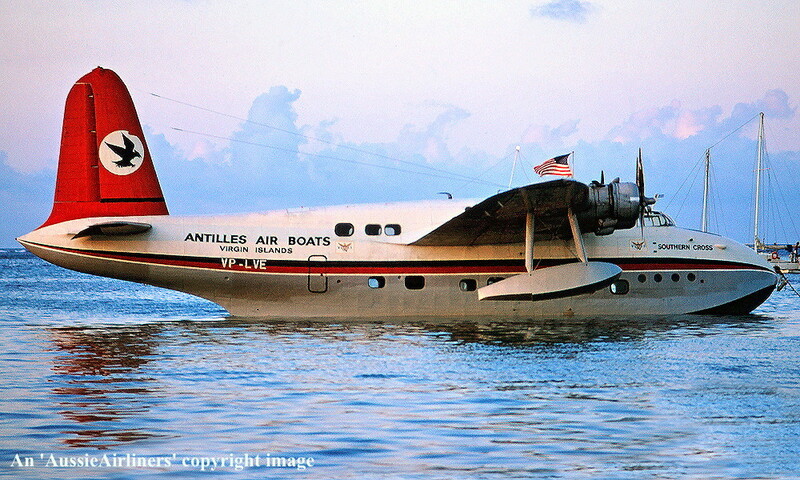 Antilles Air Boats - 'Southern Cross' in the standard livery at St Croix, Virgin Islands, August 20, 1975. 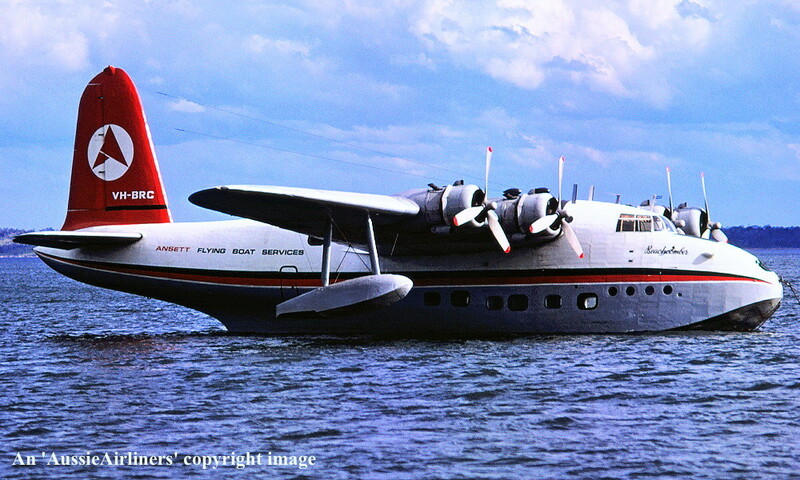 VP-LVE. 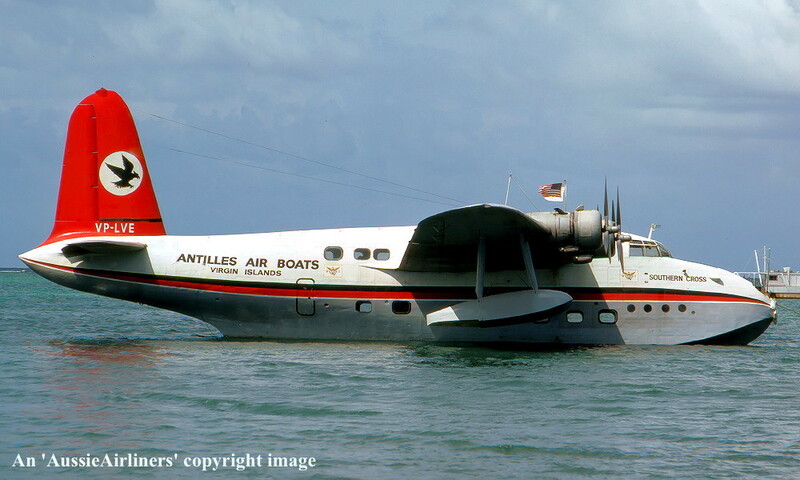 Antilles Air Boats - 'Southern Cross' in the standard livery at St Croix, Virgin Islands, August 30, 1975. 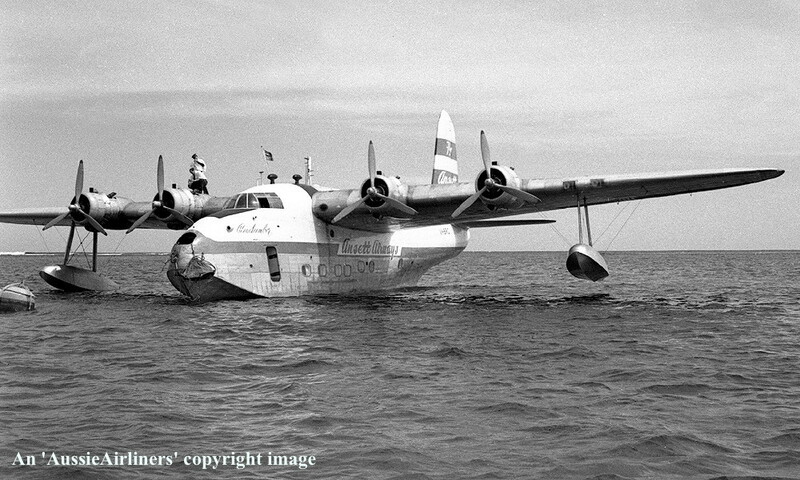 VP-LVE. 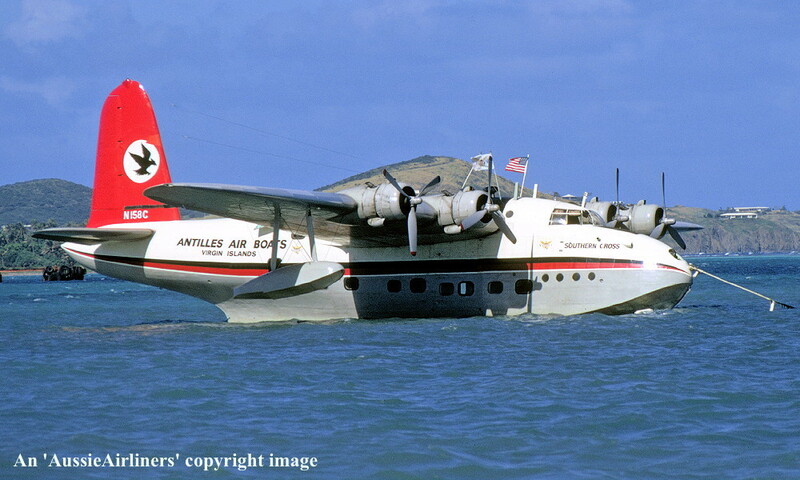 Antilles Air Boats - 'Southern Cross' in the standard livery at St Croix, Virgin Islands, September 1975. 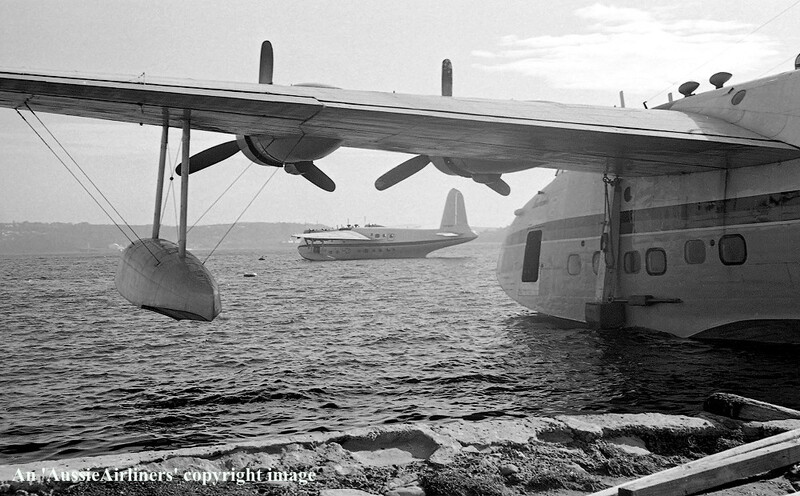 VP-LVE. 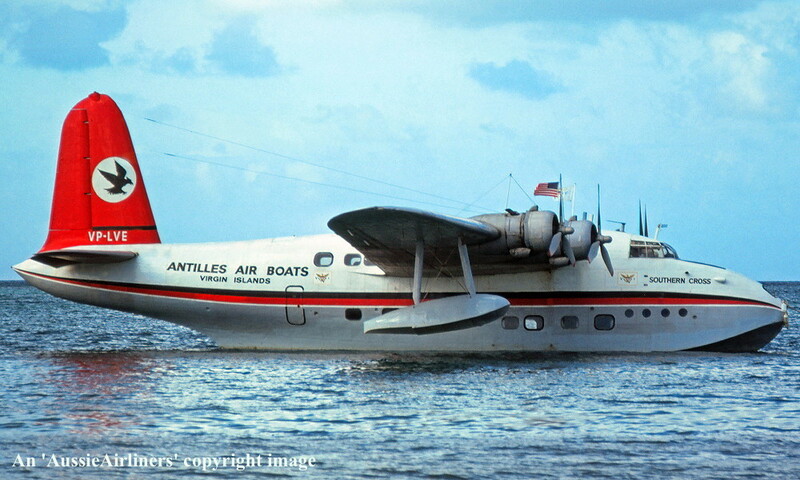 Antilles Air Boats - 'Southern Cross' in the standard livery at St Croix, Virgin Islands, January 1976. 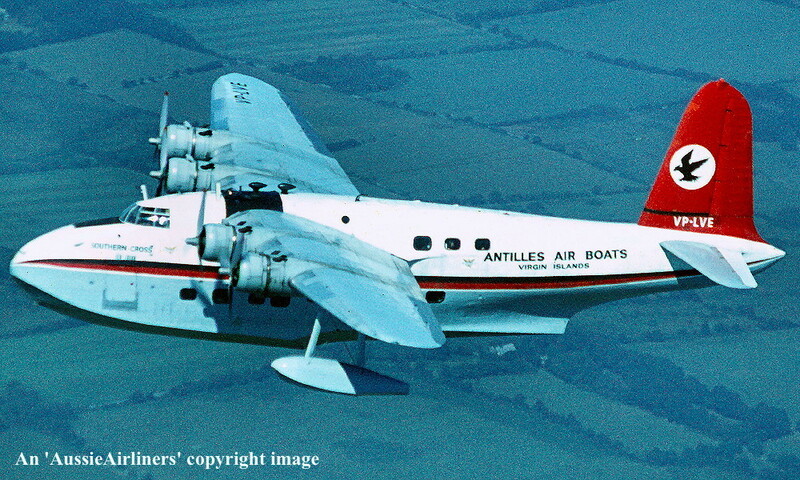 VP-LVE. 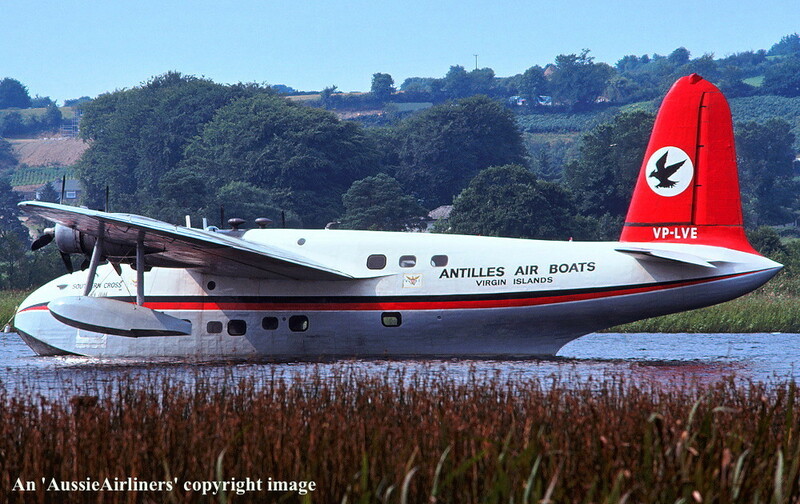 Antilles Air Boats - 'Southern Cross' in the standard livery at Lough Derg, Killaloe, Ireland, July 1976. 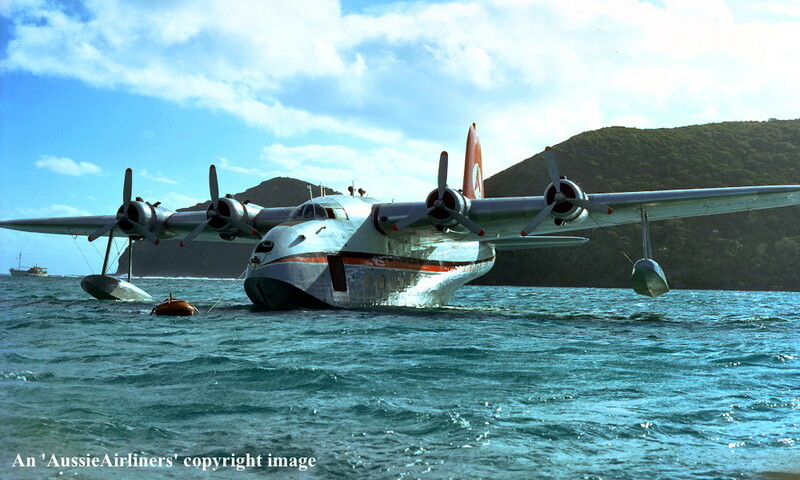 VP-LVE. 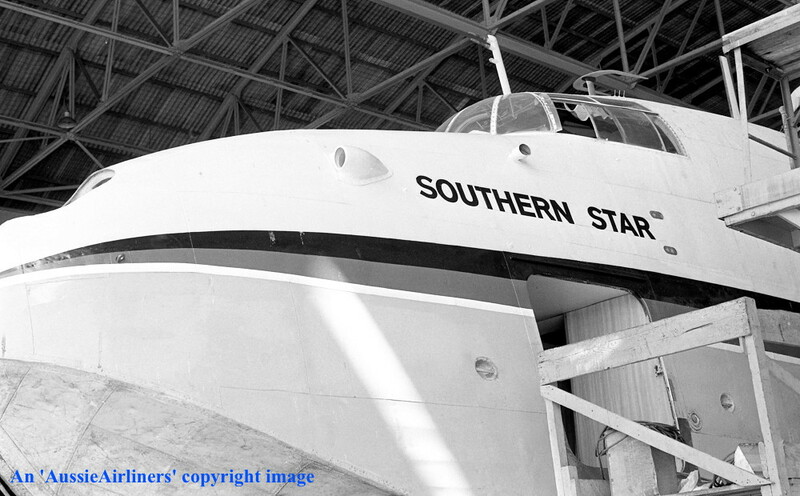 Antilles Air Boats - 'Southern Cross' in the standard livery at Studland Bay, England, August 1976. 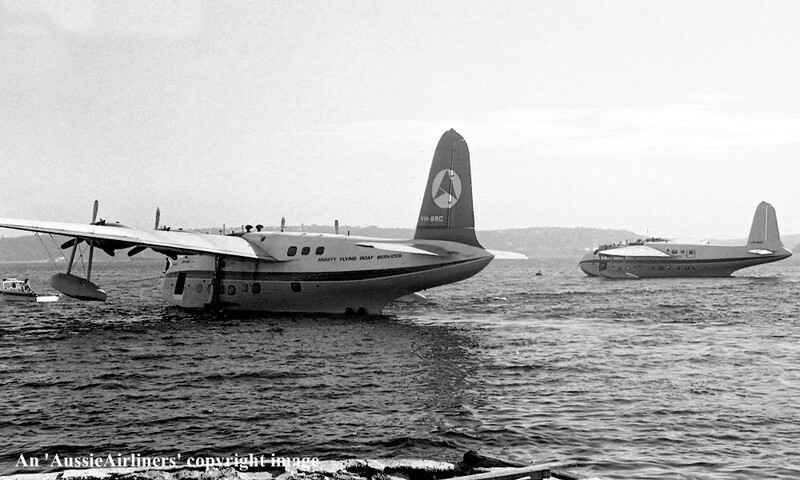 VP-LVE. 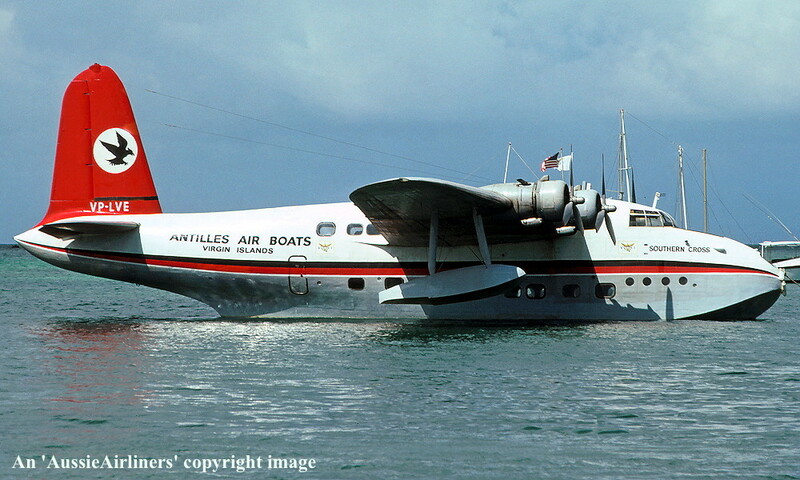 Antilles Air Boats - 'Southern Cross' in the standard livery at St Croix, Virgin Islands, April 1977. 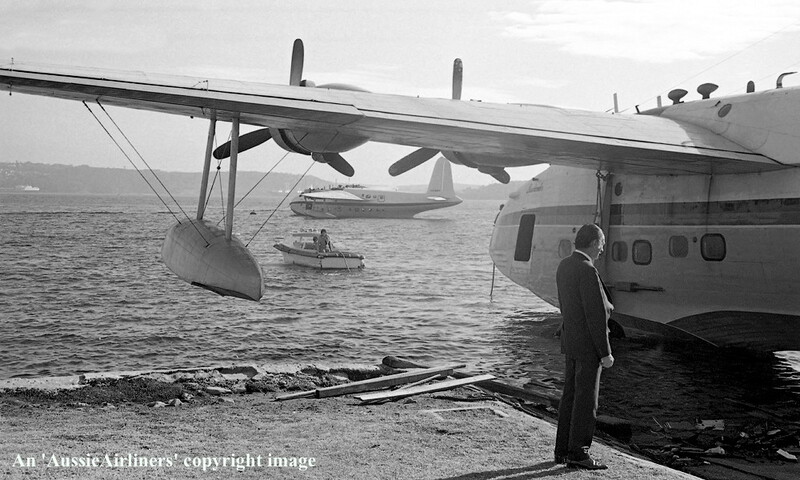 VP-LVE. 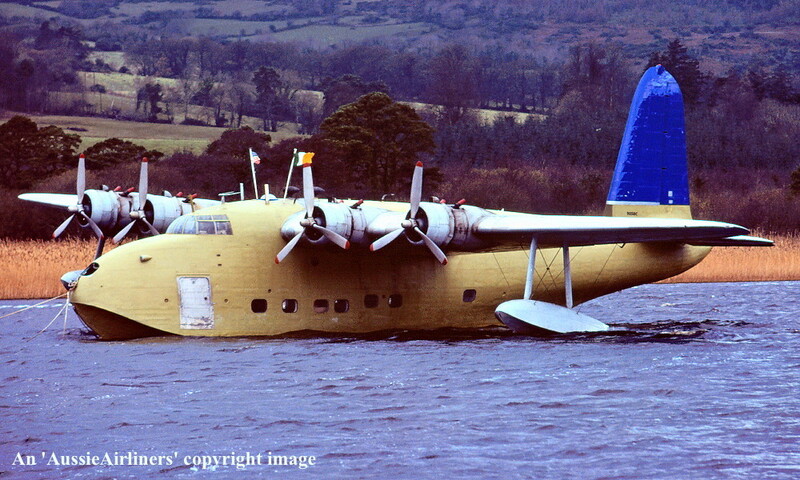 Antilles Air Boats - 'Southern Cross' in the standard livery at Lough Derg, Killaloe, Ireland, August 1977. 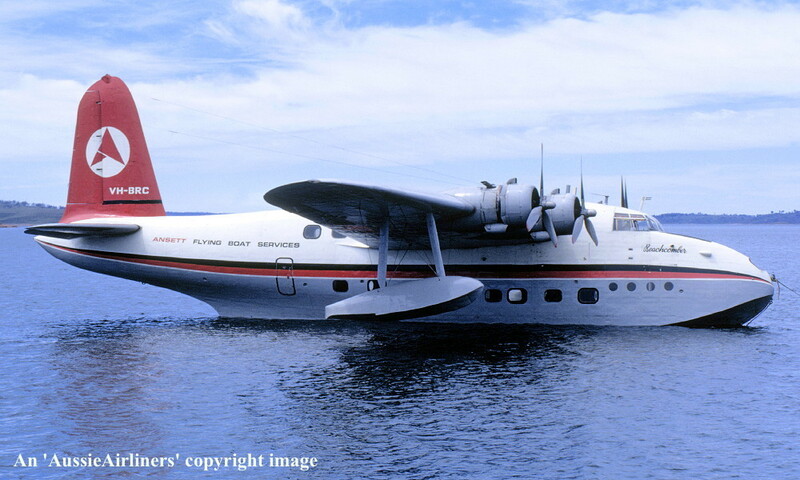 VP-LVE. 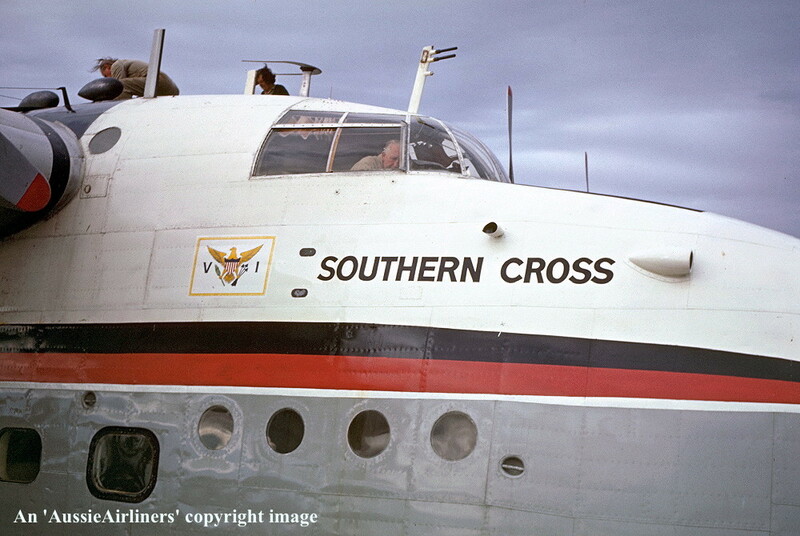 Antilles Air Boats - 'Southern Cross' in the standard livery somewhere over England, August 1977. 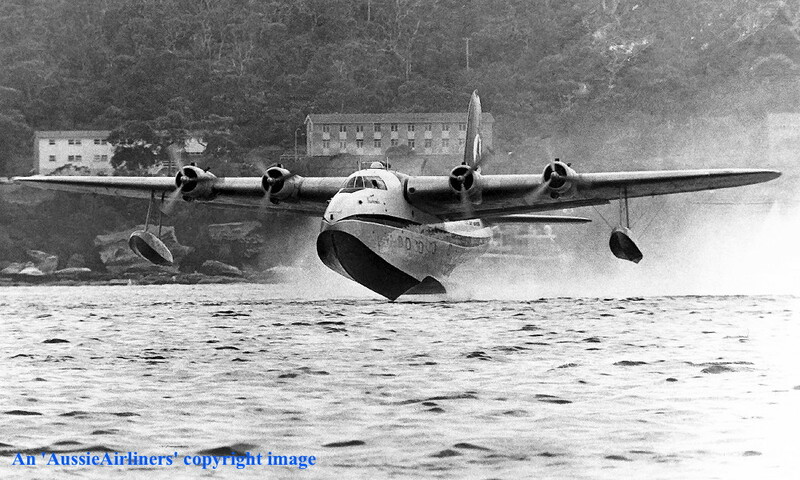 VP-LVE. 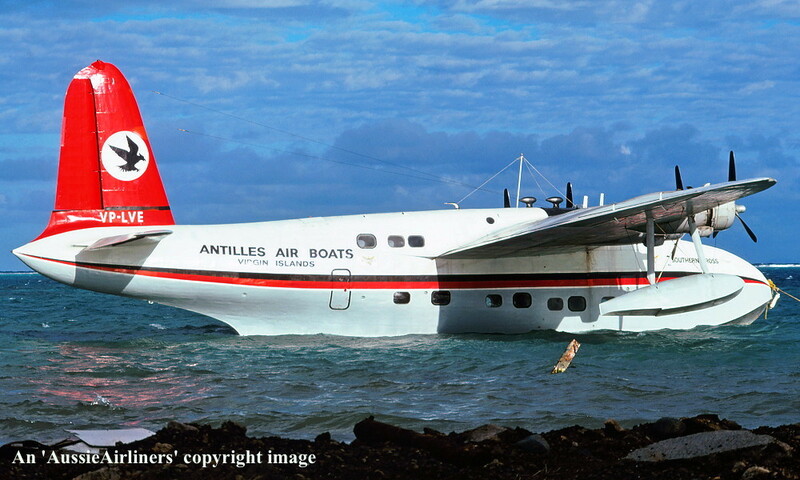 Antilles Air Boats - 'Southern Cross' in the standard livery at St Croix, Virgin Islands, April 1978. 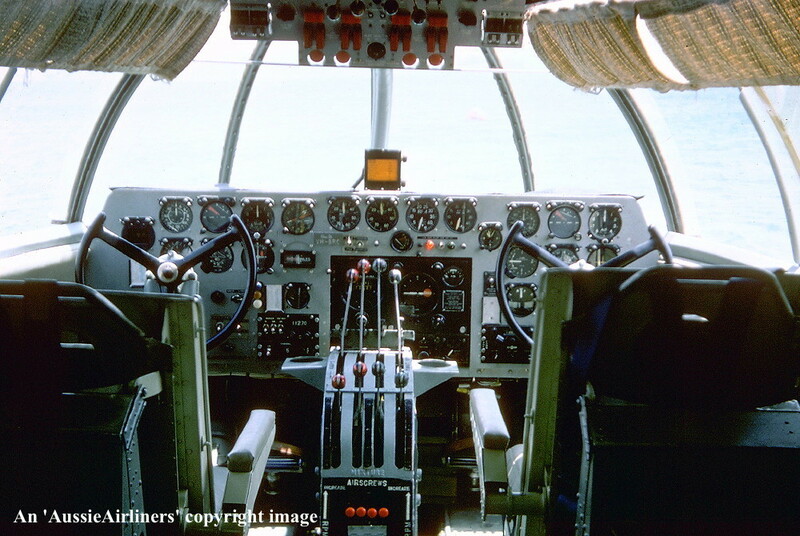 N158C. 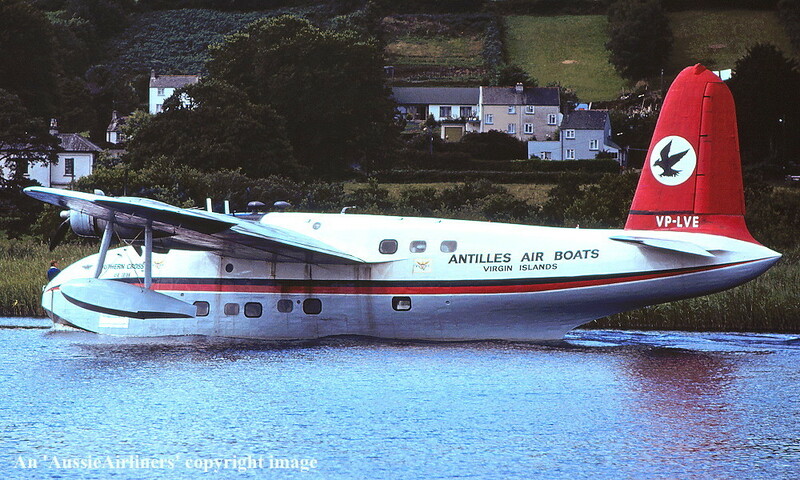 Antilles Air Boats - in the basic primer livery at Lough Derg, Killaloe, Ireland, January 1981. 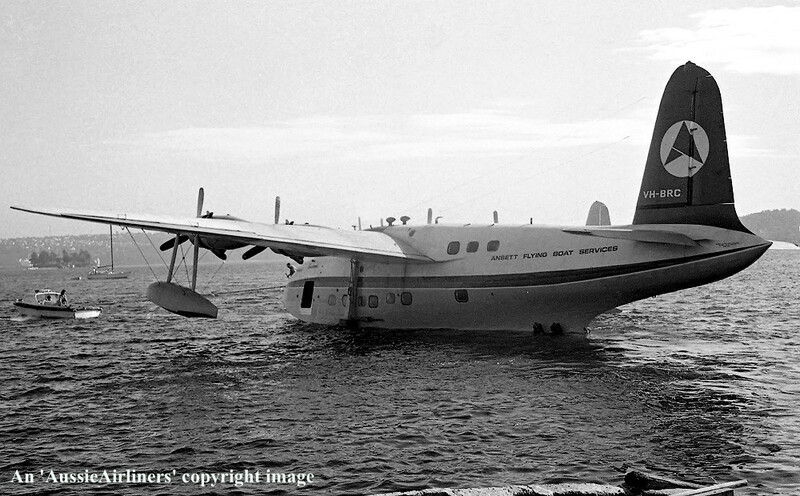 N158C. 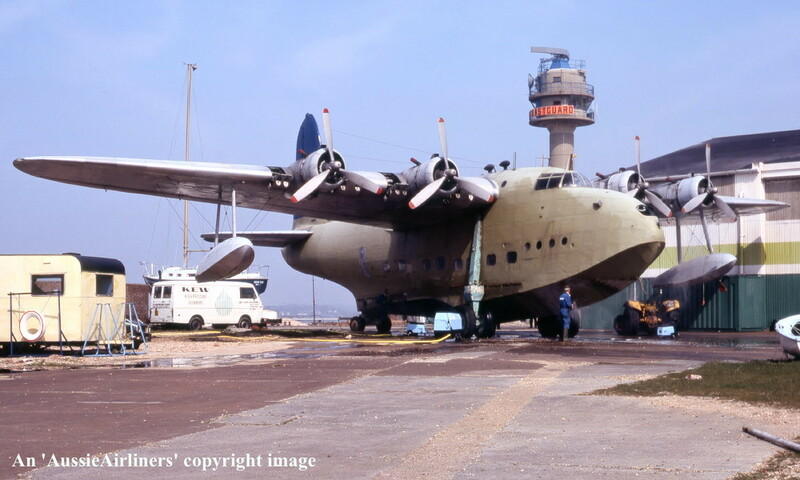 Antilles Air Boats - in the basic primer livery at Calshot, England, April 1981. 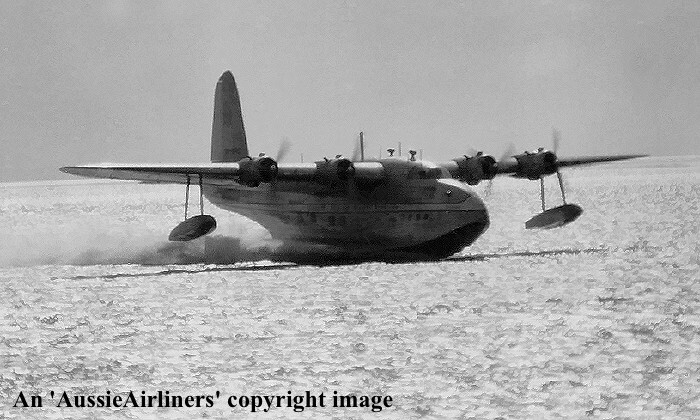 N158C. 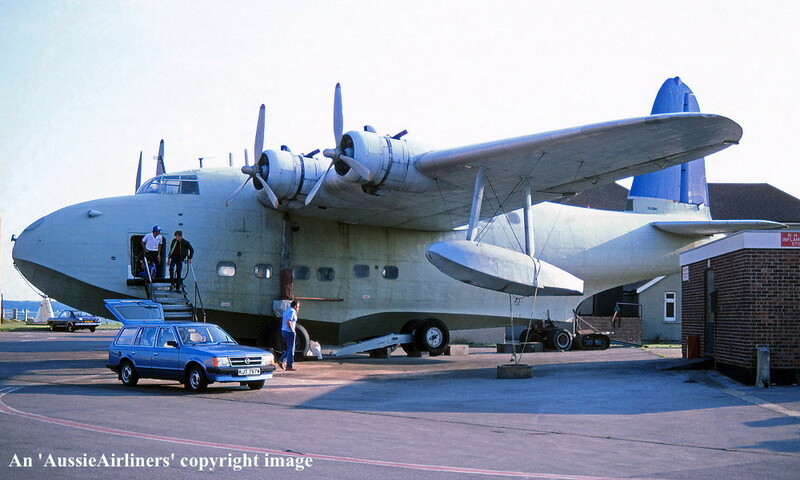 Antilles Air Boats - in the basic primer livery at the Royal Navy Base HMS Deadalus, Lee-on-Solent, England, July 1981. 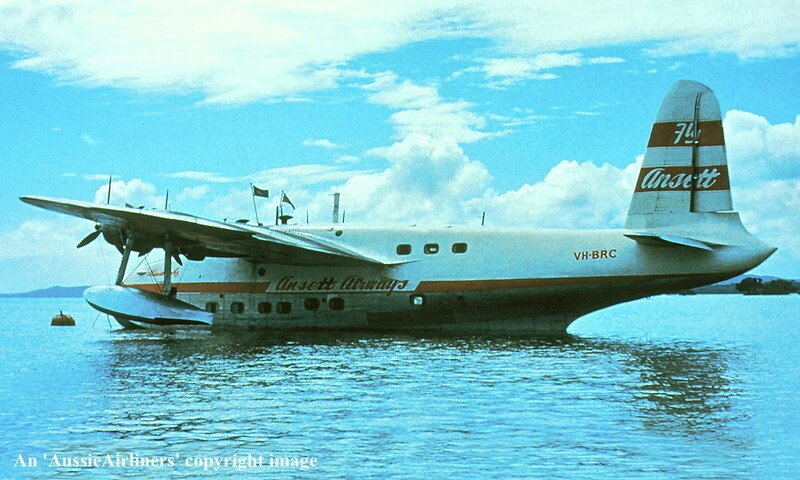 VH-BRC. 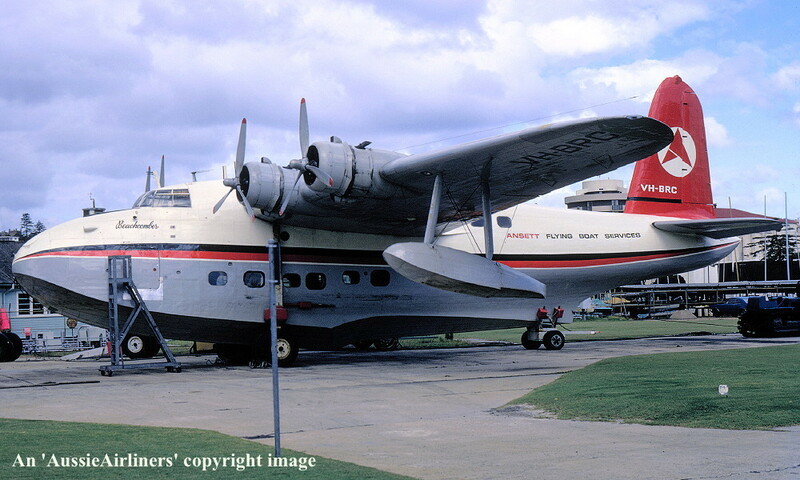 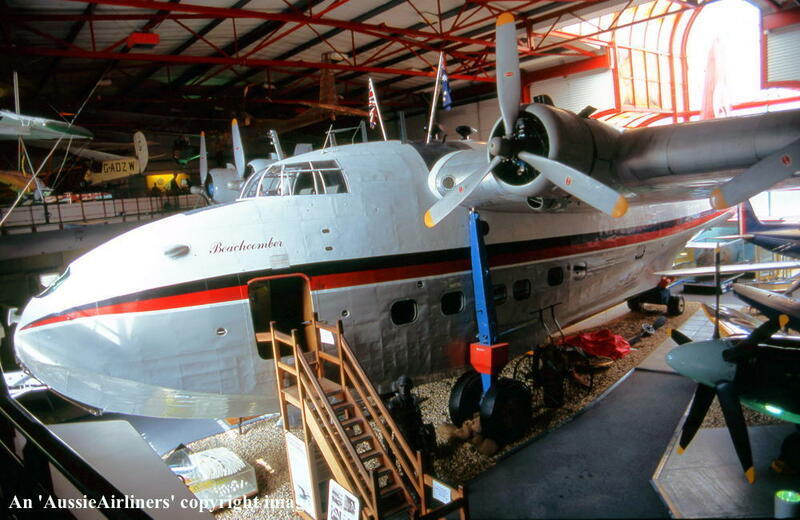 Ansett Flying Boat Services - 'Beachcomber' in the 'delta' livery at the Hall of Aviation, Southampton, England, August 2004. 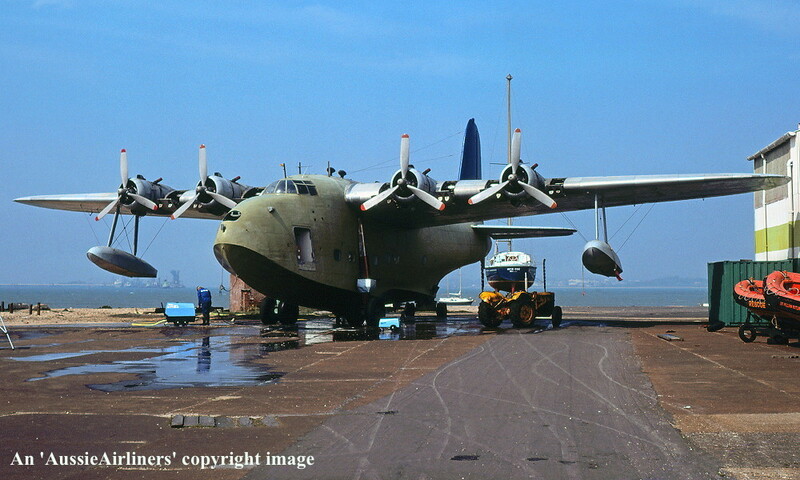 The following sequence of images depict the aircraft as it is preserved today. 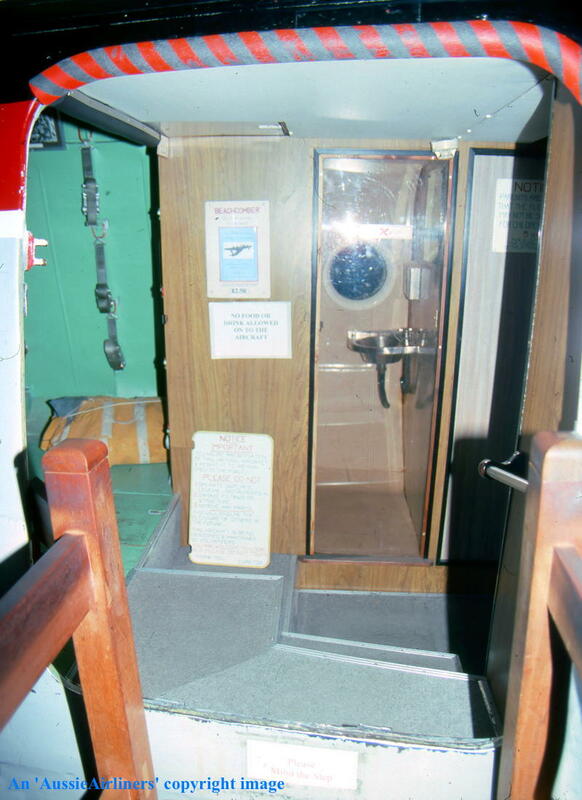 The entry vestibule step-down with the toilet opposite the main cabin door. 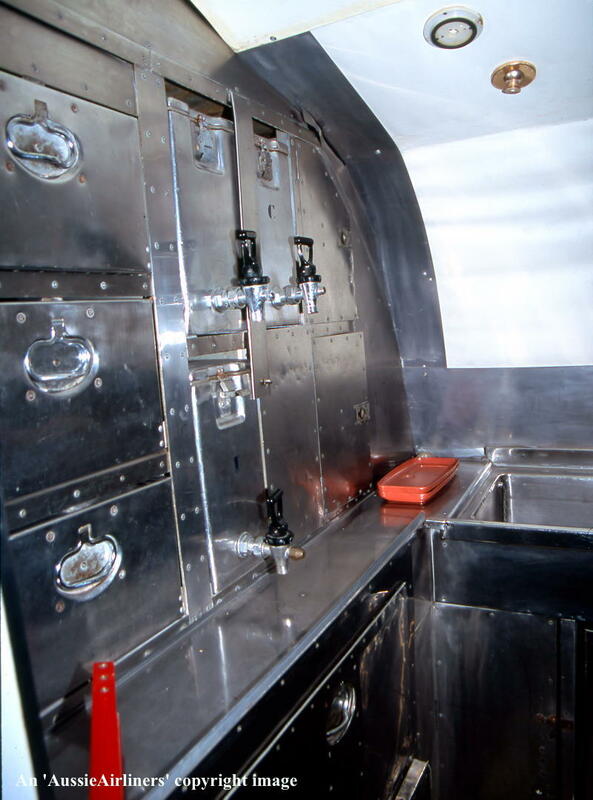 The toilet compartment consisted of an old-fashioned 'pan' system which did not flush. 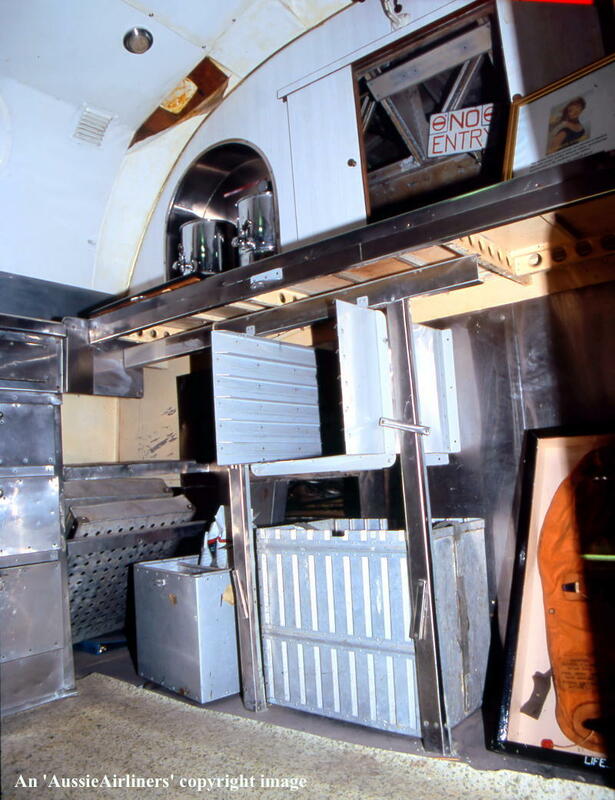 To the left of the entry vestibule was the forward freight hold with the nose mooring compartment in front of it. 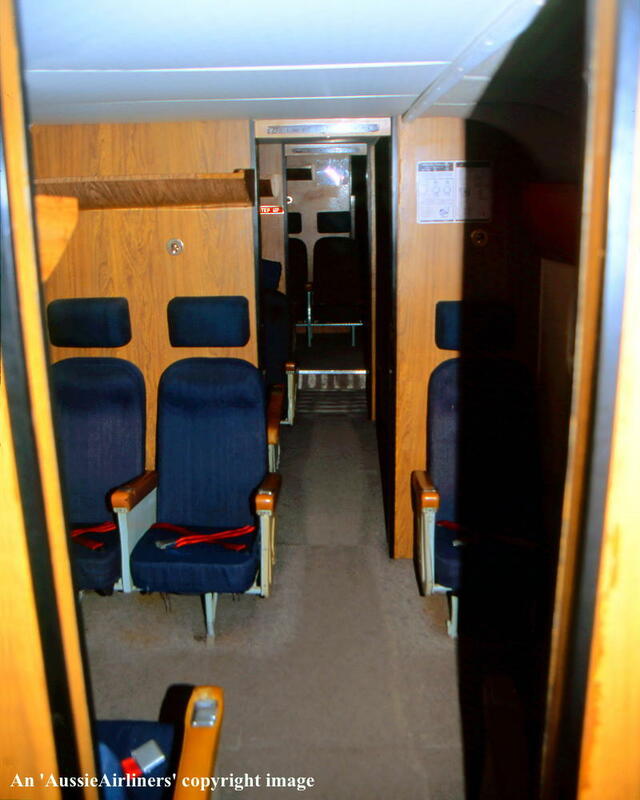 To the right of the entry vestibule was the lower deck passenger seating arranged in four cabins. 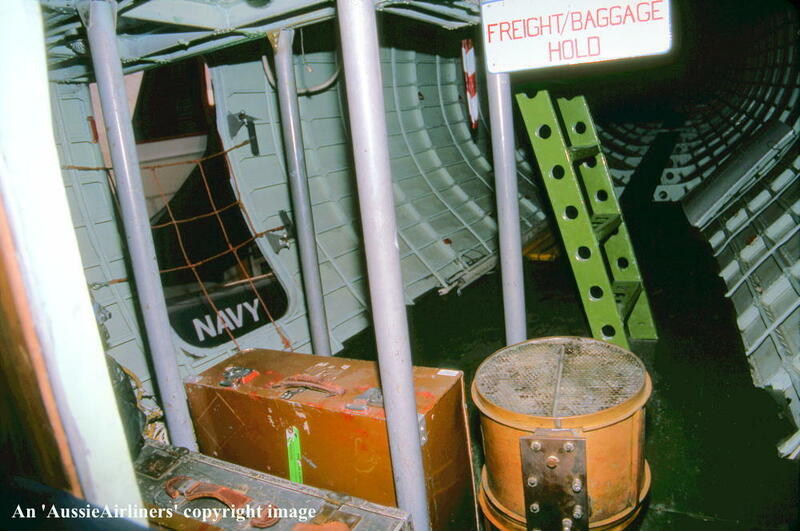 Access to the flight deck was via the ladder. 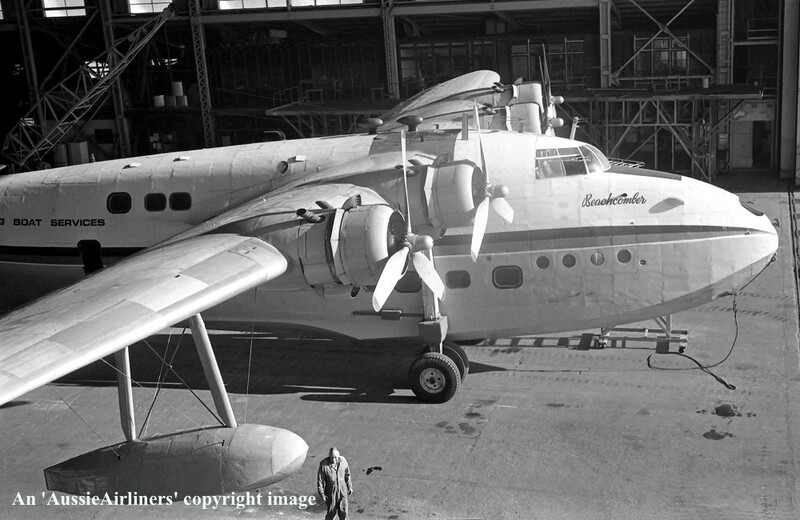 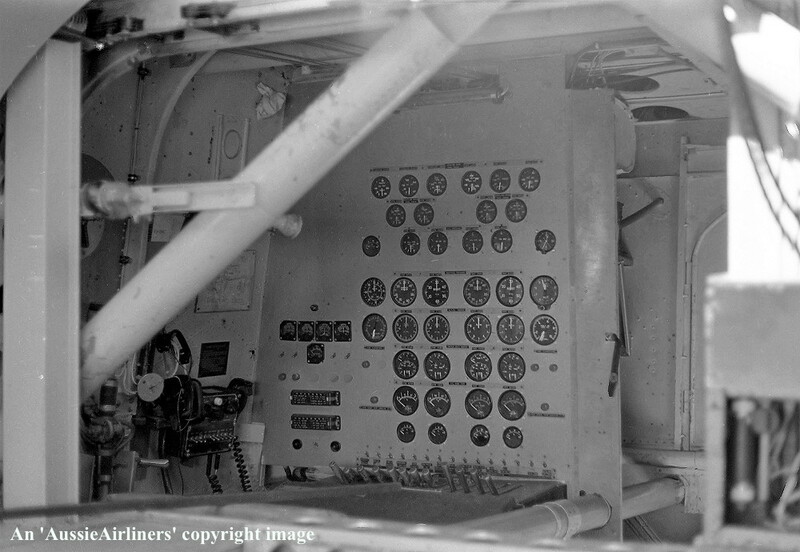 The first passenger cabin had seating for 7 passengers and the Flight Attendant. 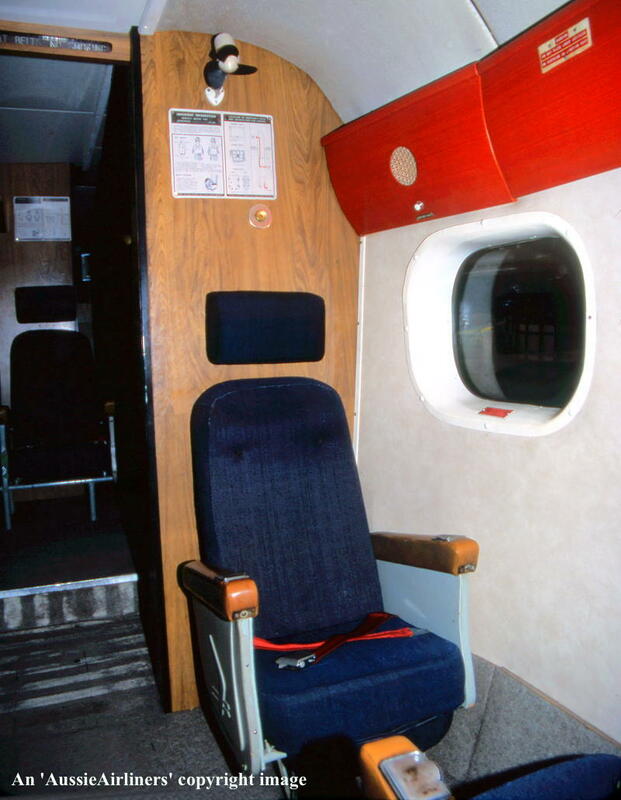 The second cabin - Cabin B - had seating for 8 passengers. 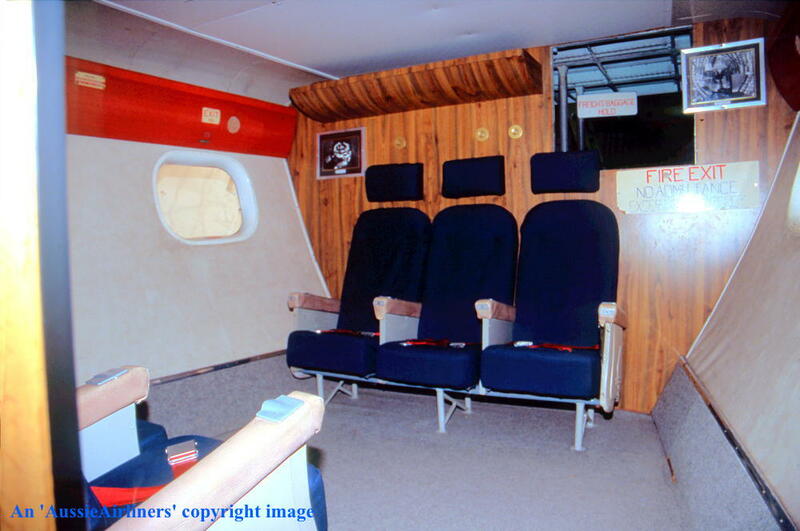 The second cabin - Cabin B - had seating for 8 passengers - including the two 'individual' seats with a modern airconditioning system. 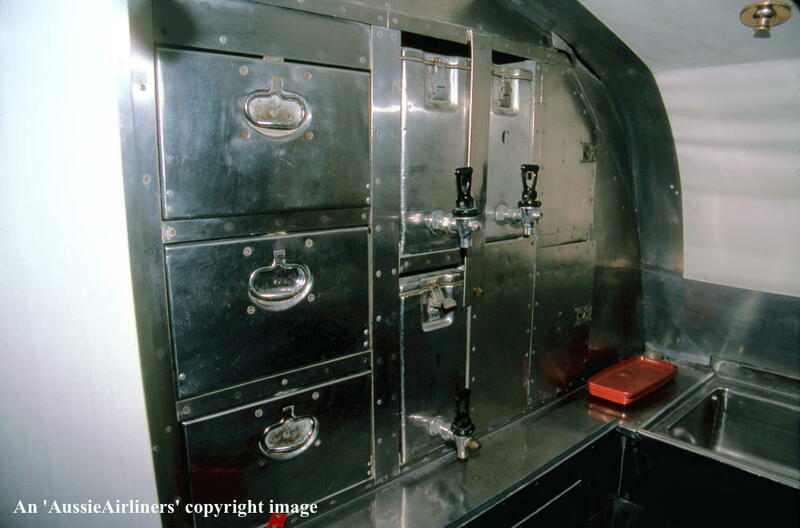 The third cabin on the lower deck - Cabin C - had seating for 8 passengers. 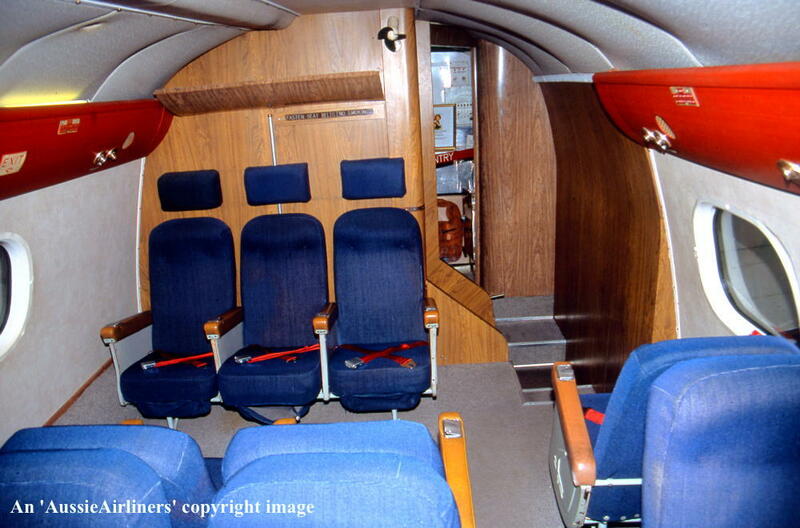 The third cabin on the lower deck - Cabin C - had seating for 8 passengers - this was the single seat. 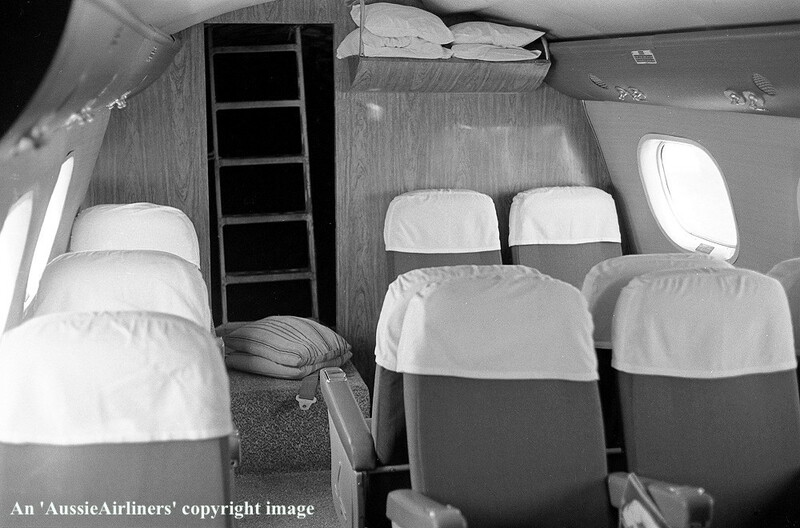 The fourth cabin on the lower deck - Cabin D - had seating for 5 passengers. 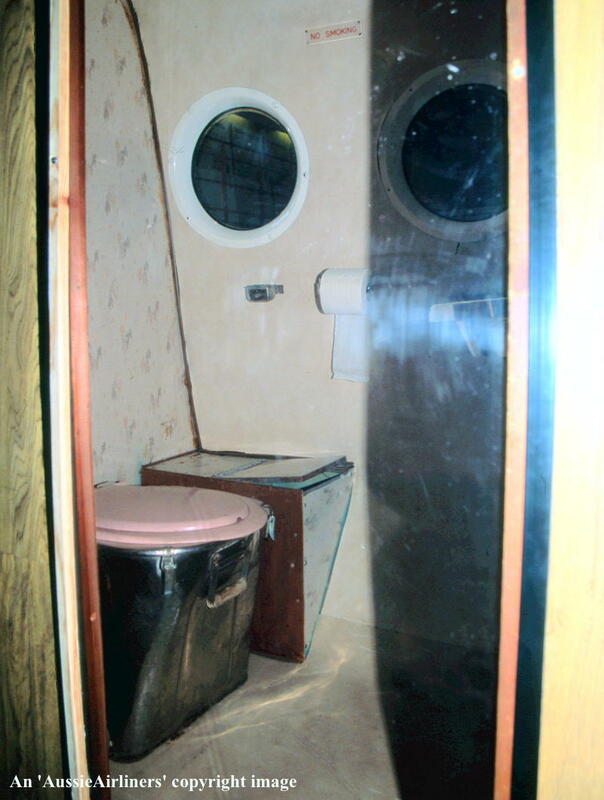 This cabin was liked by parents with young children because they had room to play on the floor. 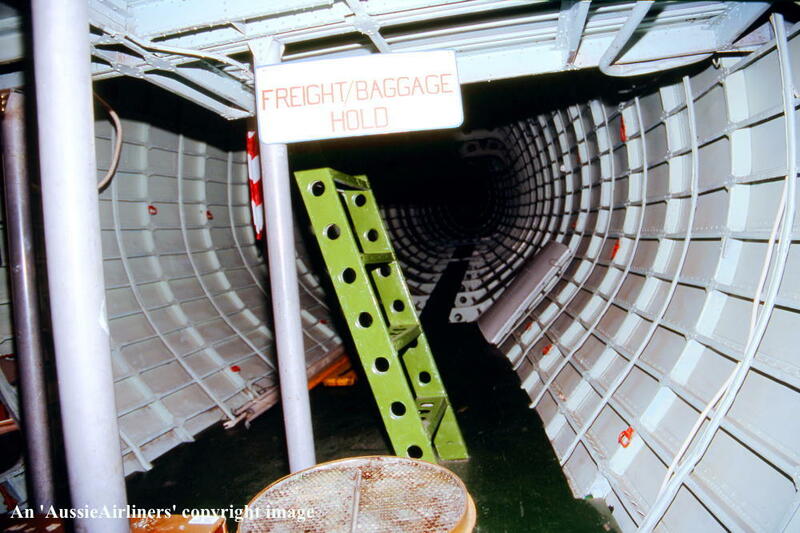 Behind Cabin D was the rear freight hold. 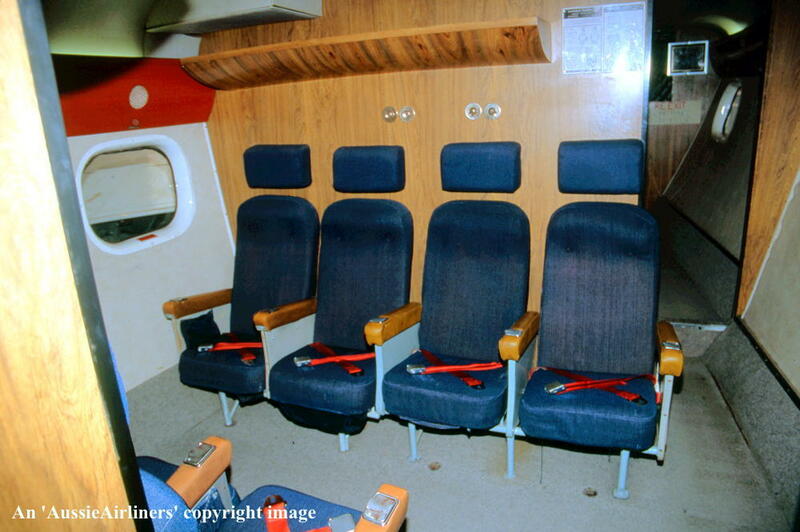 It could be accessed in flight from Cabin D or from the upper deck. 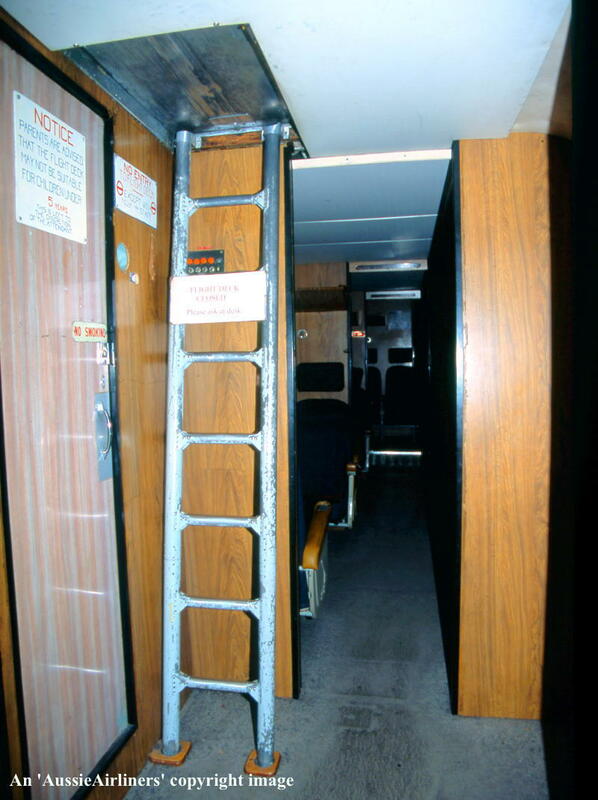 It was also the emergency exit route for passengers. 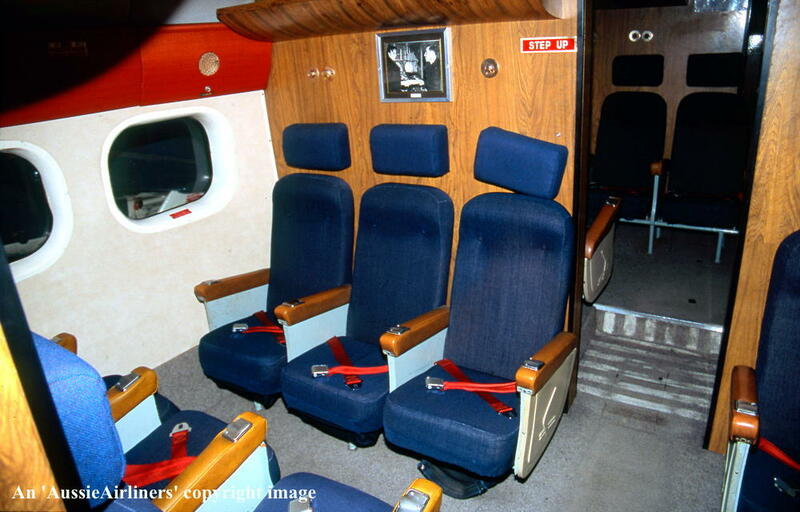 The upper deck cabin - Cabin E - had seating for 14 passengers. 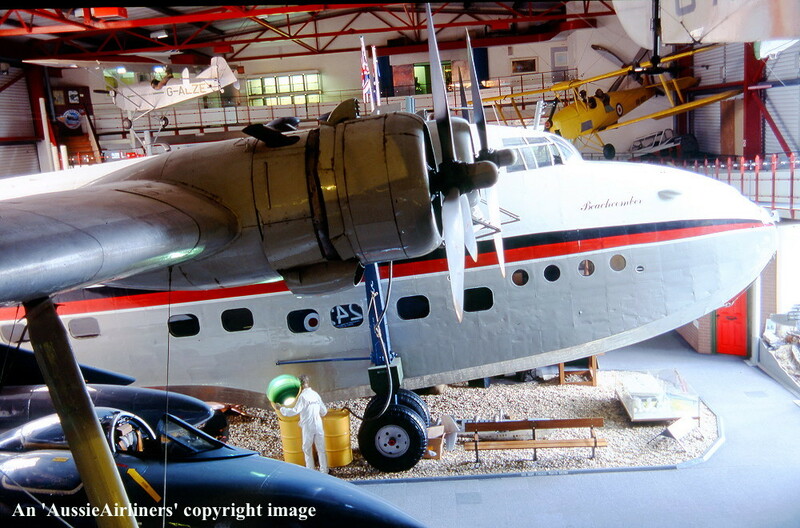 This image was taken from the top of the internal staircase, looking rearwards. 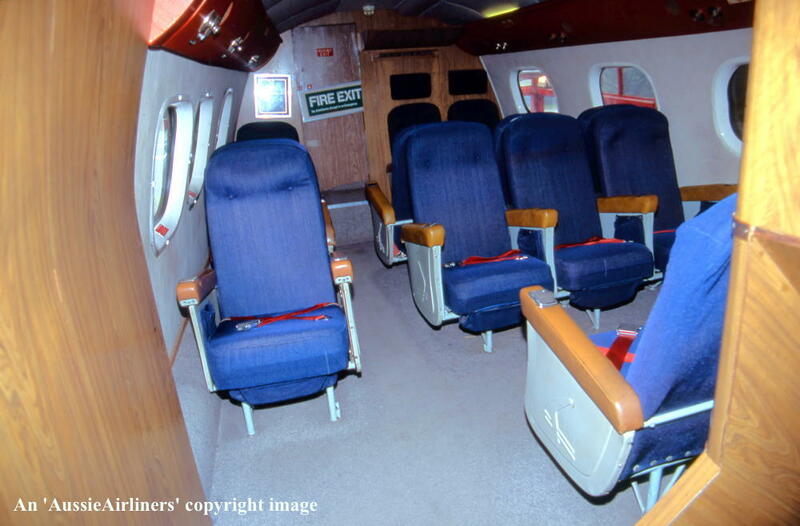 The upper deck cabin - Cabin E - had seating for 14 passengers. 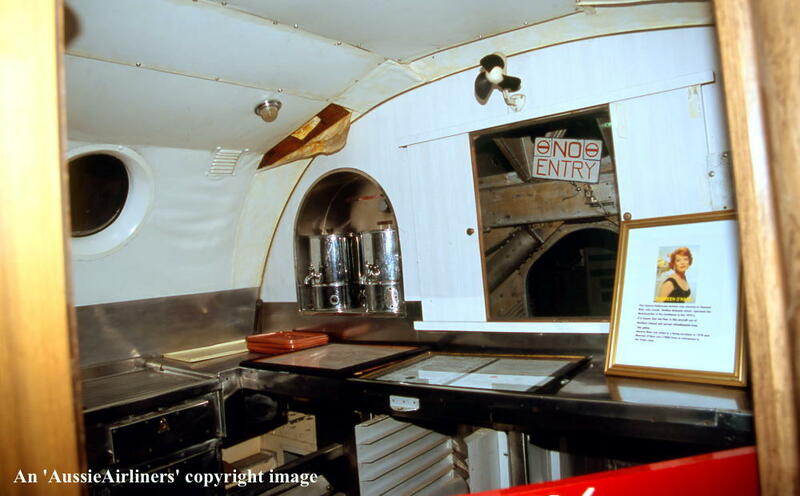 This image was taken from the rear of this cabin, looking forwards to the galley. 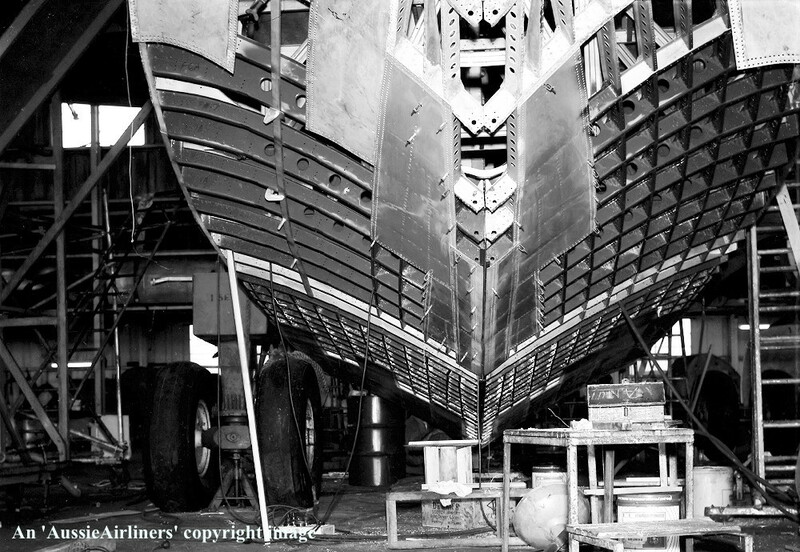 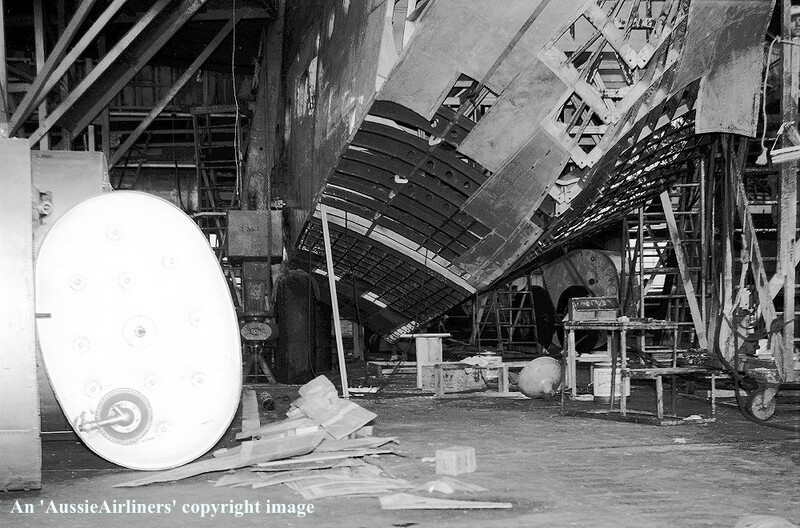 The upper pantry and galley were situated against the wing centre section bulkhead. 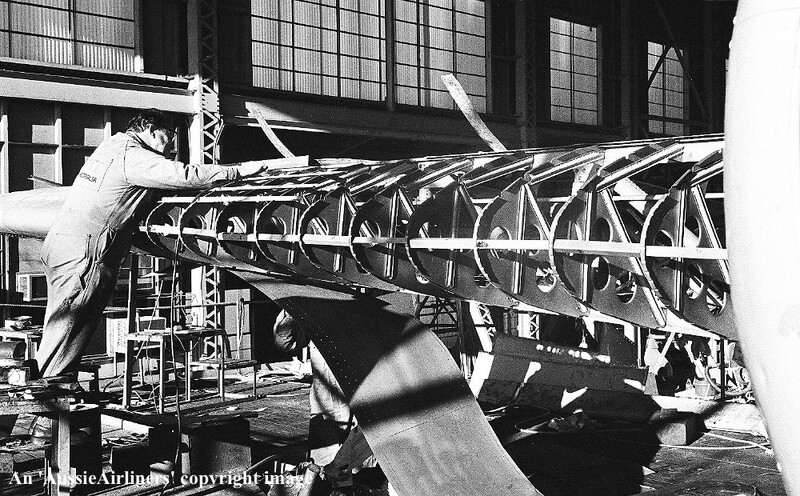 The wing structure could be accessed in flight if necessary. 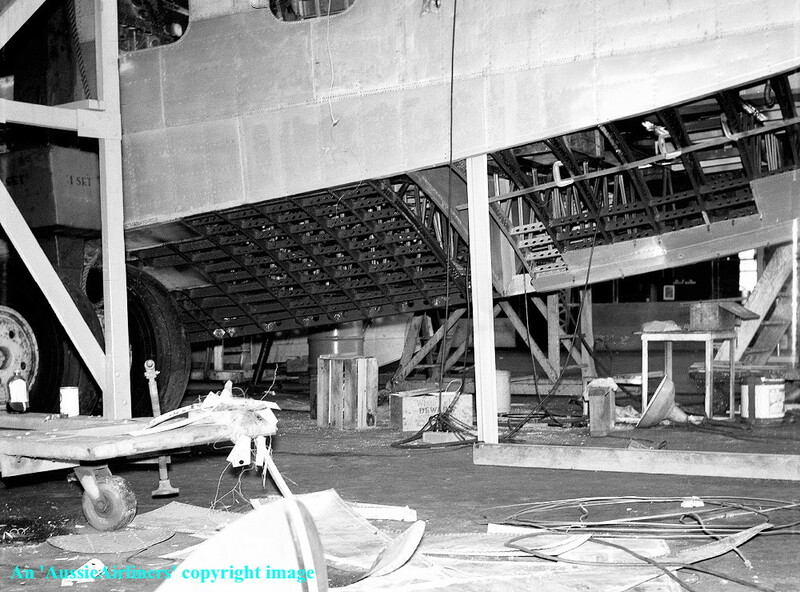 The upper pantry and galley were situated against the wing centre section bulkhead.